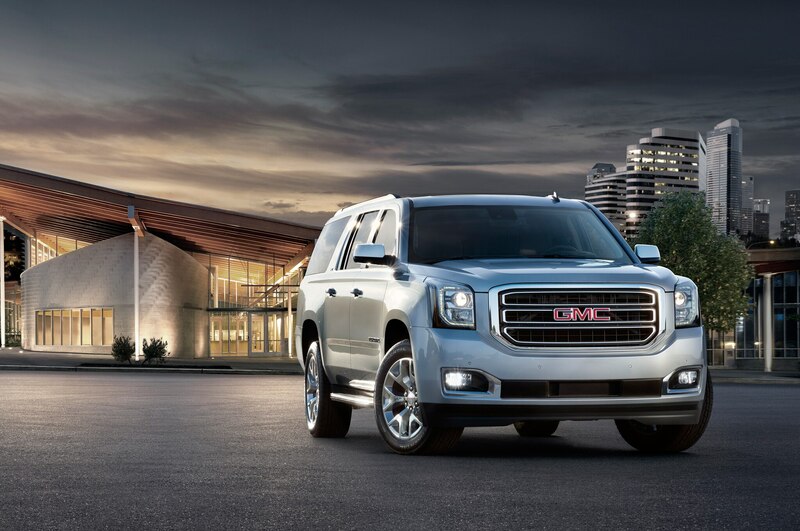 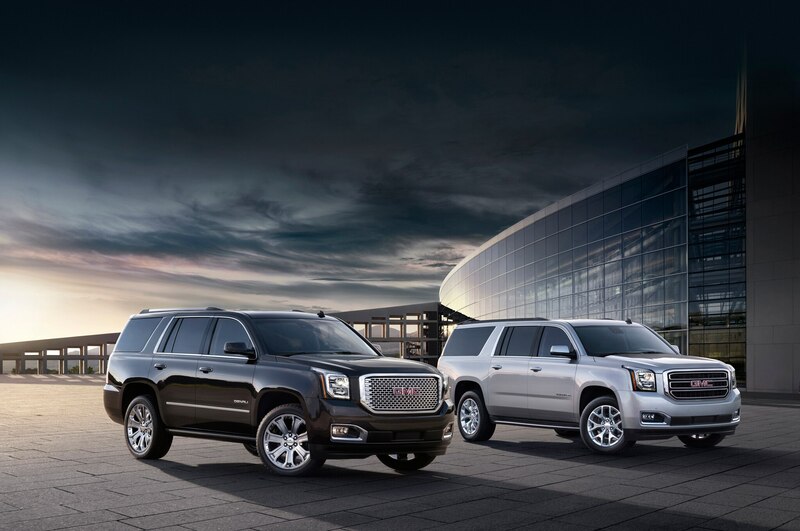 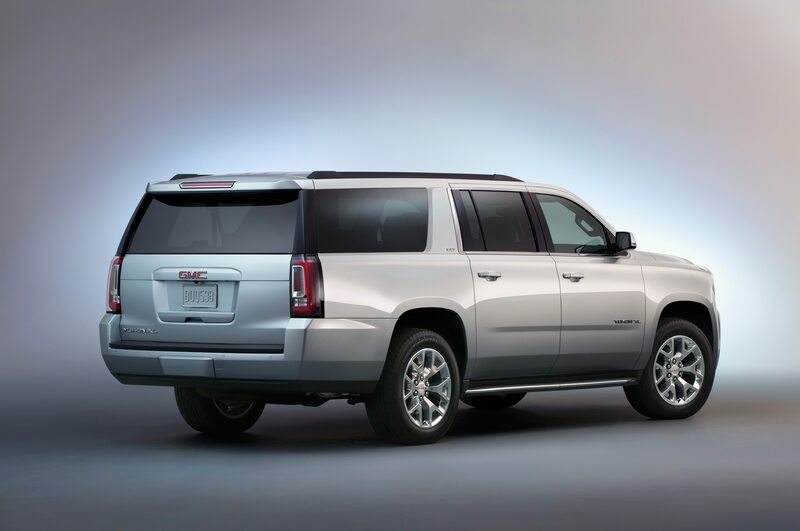 GMC’s Yukon and Yukon XL account for nearly one-third of General Motors’ large-SUV sales, with more than 60,000 units being moved in 2013. 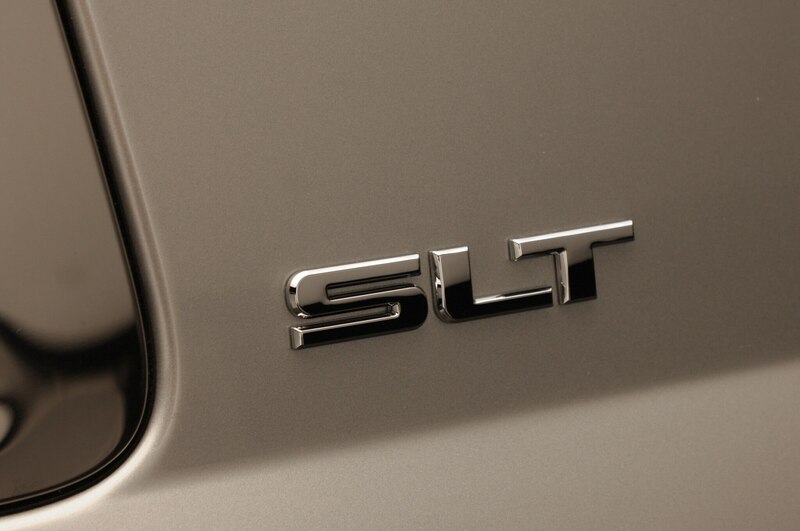 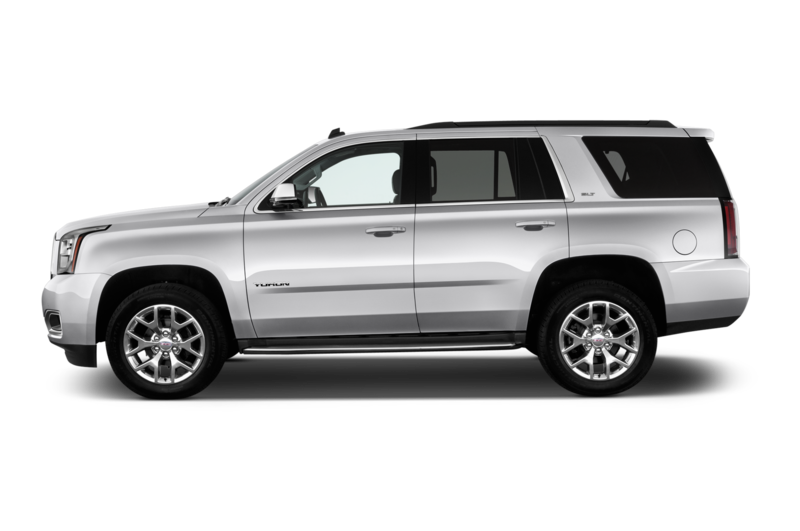 Styling, equipment, and pricing separate the GMCs from their Chevrolet Tahoe and Suburban siblings. 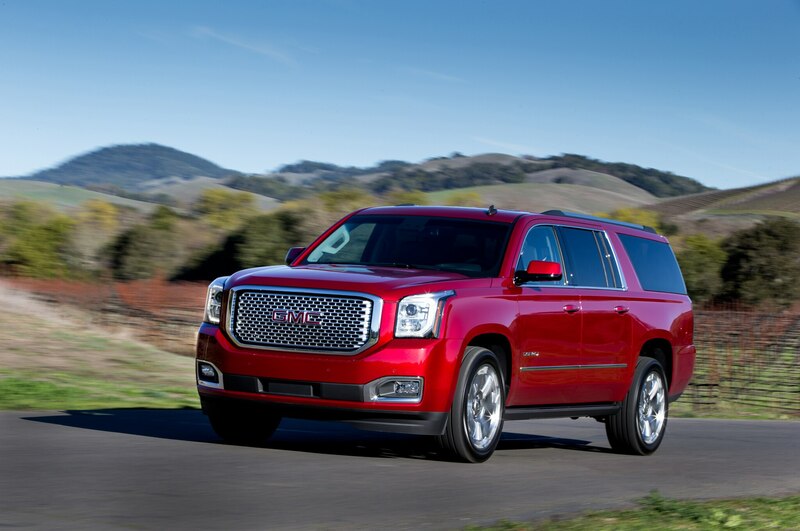 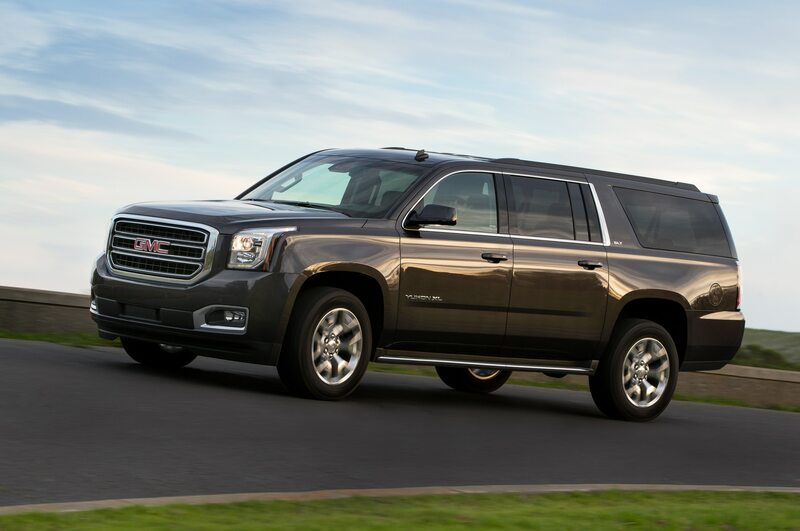 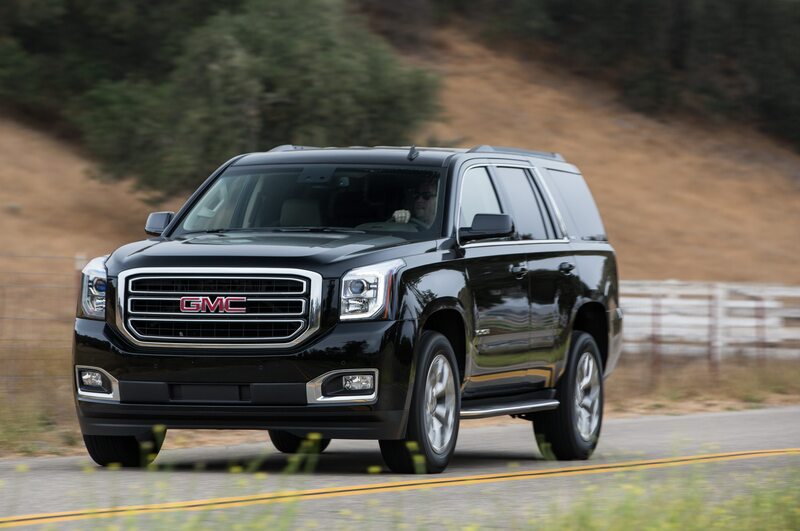 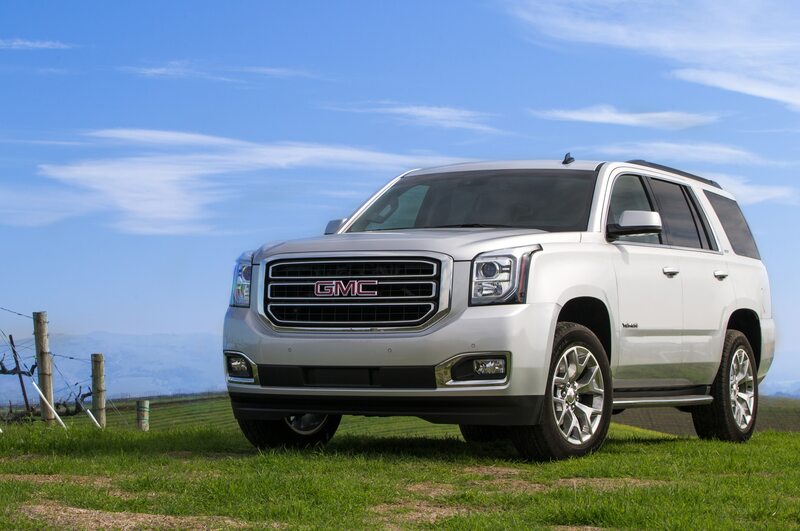 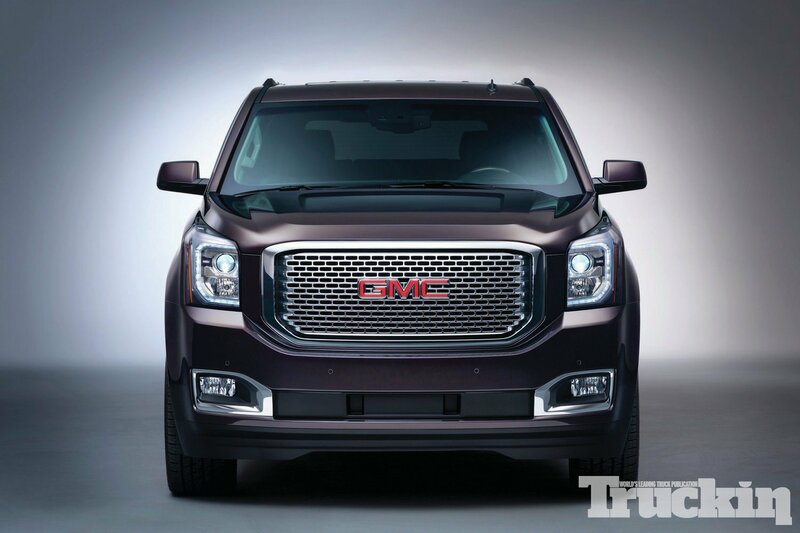 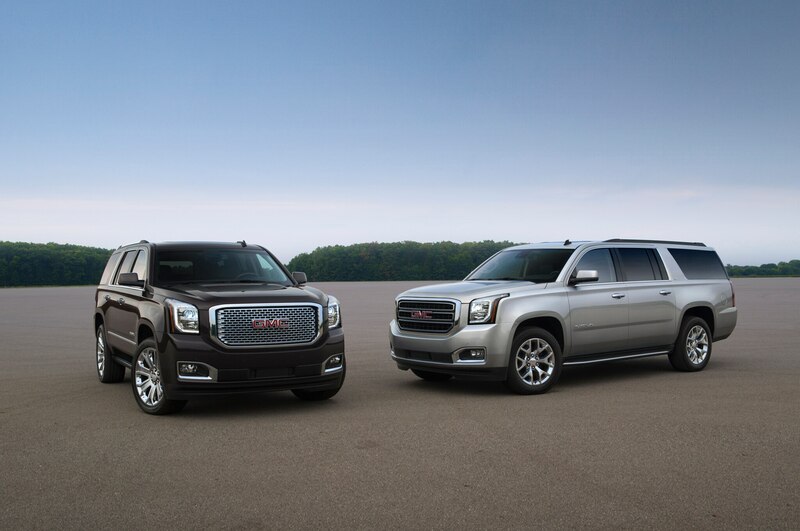 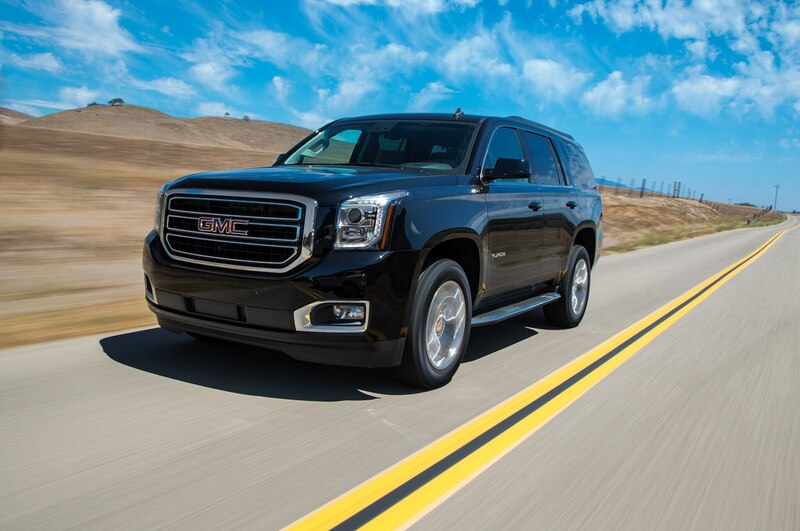 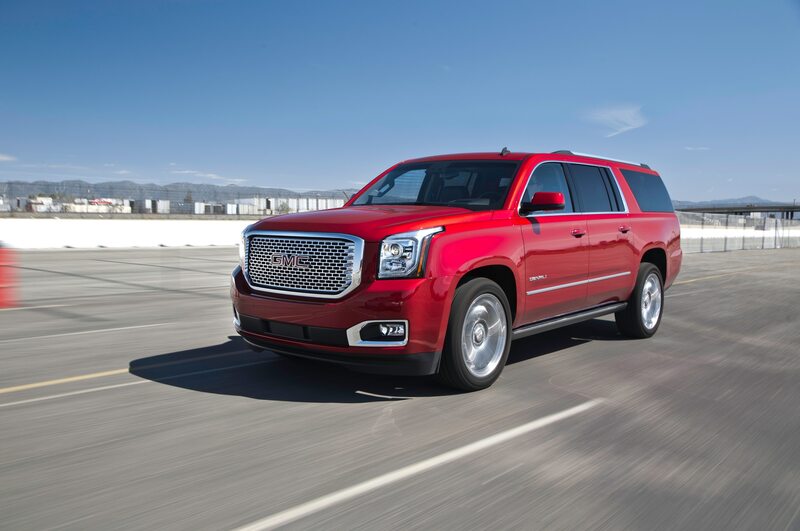 Like them, the 2015 GMC Yukon and Yukon XL have just undergone their first redesign since 2007, one that see these big SUVs grow bigger, better, and more expensive. 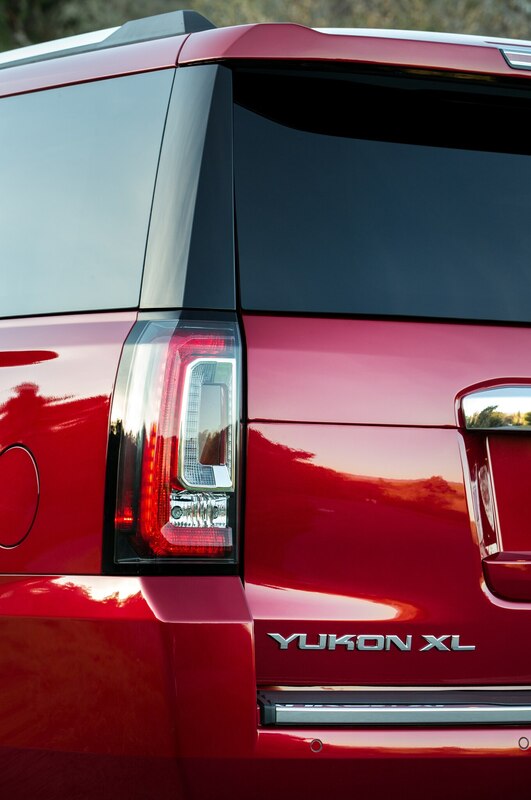 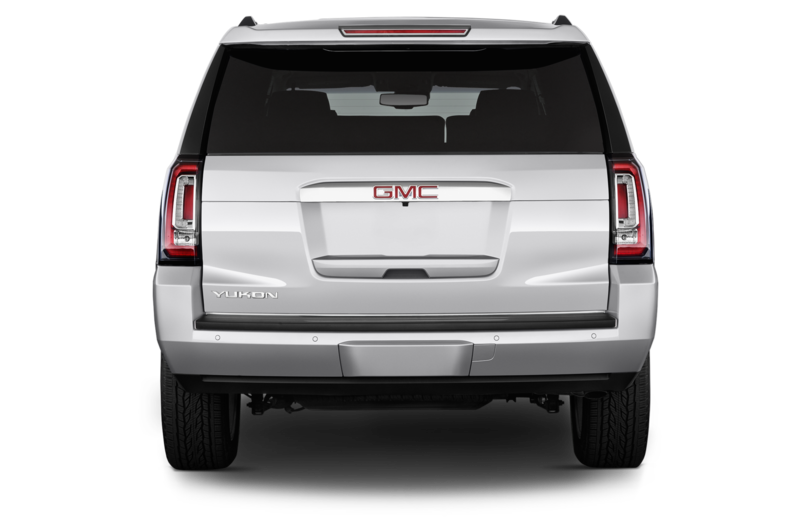 Only one version of the Yukon has XL in its name, but it’s an apt descriptor for both. 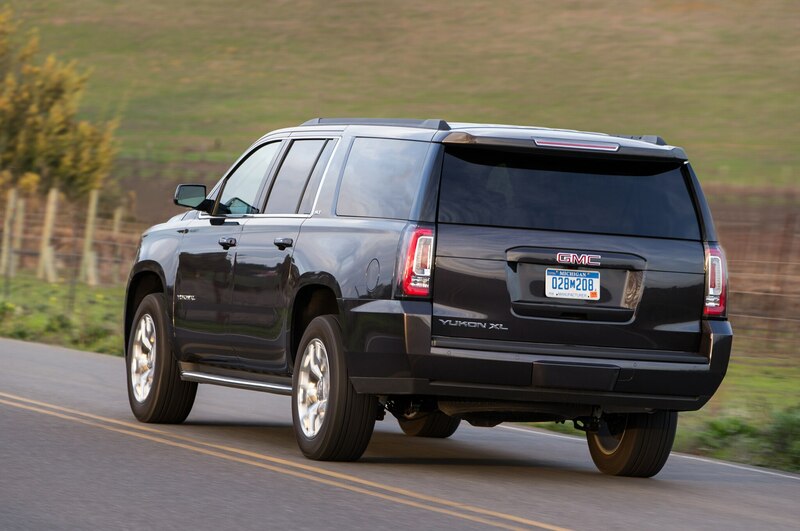 The standard-wheelbase Yukon, like its Chevrolet Tahoe doppelganger, rides once again on a 116-inch wheelbase. 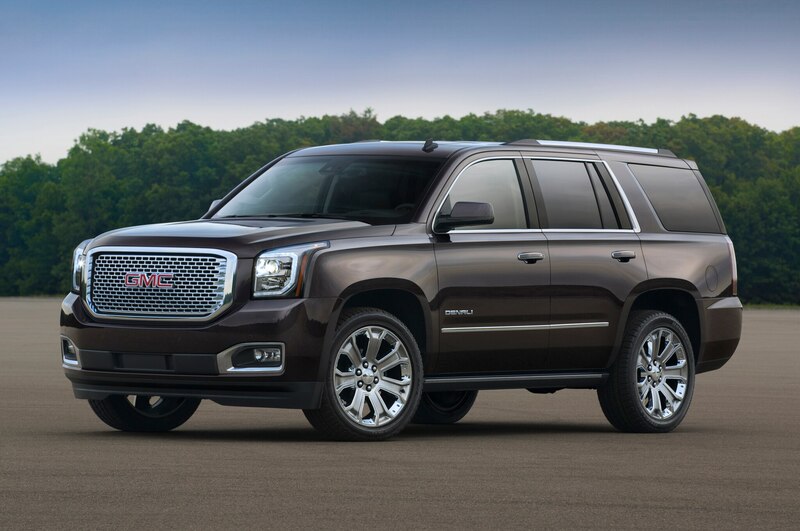 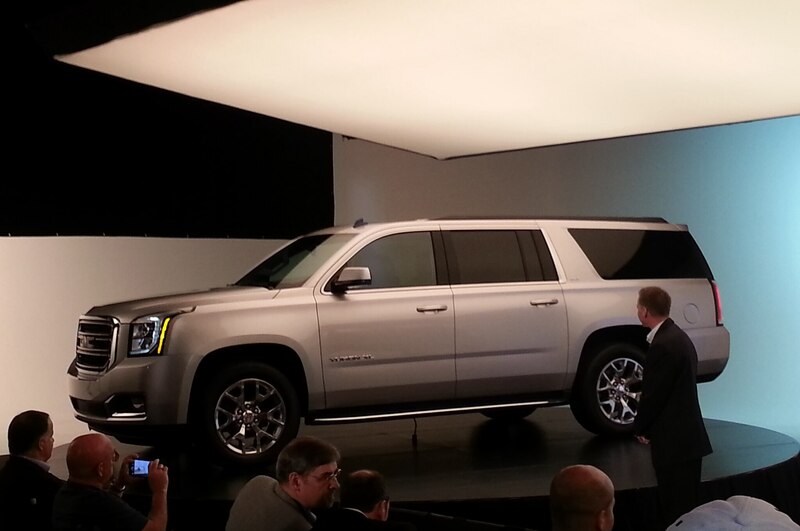 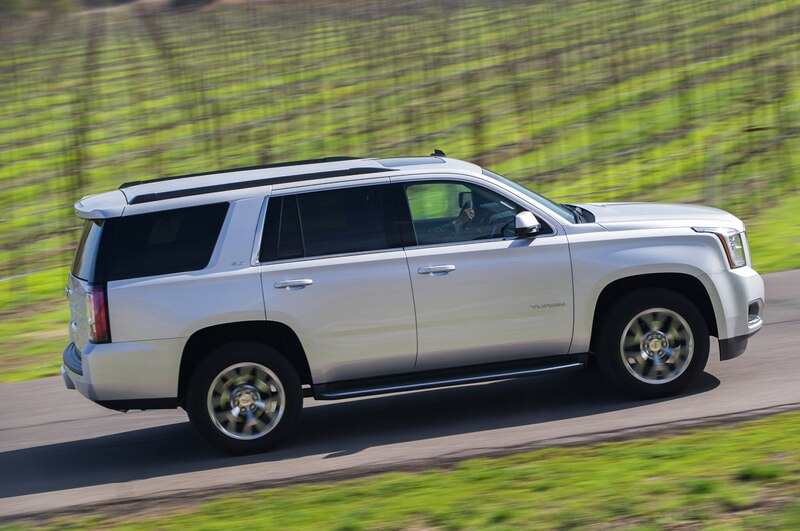 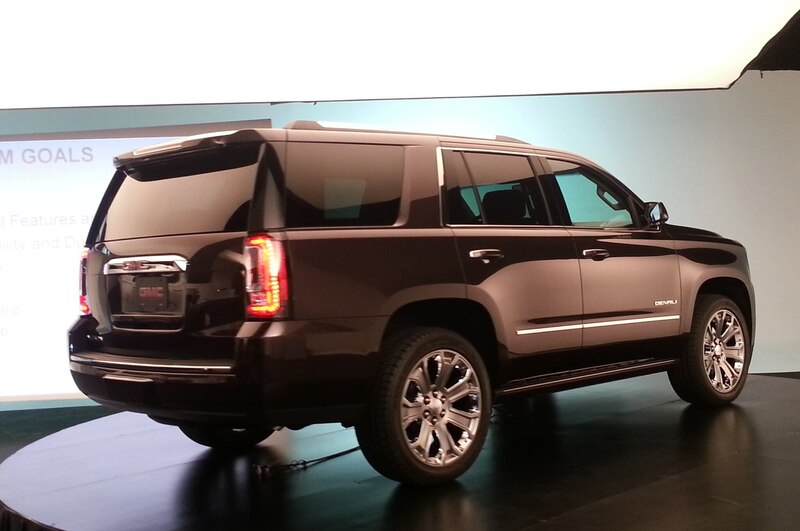 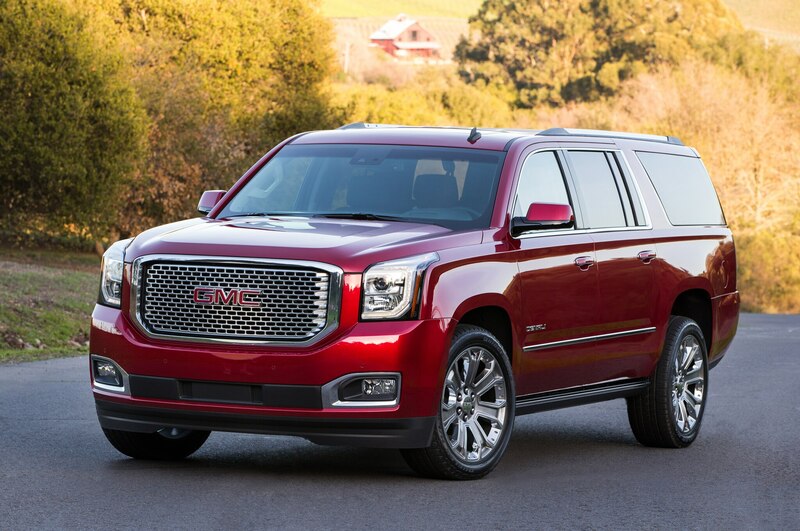 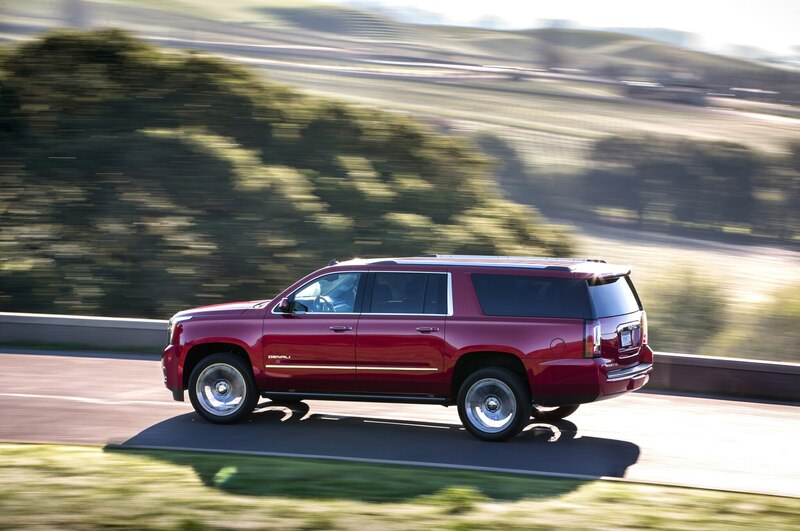 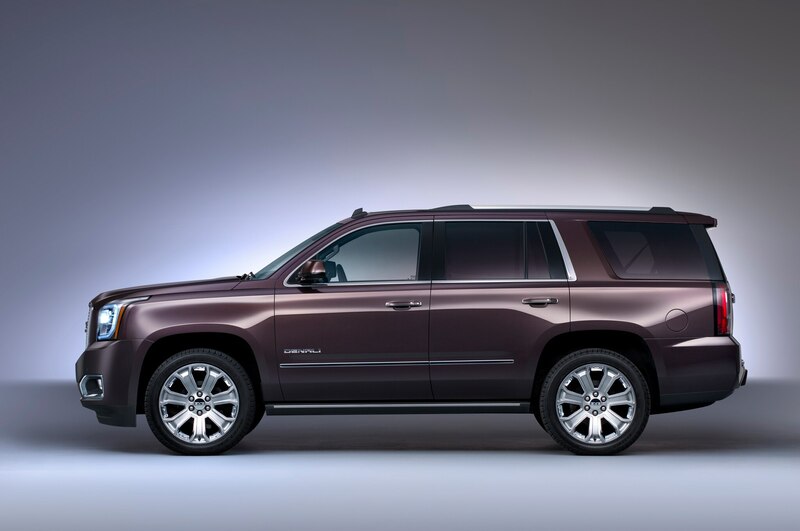 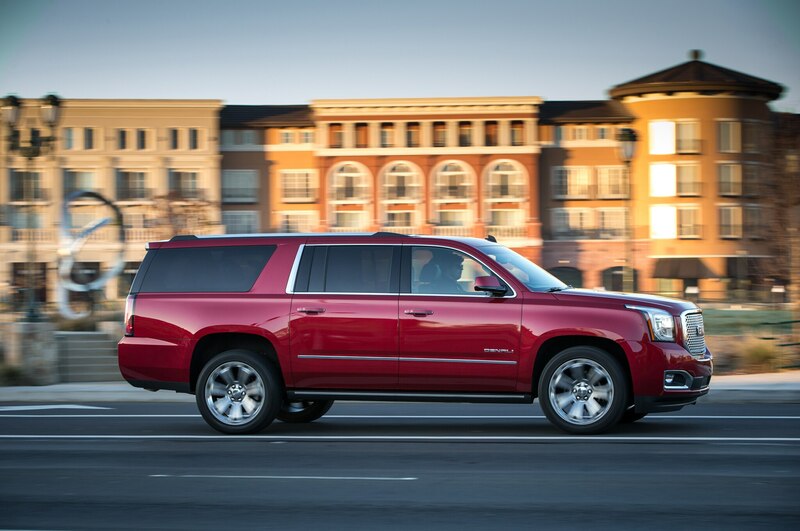 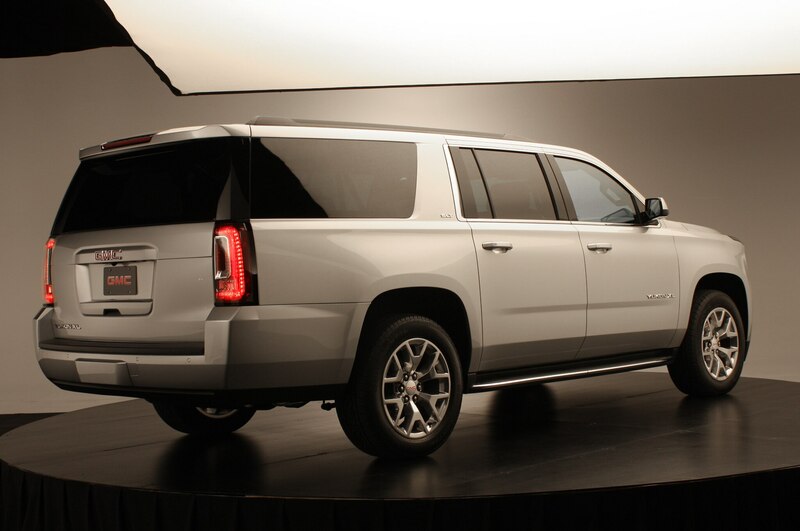 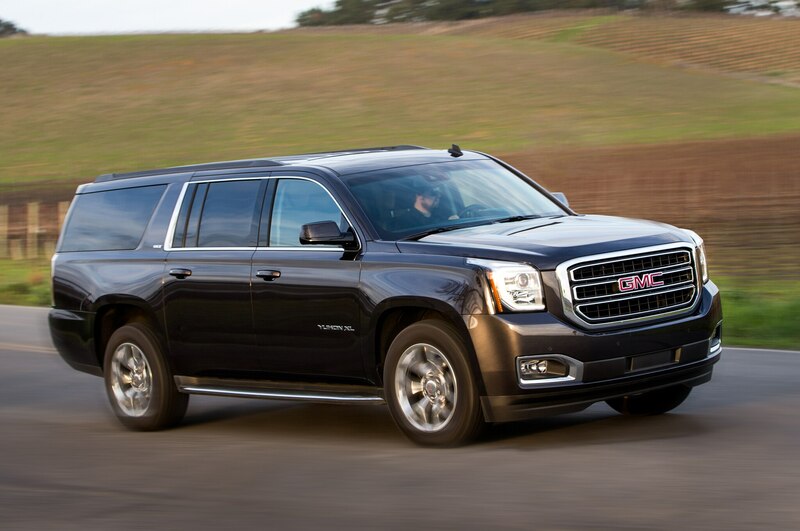 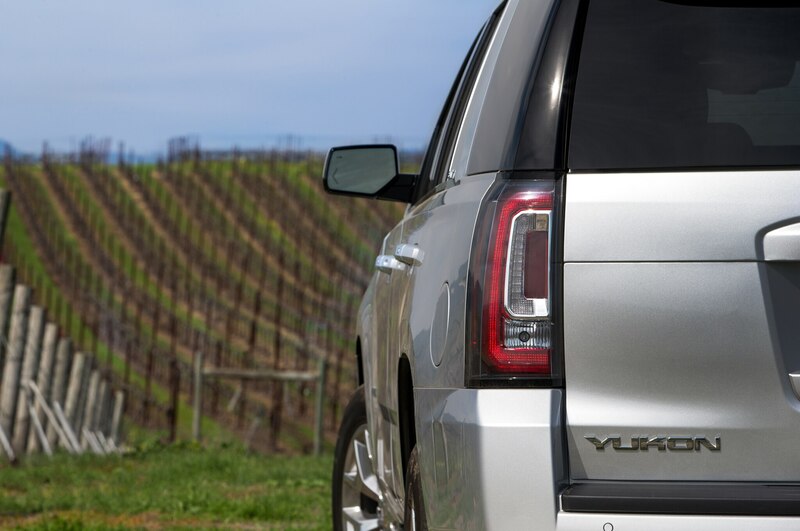 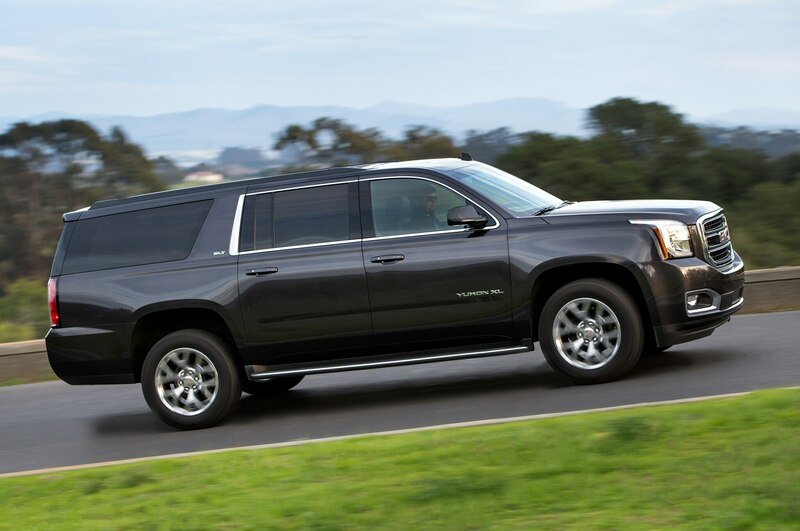 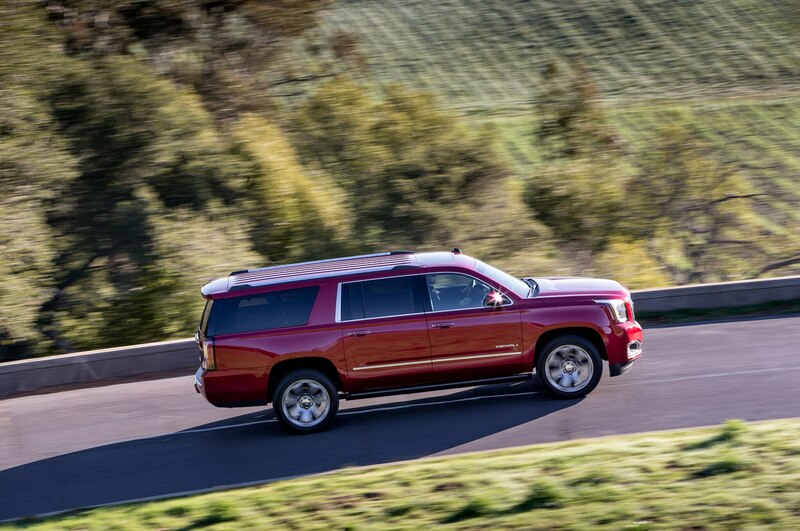 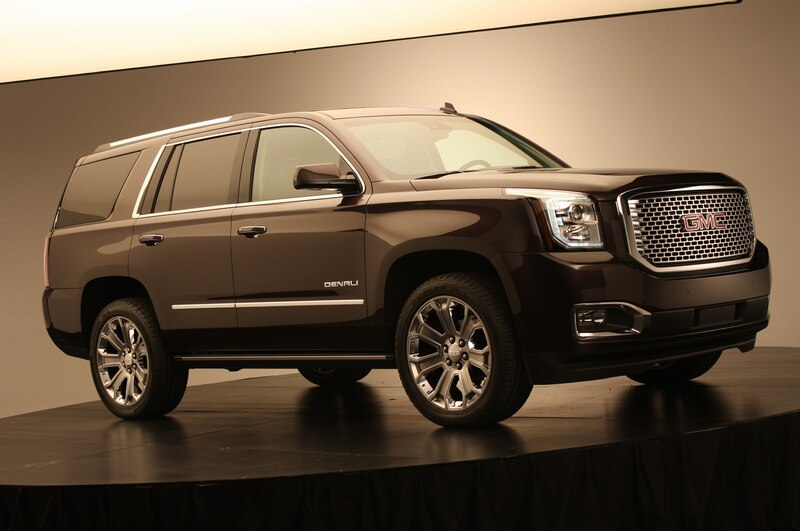 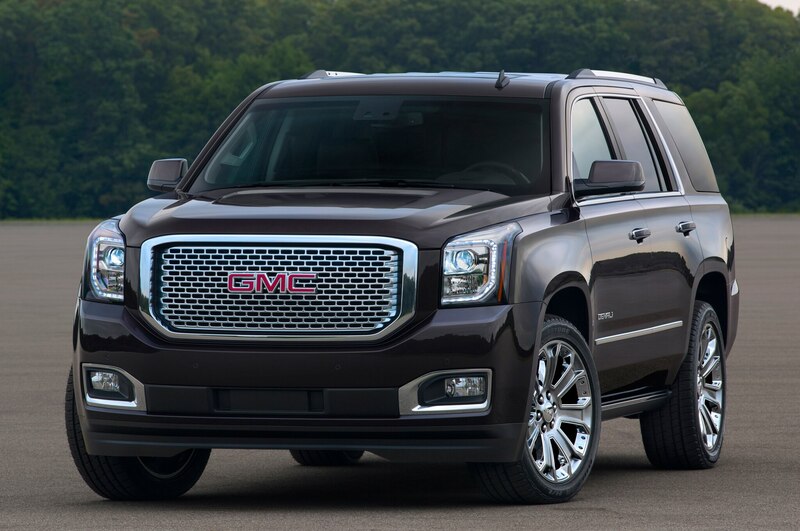 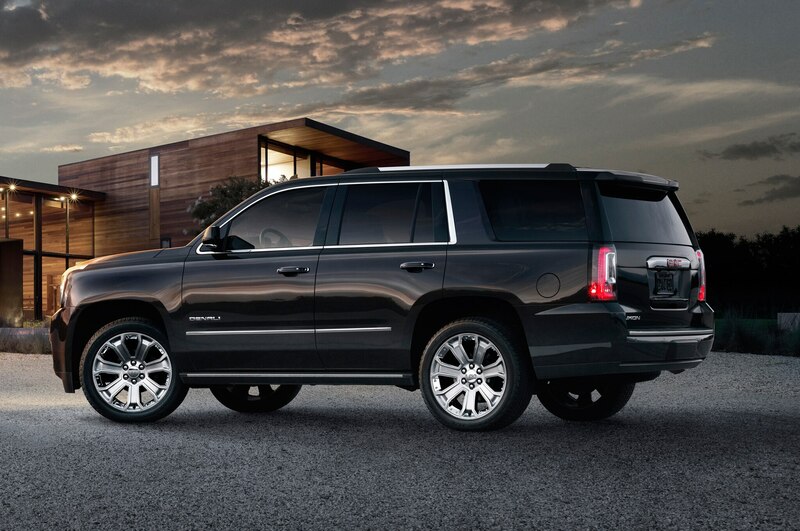 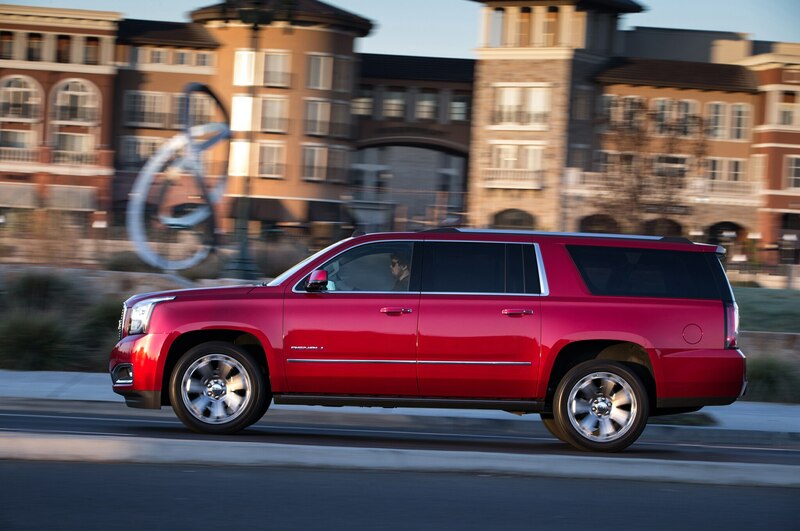 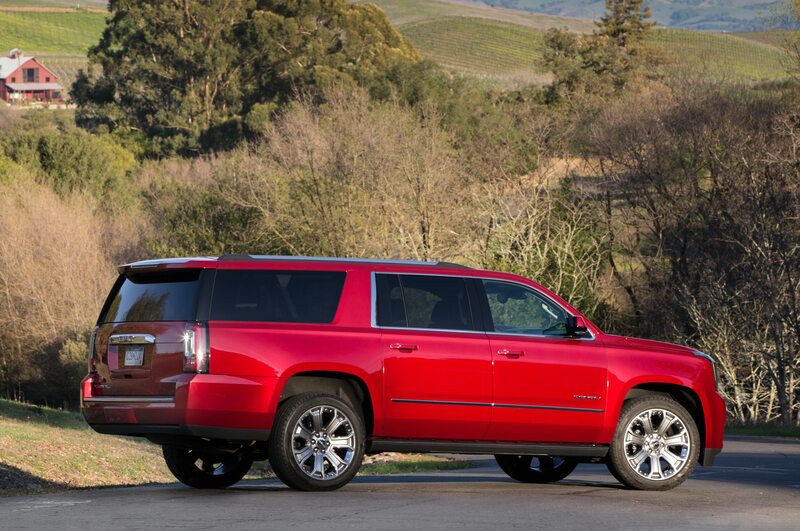 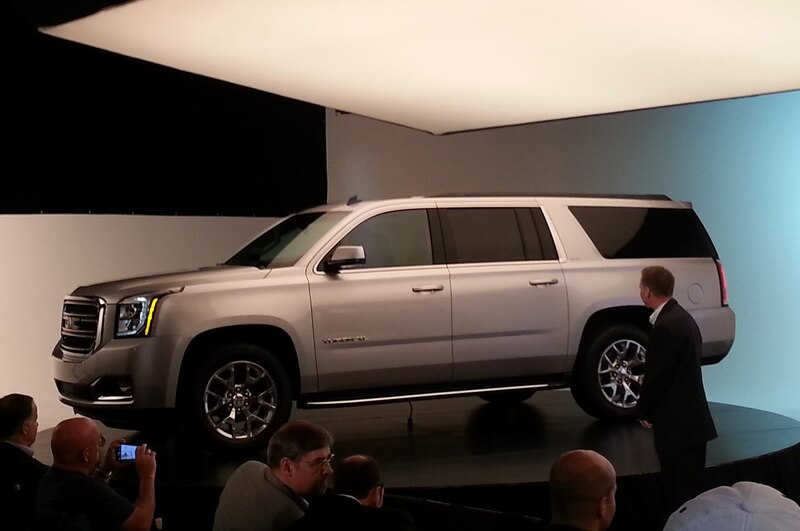 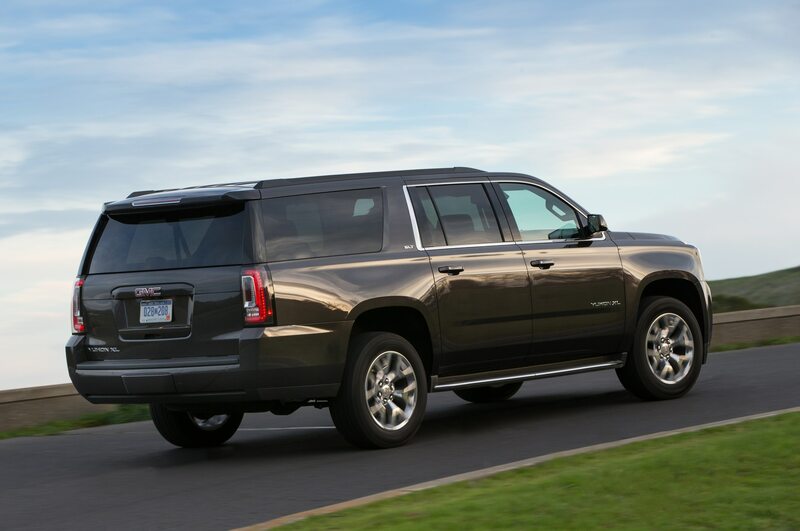 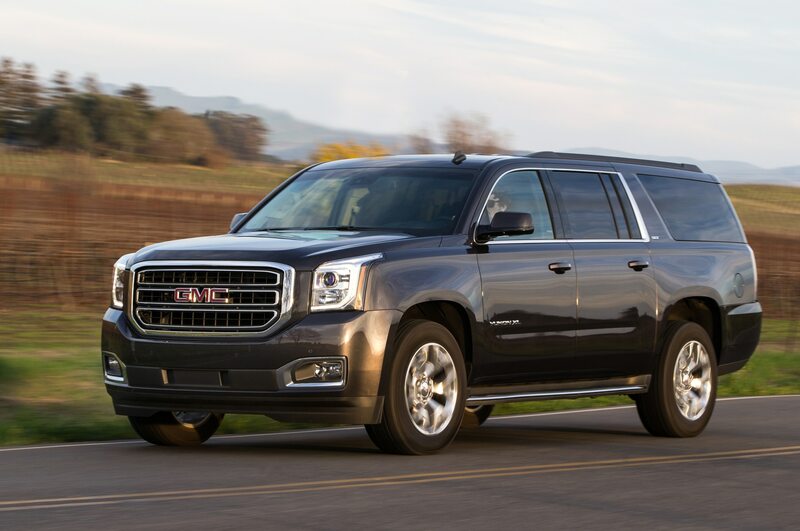 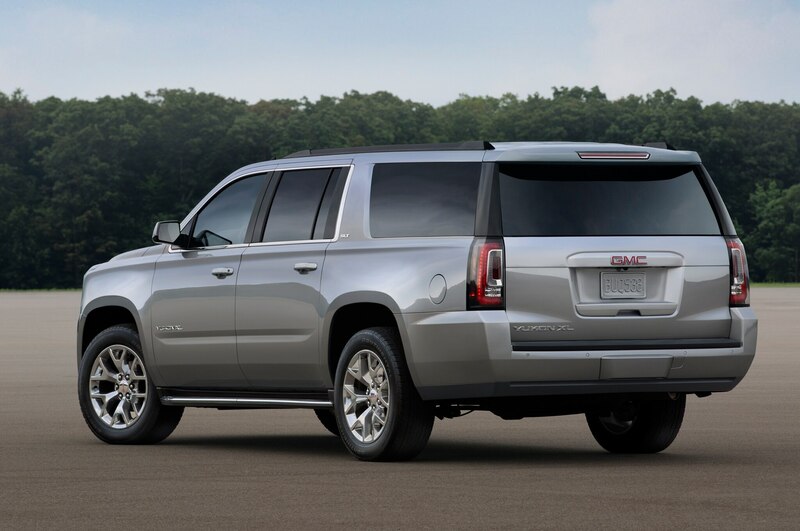 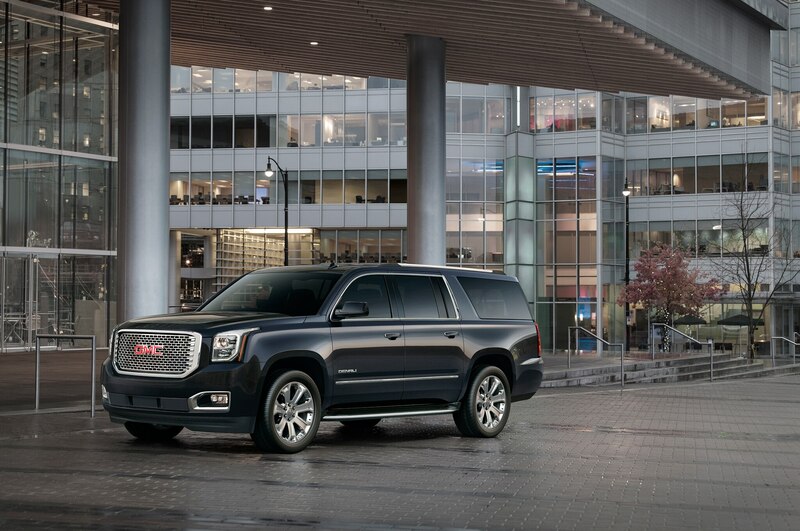 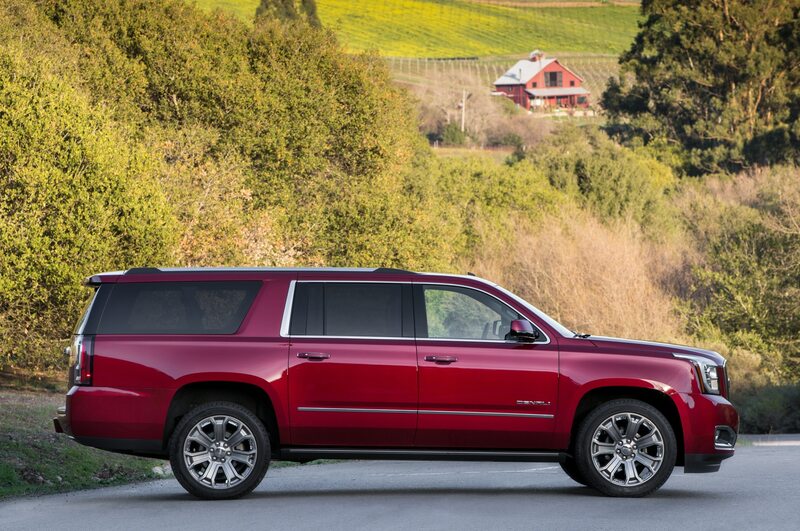 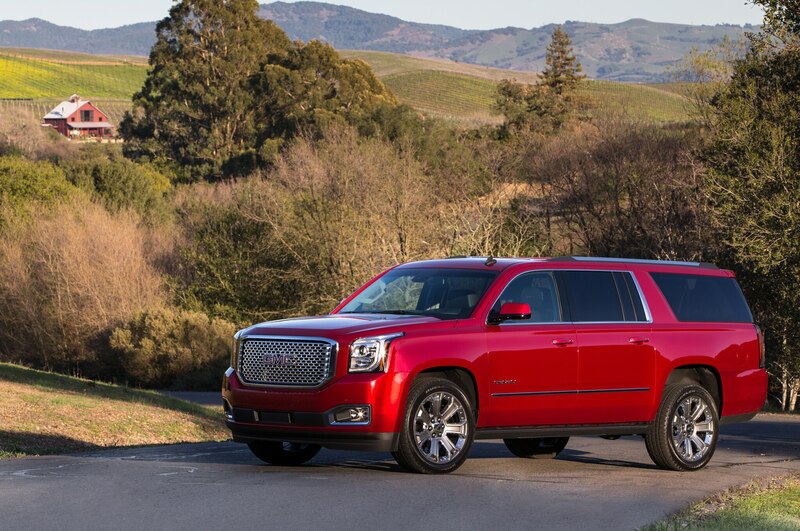 Sitting astride a 130-inch wheelbase is the even more grandly proportioned Yukon XL, née Suburban. 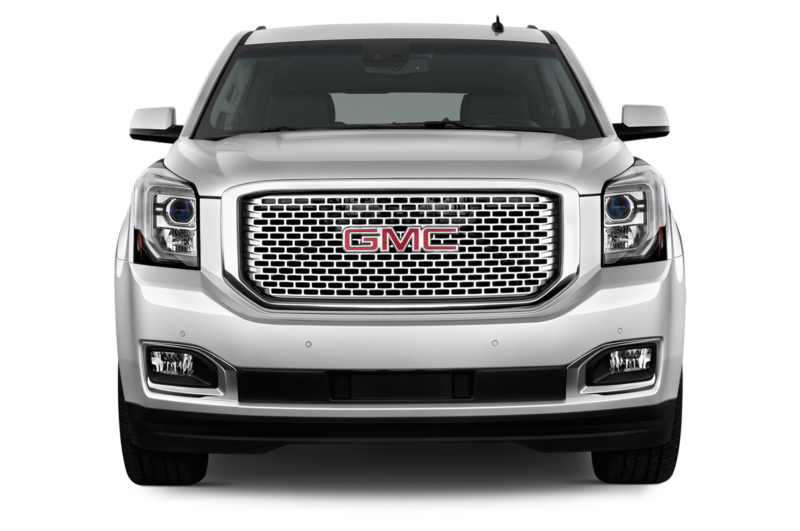 New styling with freshly creased sheetmetal, square-cornered windows, and a towering grille make these trucks look even more massive than before, and indeed both variants now stretch an additional two inches from stem to stern and are an inch and a half wider. 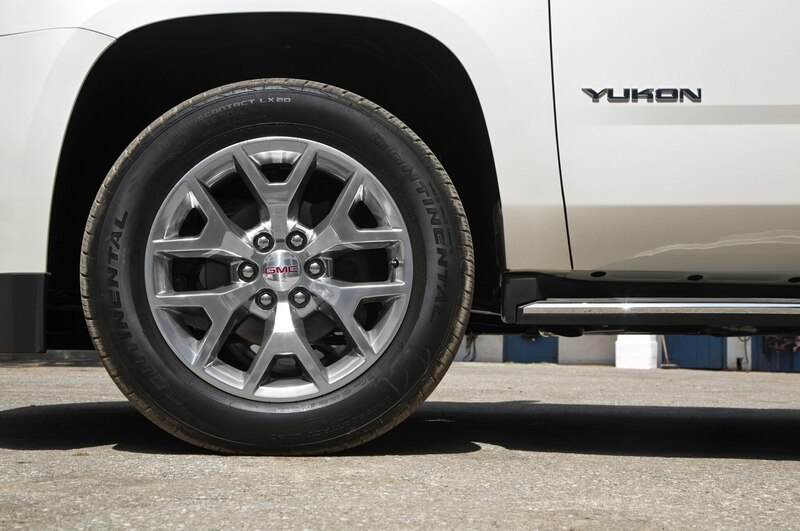 The pursuit of aerodynamics, however, has them crouching 2.5 inches lower, at just over 6 feet, 2 inches. 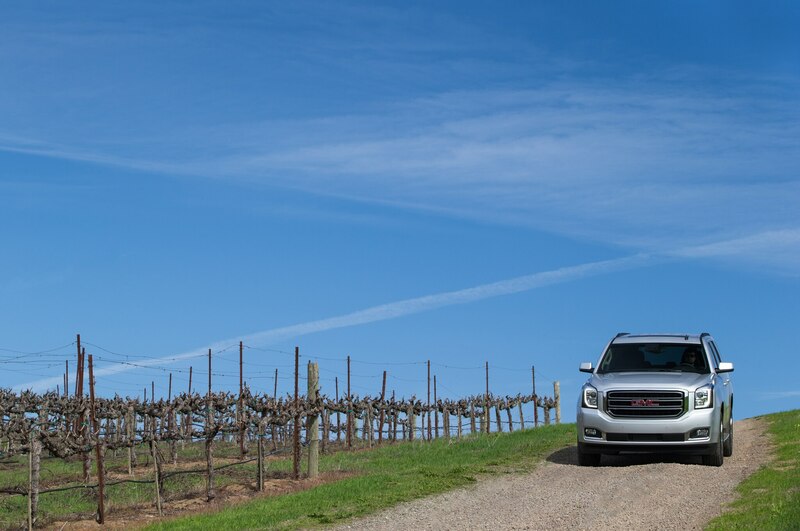 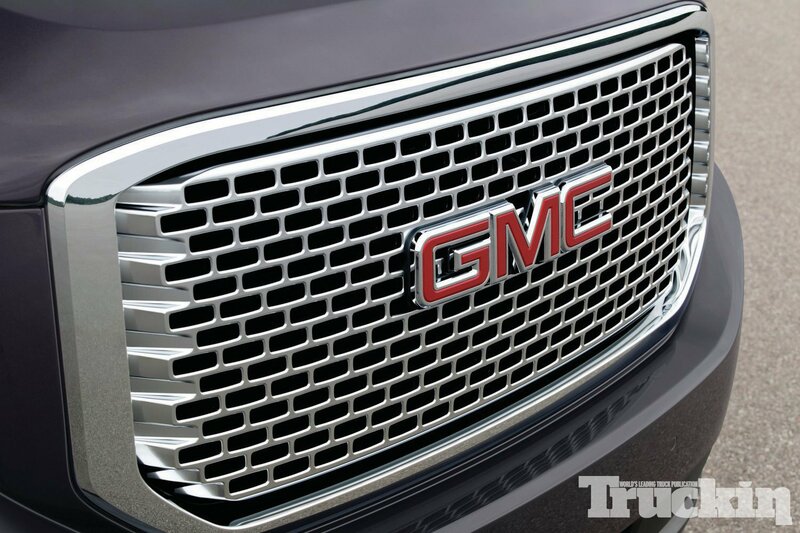 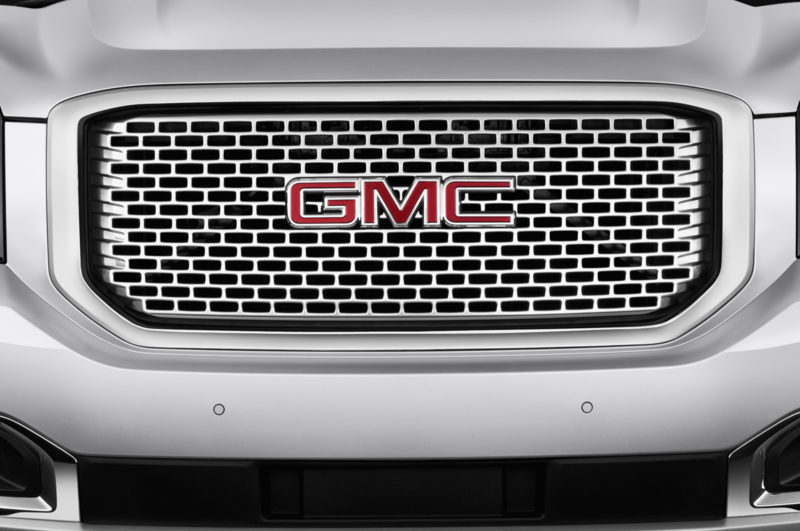 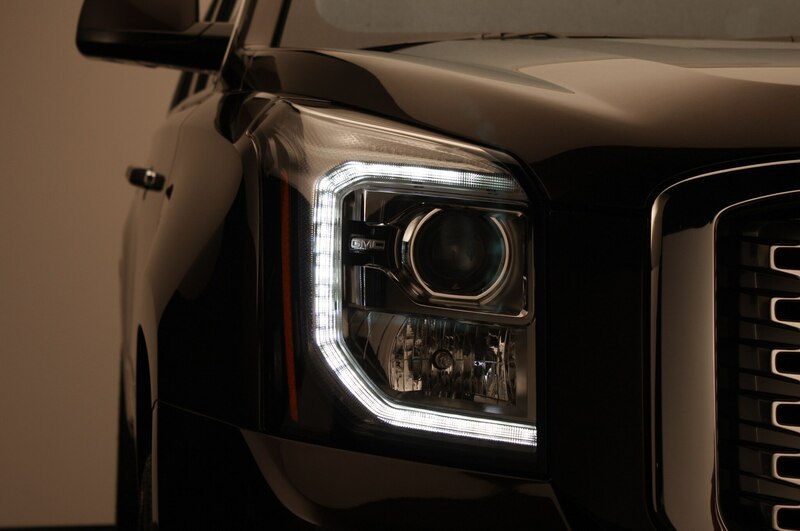 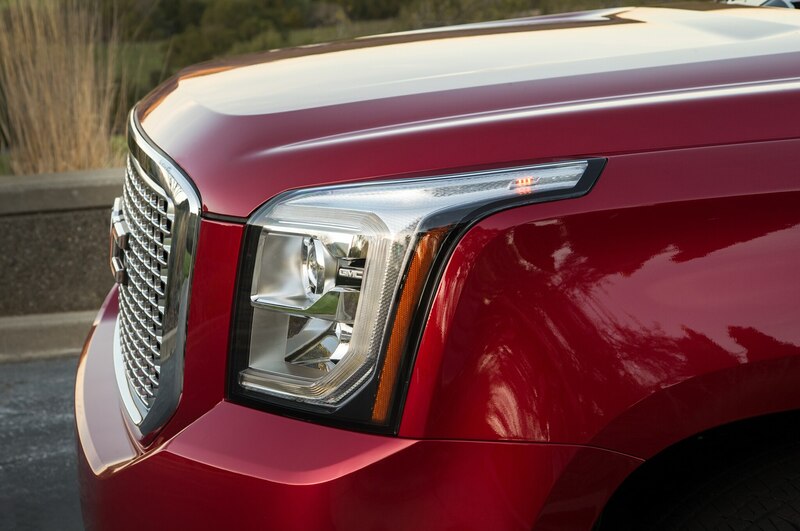 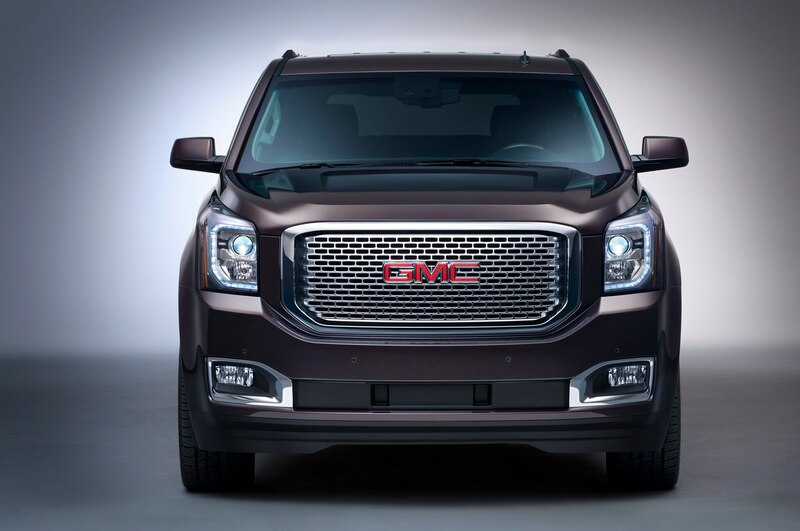 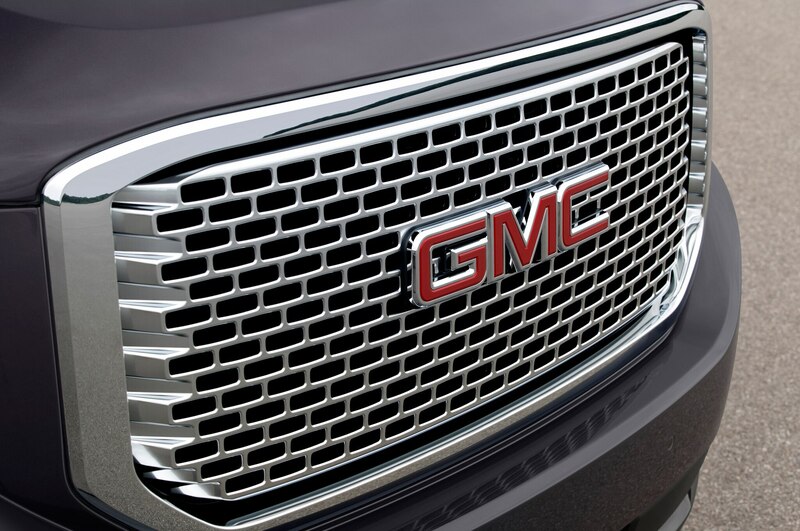 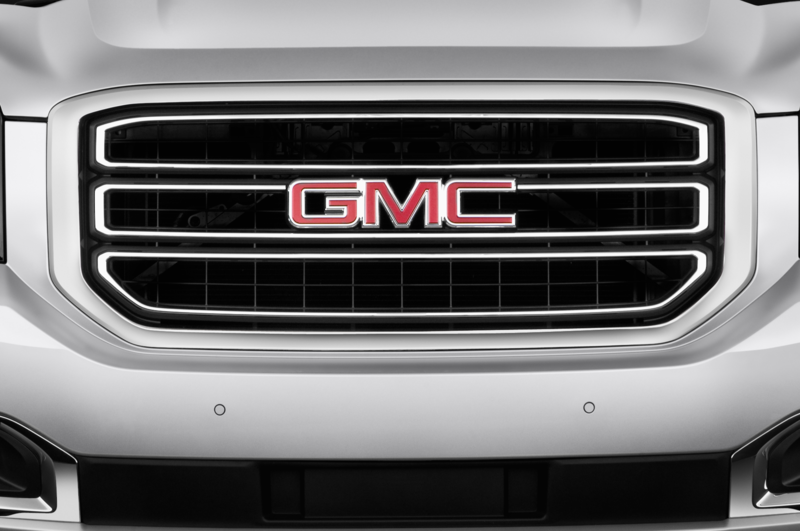 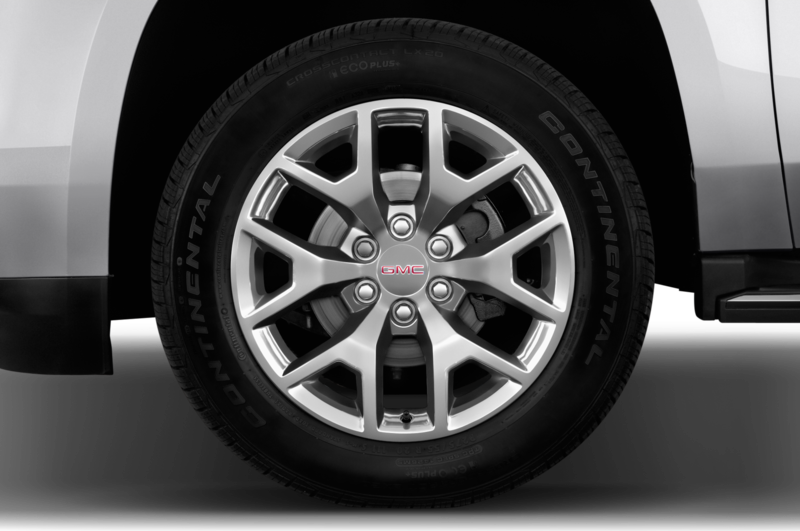 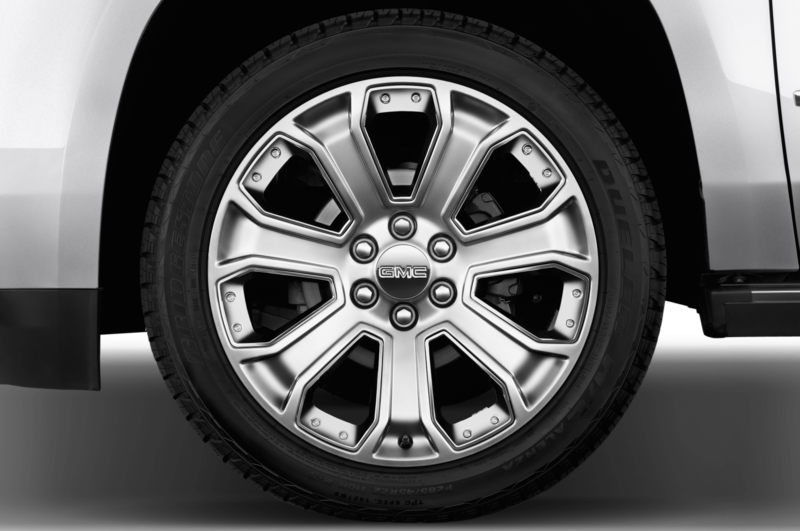 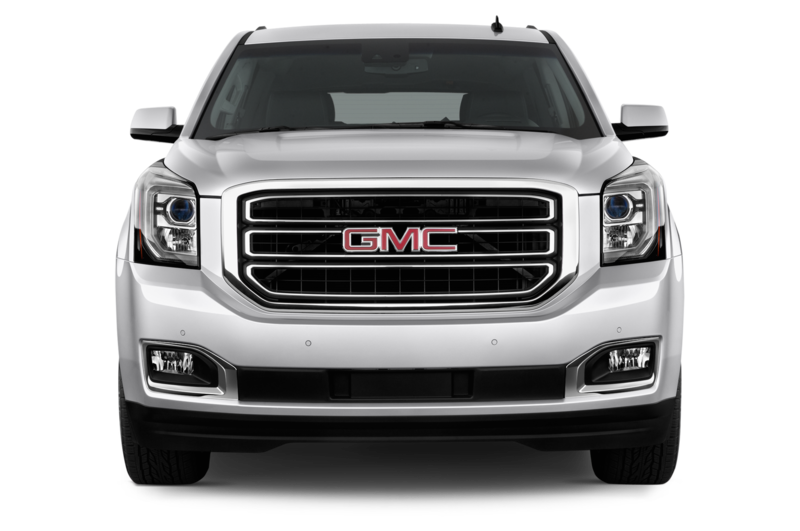 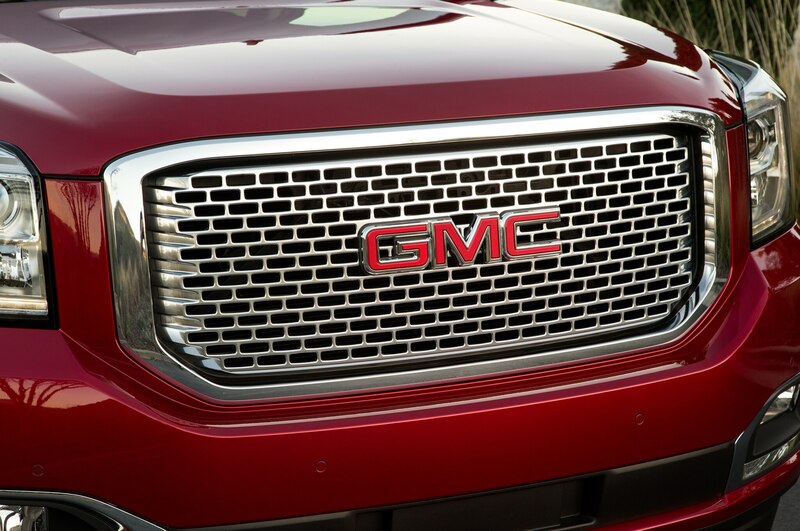 GMC’s exterior design distinctions from its Chevrolet siblings include its hood, front fenders, grille, wheels (sizes 18, 20, and 22 inches), headlamps, and taillights. 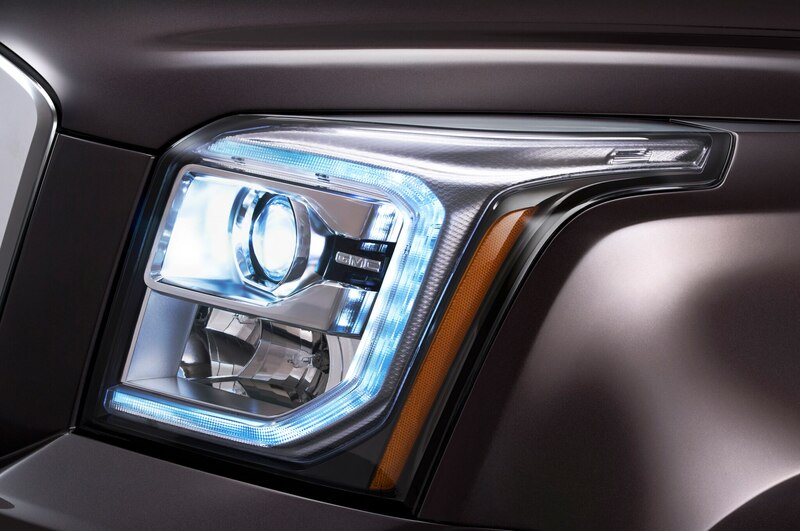 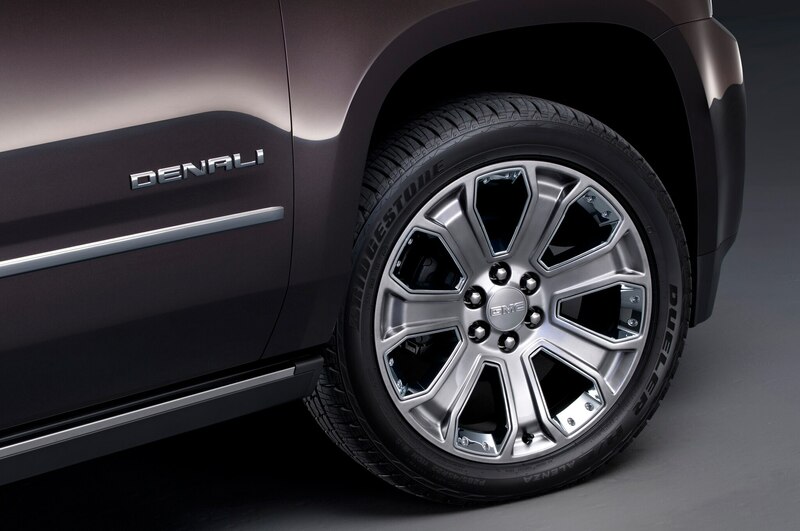 The top-spec Denali versions get their own unique chrome mesh grille, HID headlights, Denali-specific 20-inch wheels, and illuminated power-retractable running boards. 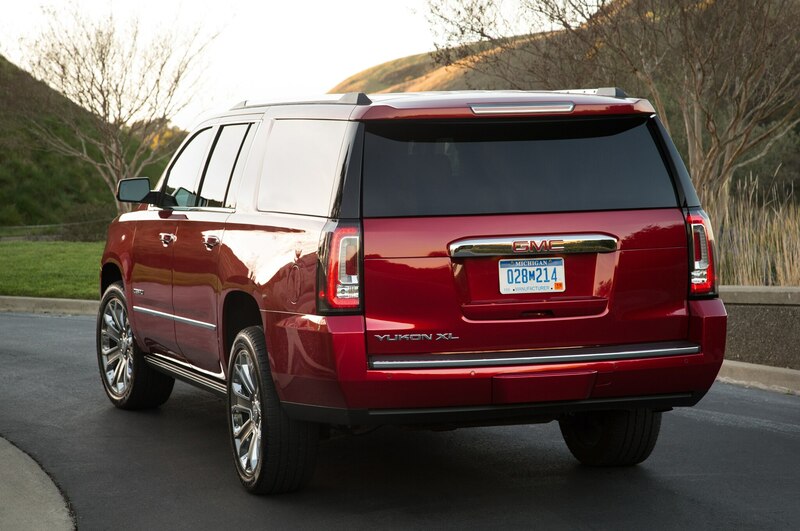 The Yukon is again powered by normally aspirated V-8 engines of 5.3 or 6.2 liters. 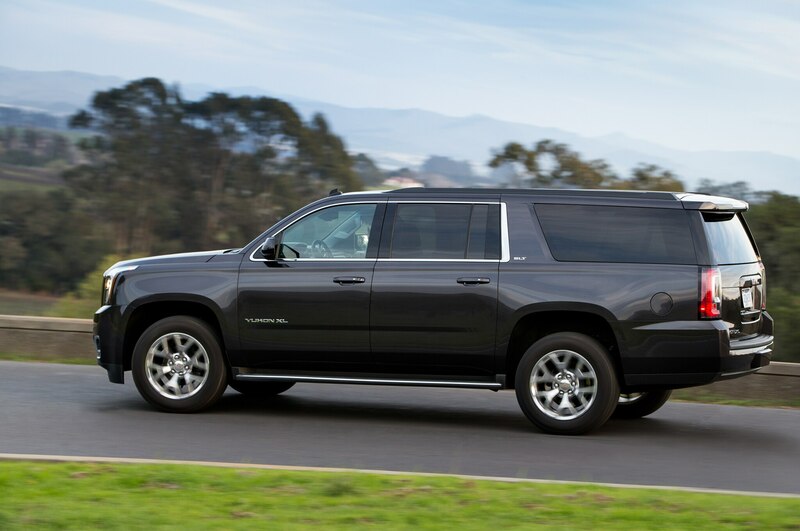 Although their displacements are the same as in the previous Yukon, these engines have been redesigned and now incorporate direct injection, variable valve timing, and what GM calls active fuel management (the ability to switch off four cylinders under light load to save fuel). 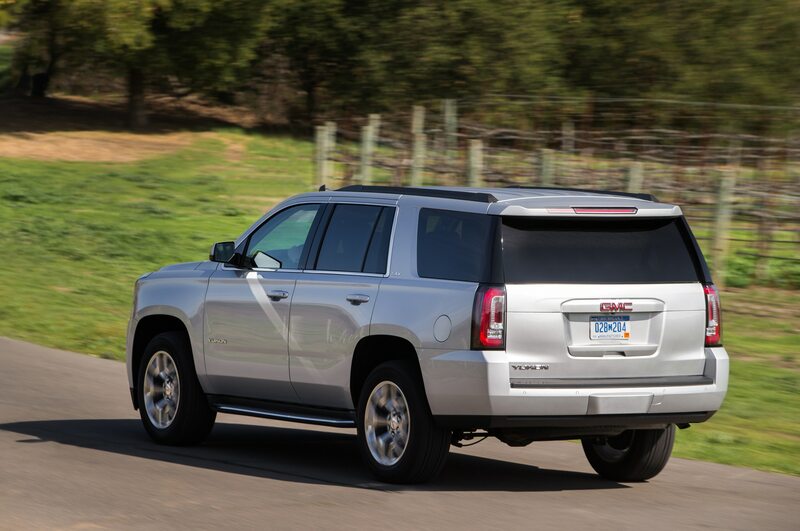 EPA figures improve by 1 or 2 mpg for most models: With rear-wheel drive, the 5.3-liter delivers 16 mpg city/23 mpg highway. 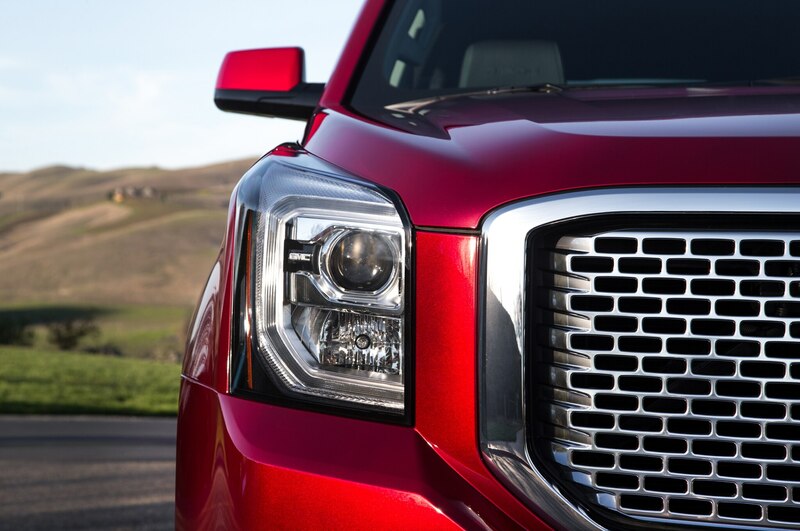 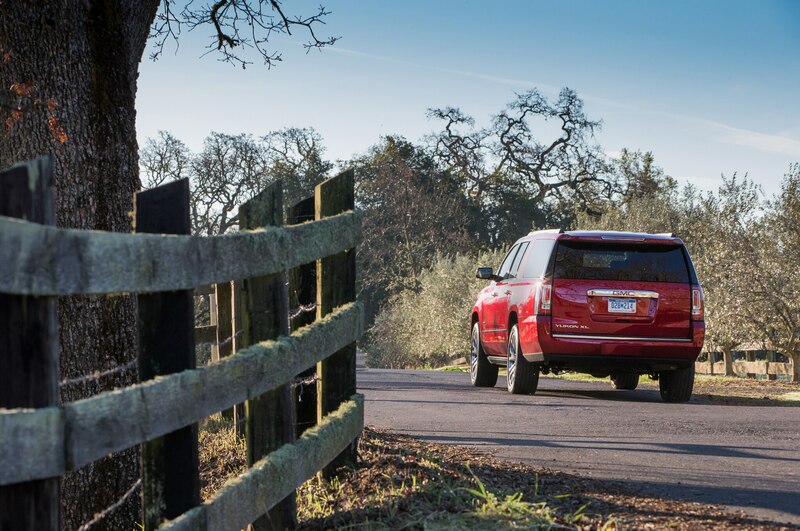 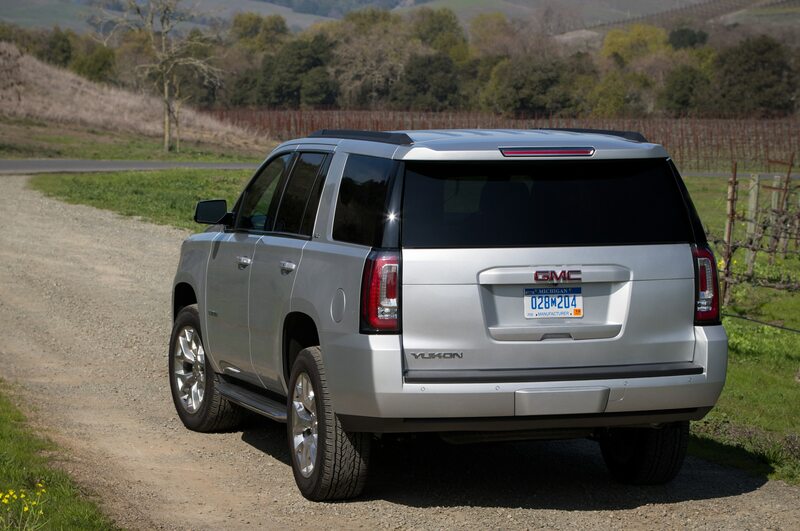 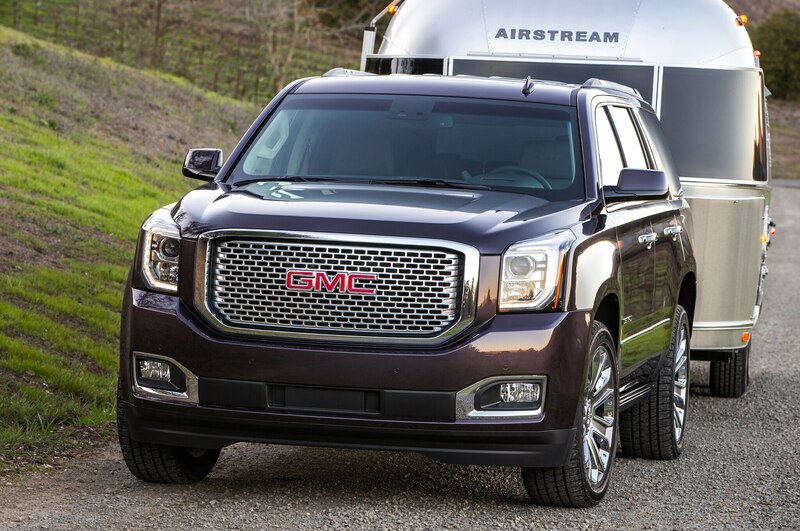 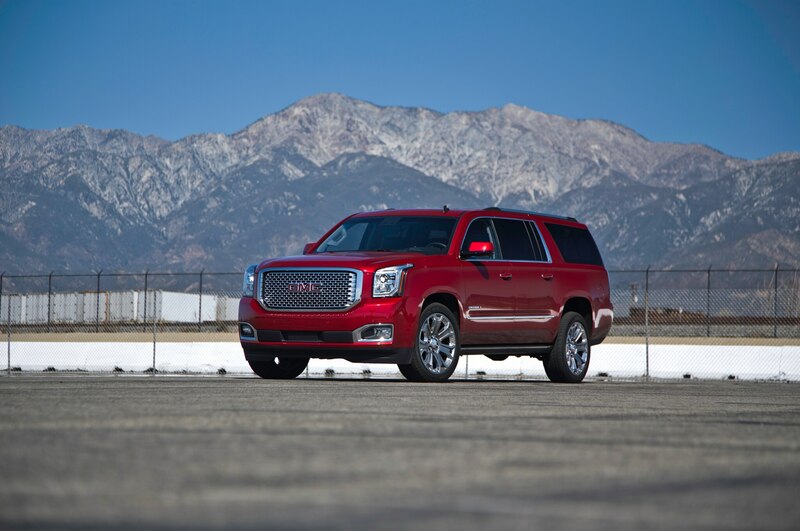 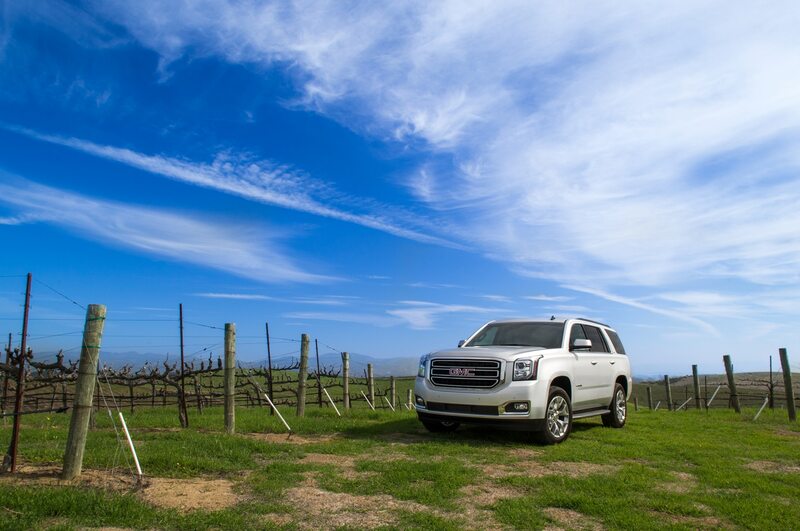 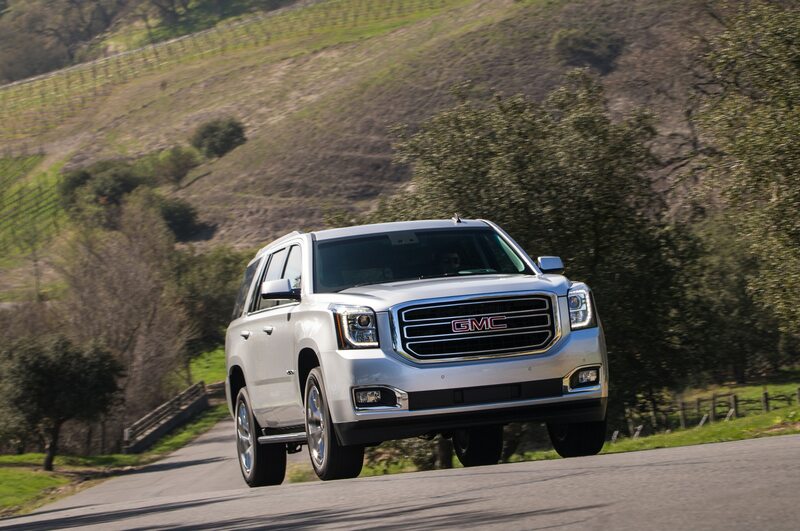 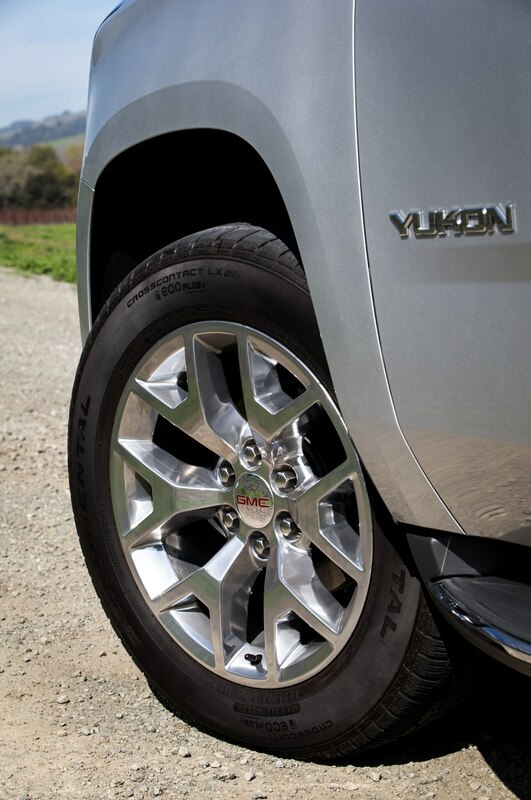 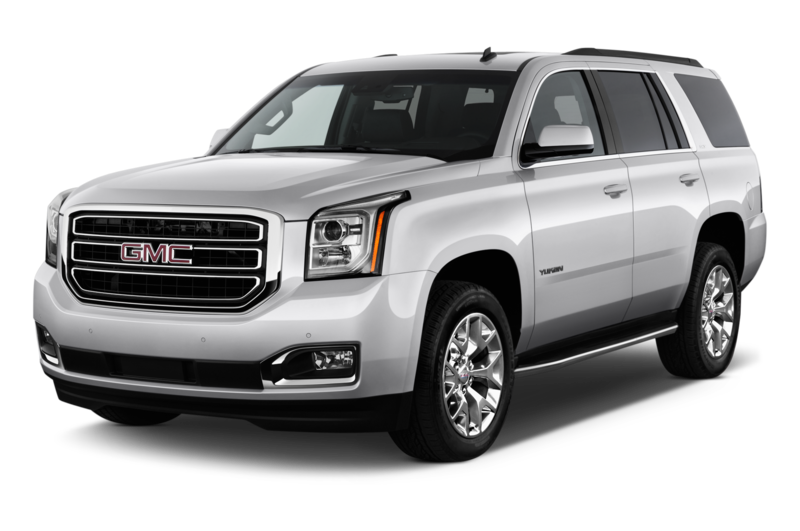 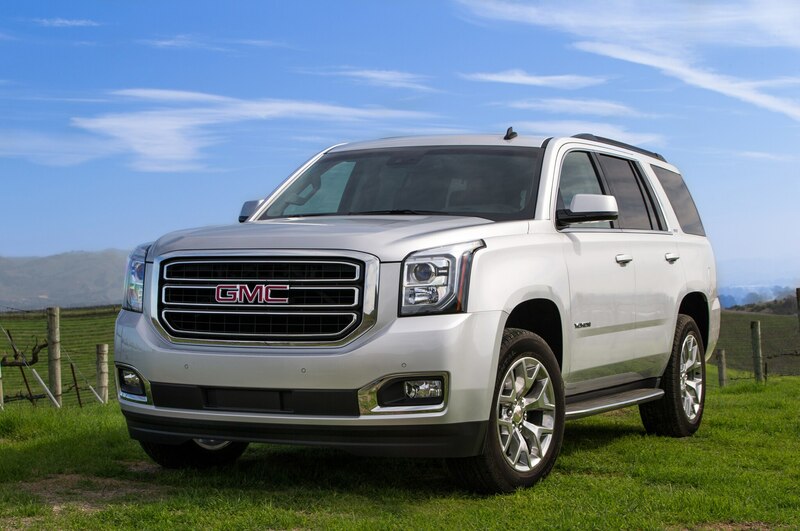 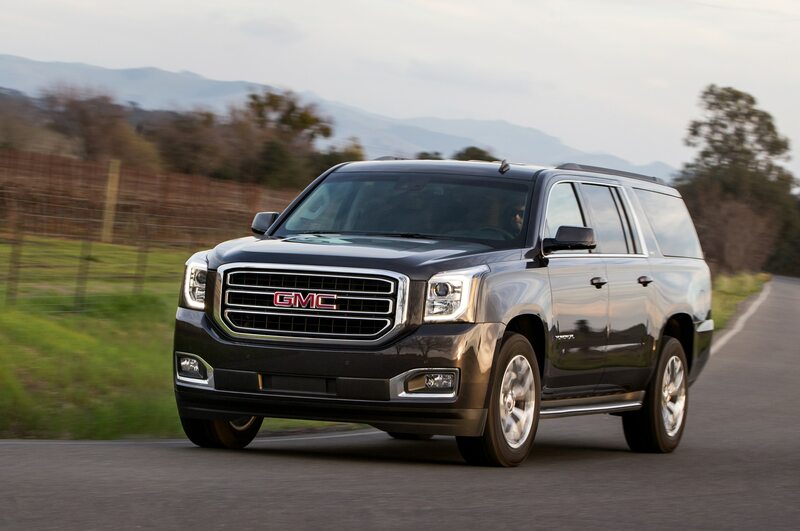 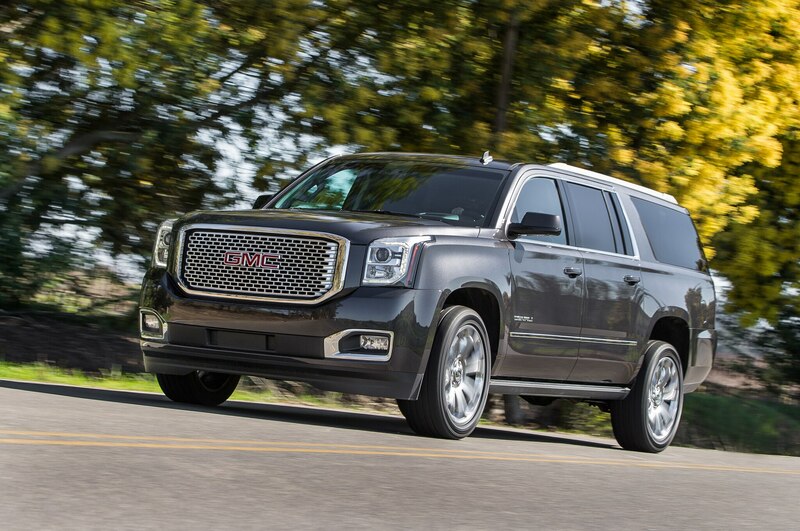 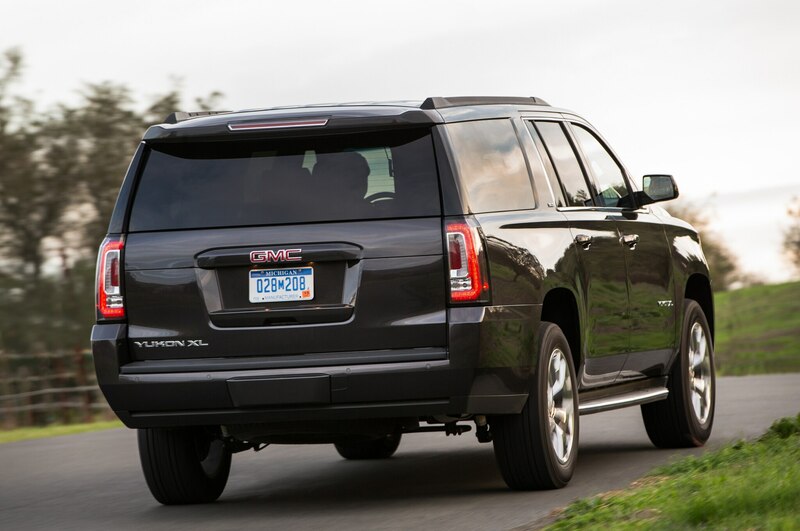 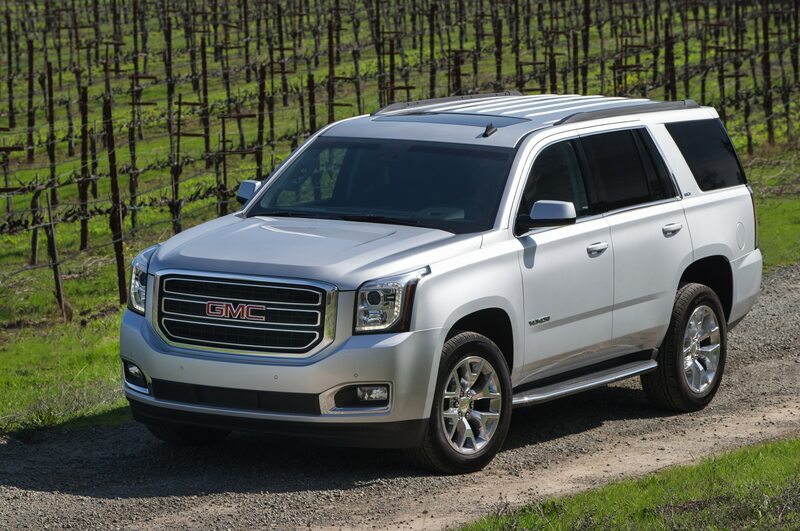 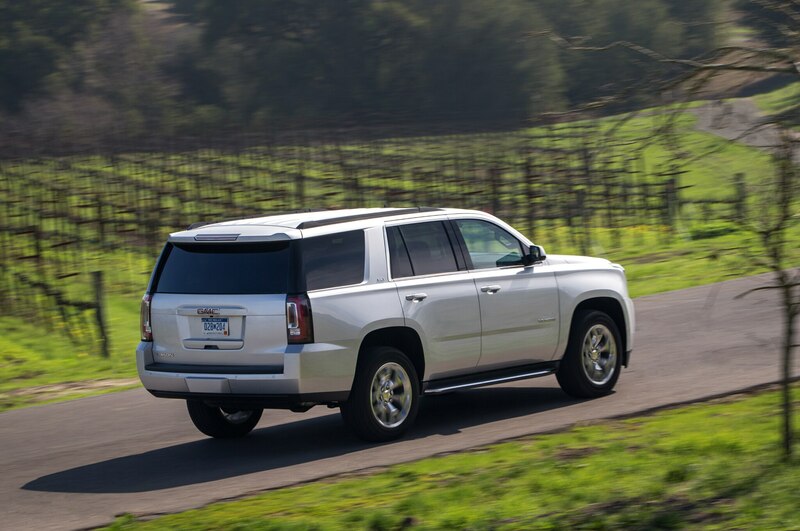 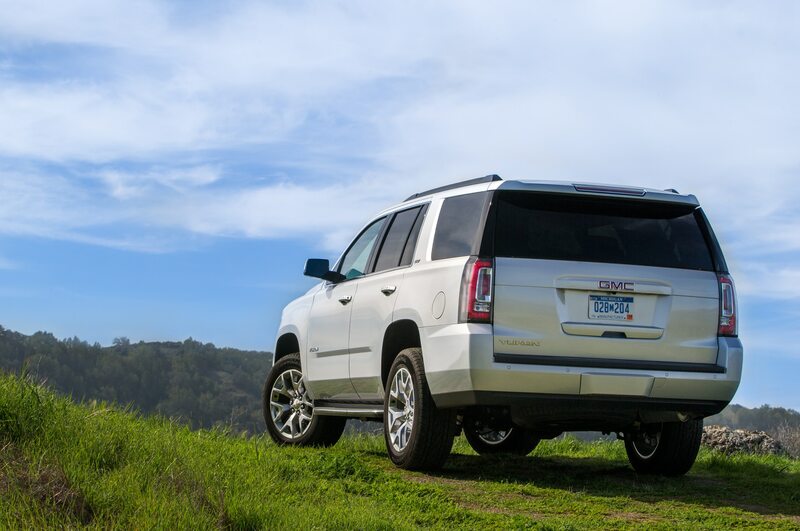 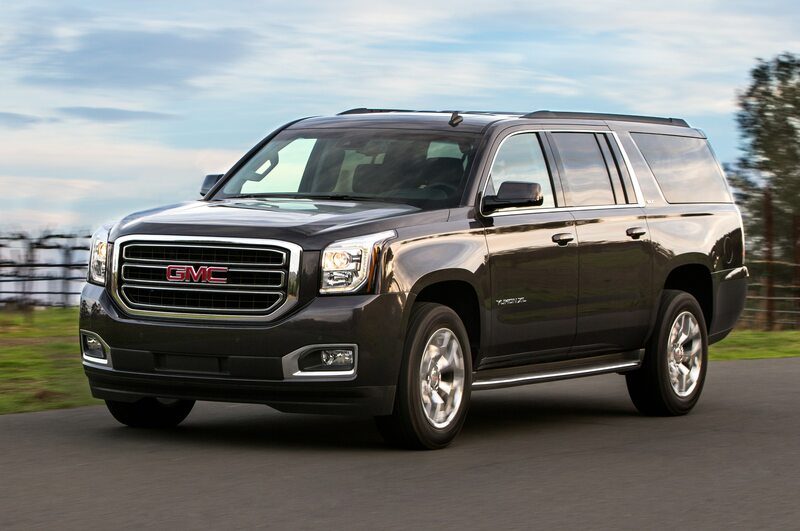 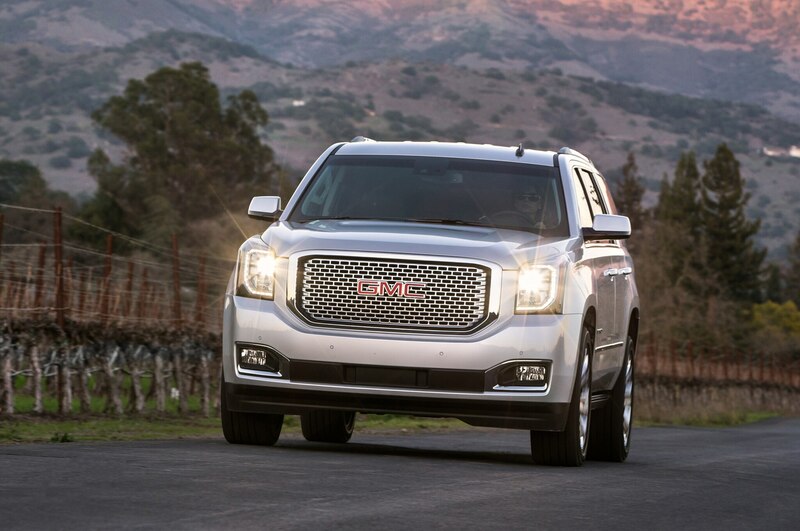 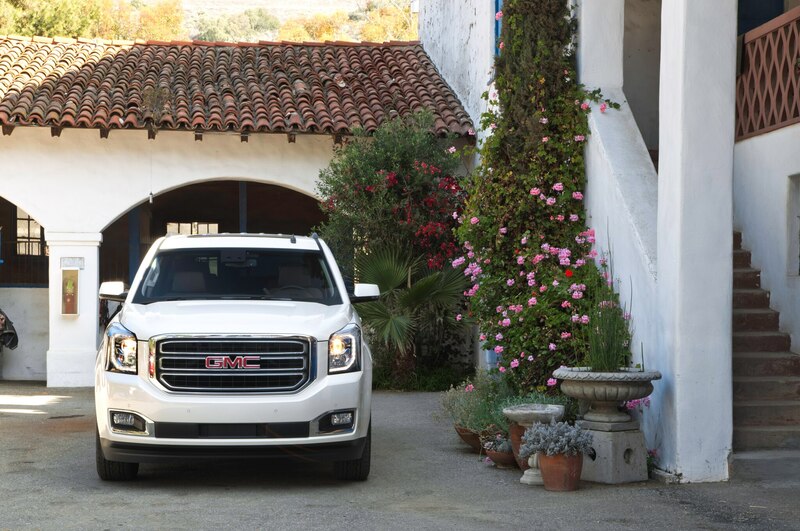 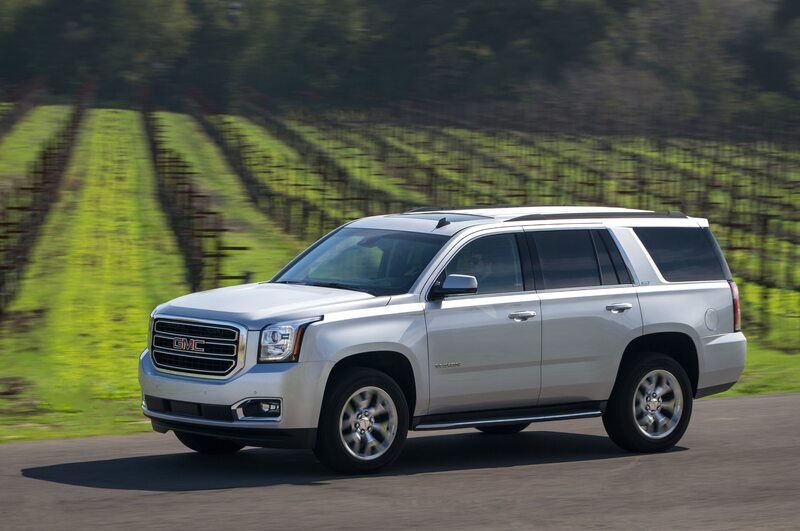 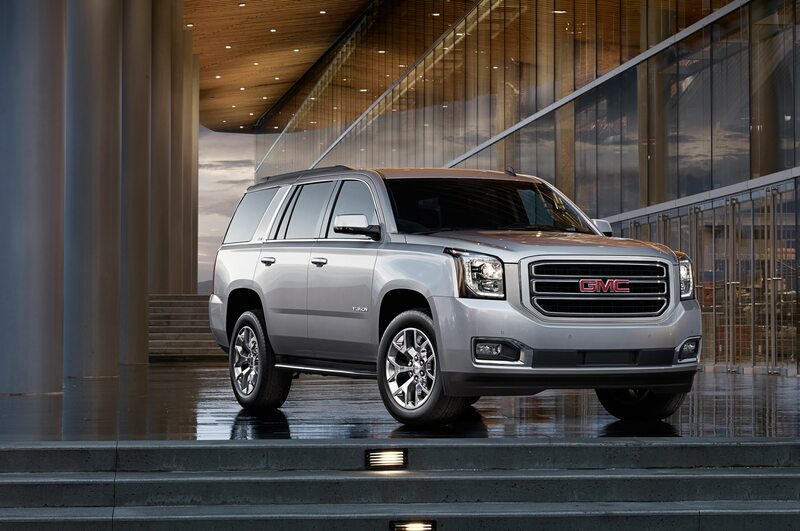 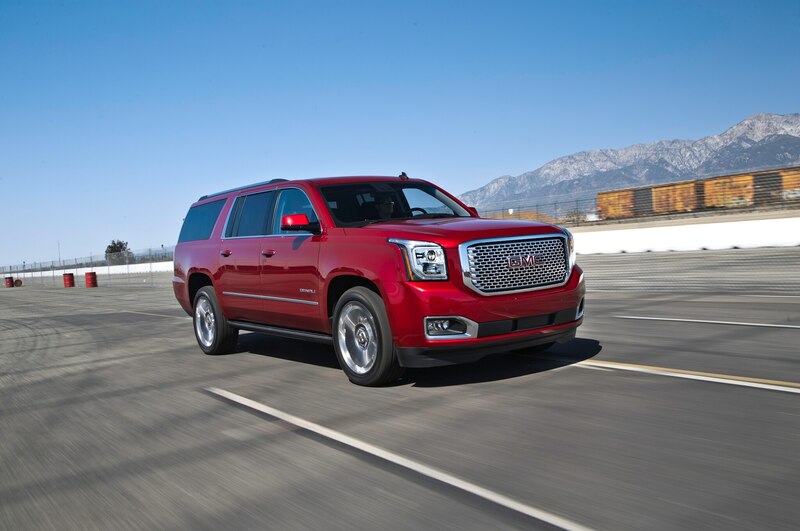 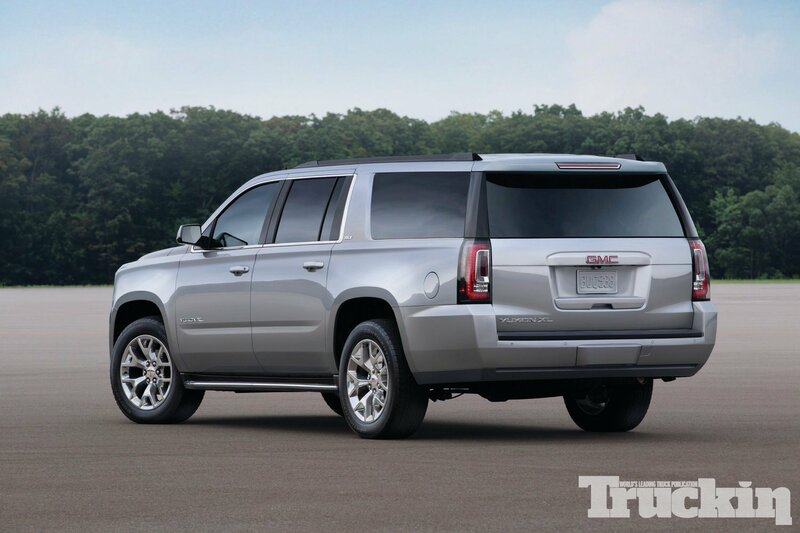 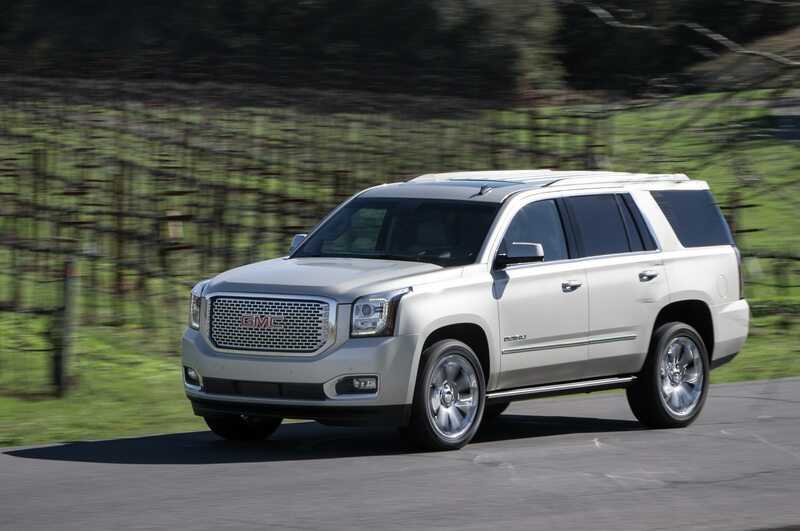 With four-wheel drive, the 5.3-liter Yukon drops to 16/22 mpg, and the XL gets 15/22 mpg. 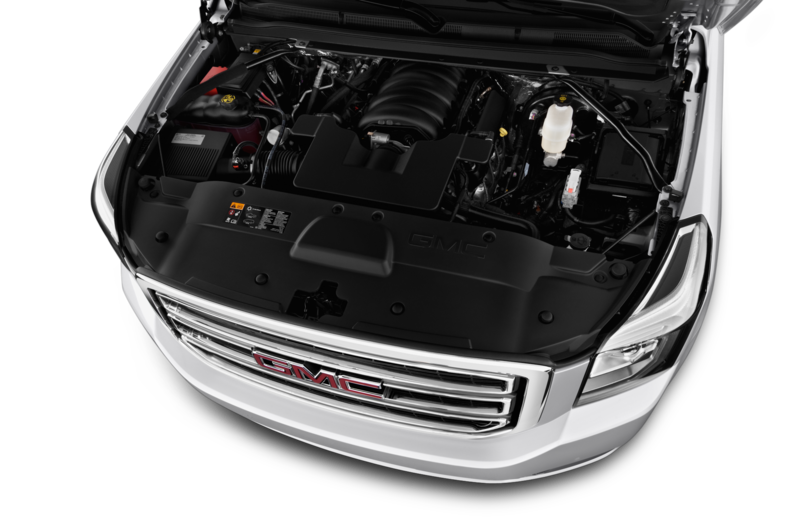 The larger 6.2-liter V-8 in combination with rear-wheel drive is rated at 15/21 mpg in either truck. 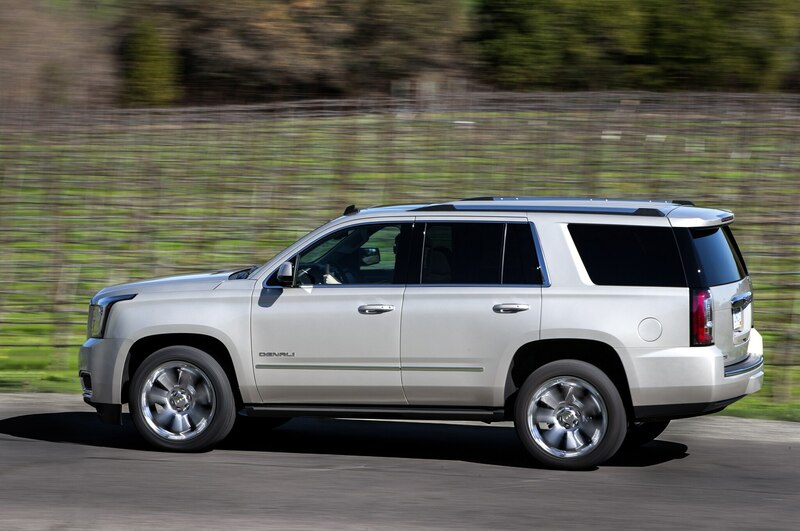 The 6.2-liter/4WD combo is the thirstiest, at 14/21 mpg for the Yukon and 14/20 mpg in the XL. 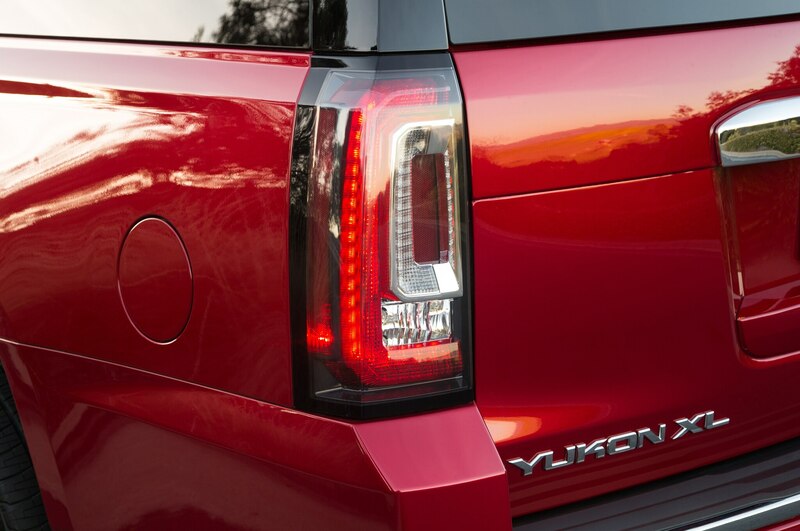 On the subject of fuel economy, note that the Yukon Hybrid has been dropped. In addition to fuel economy gains, the new engines offer improved performance. 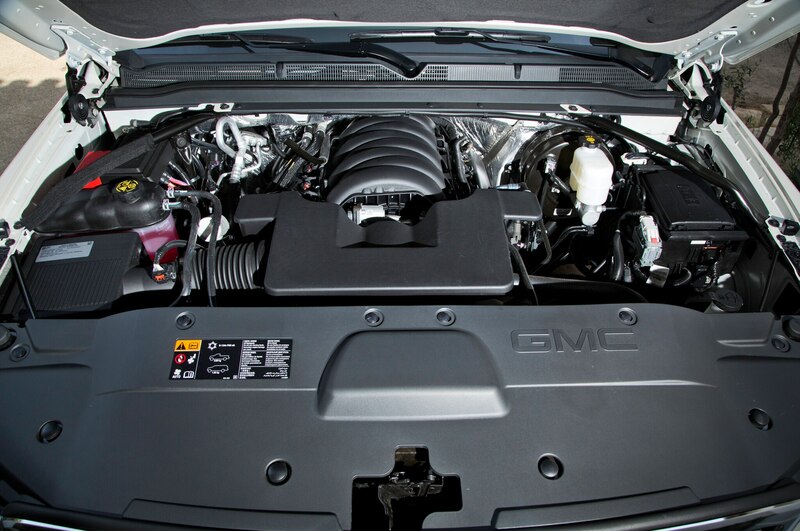 The 5.3-liter’s output increases from 320 hp to 355 hp and from 335 lb-ft of torque to 383 lb-ft. 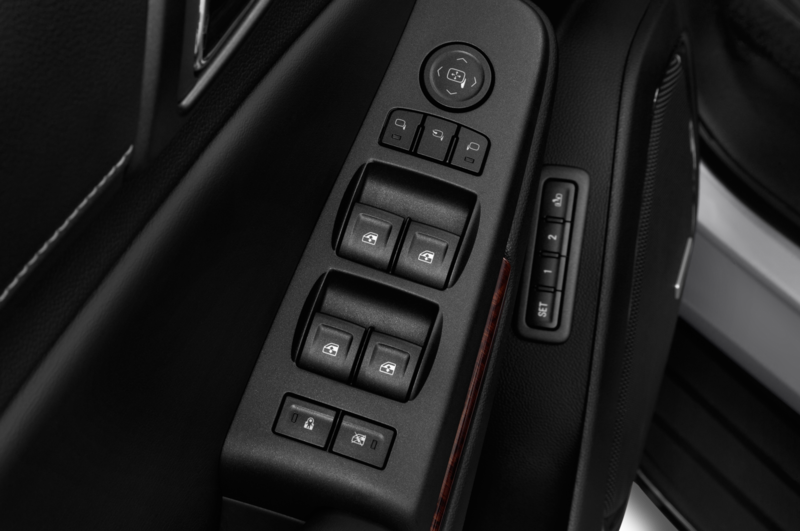 The 6.2-liter, which didn’t really need more power, nonetheless adds 17 hp and 43 lb-ft of torque, bringing its totals to 420 hp and 460 lb-ft. A six-speed automatic transmission returns to handle the shifting duties; a plus/minus button on the column shifter allows for manual shifts, but unfortunately the driver must first move the lever out of D and into M.
While the smaller engine is the same one found in the Chevrolet Tahoe and Suburban, the 6.2-liter is exclusive to GMC, specifically to the top-spec Denali, where it’s standard. 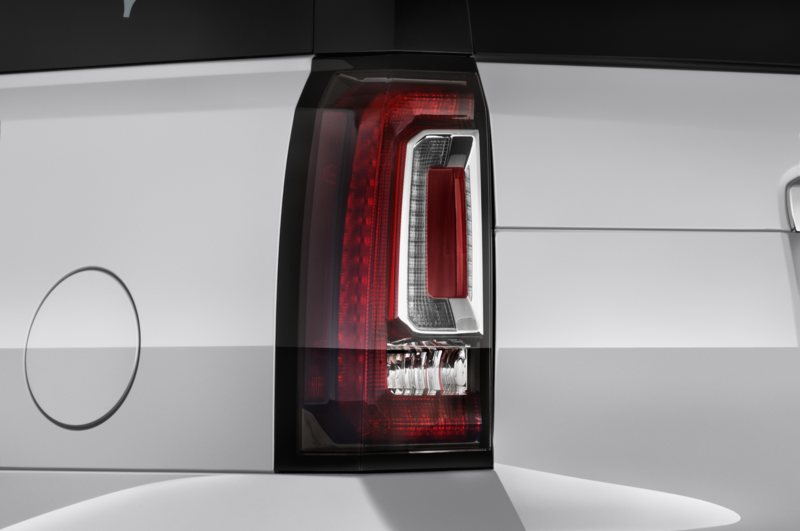 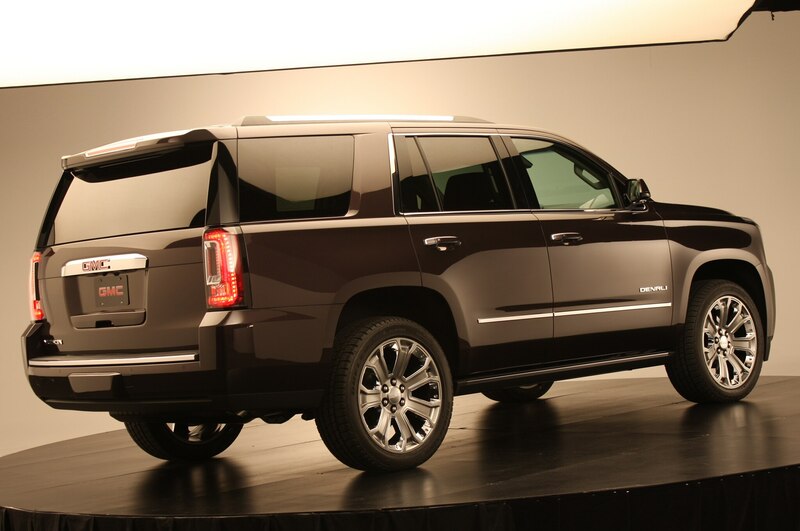 (Well, not completely exclusive—the Cadillac Escalade gets it, too.) 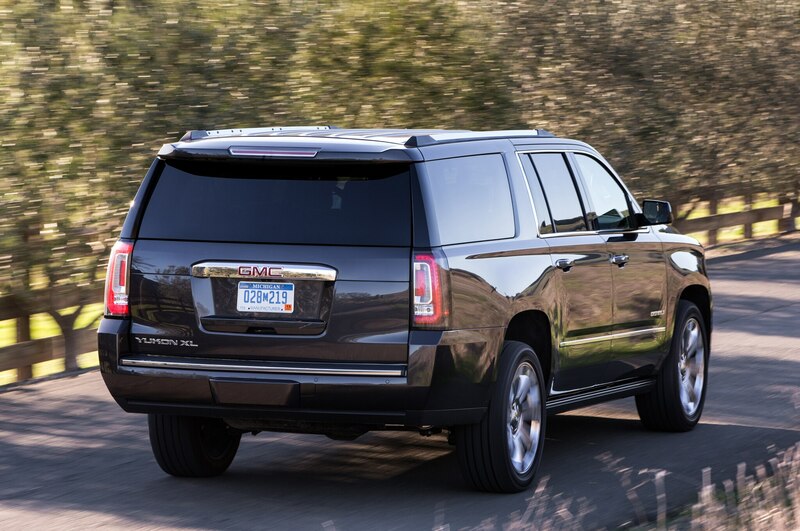 The 6.2-liter gives this lineman-sized SUV the quickness of a running back. 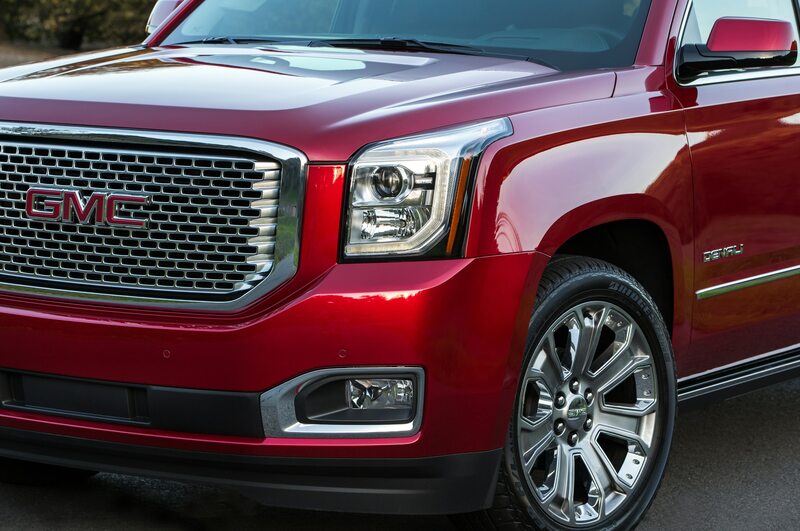 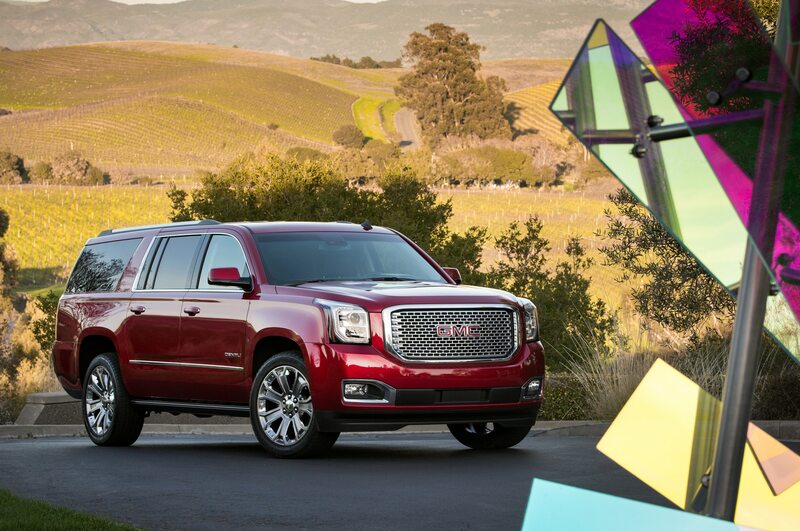 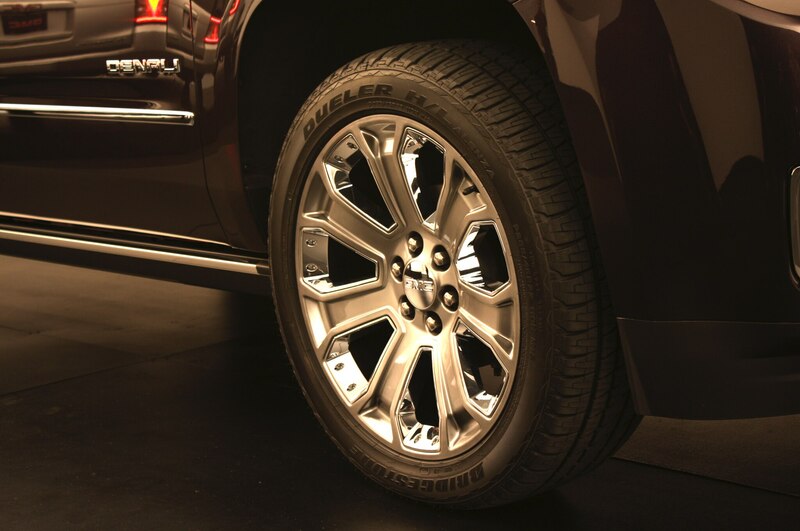 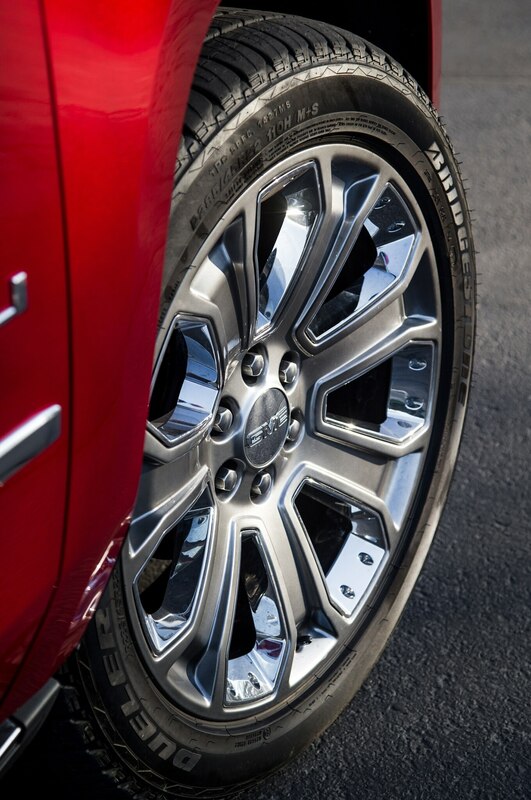 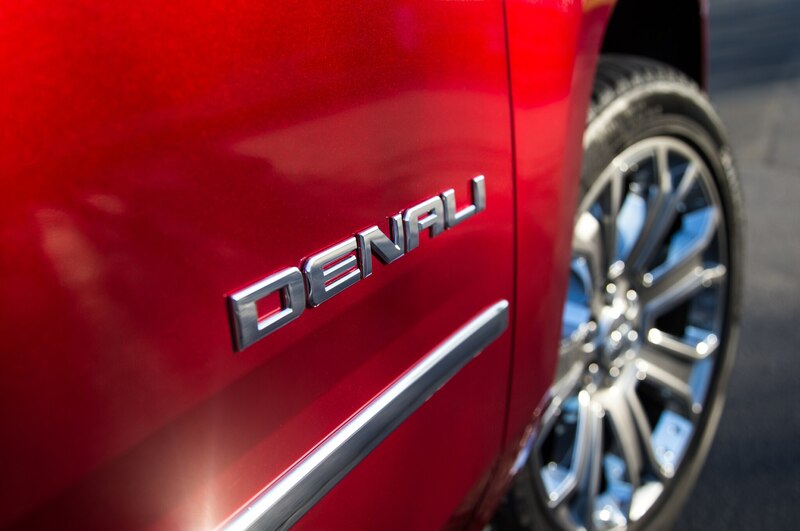 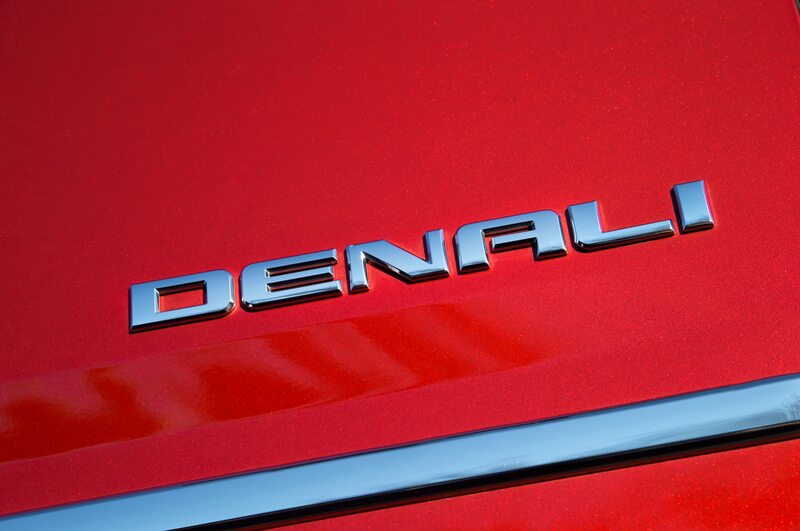 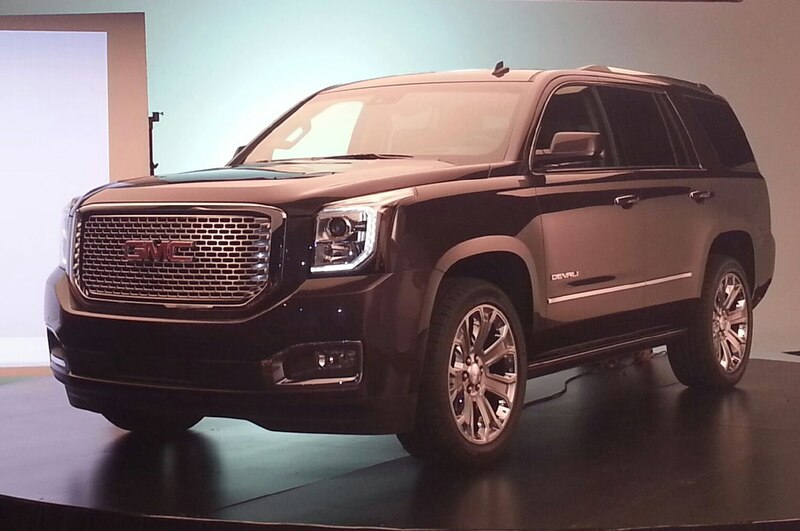 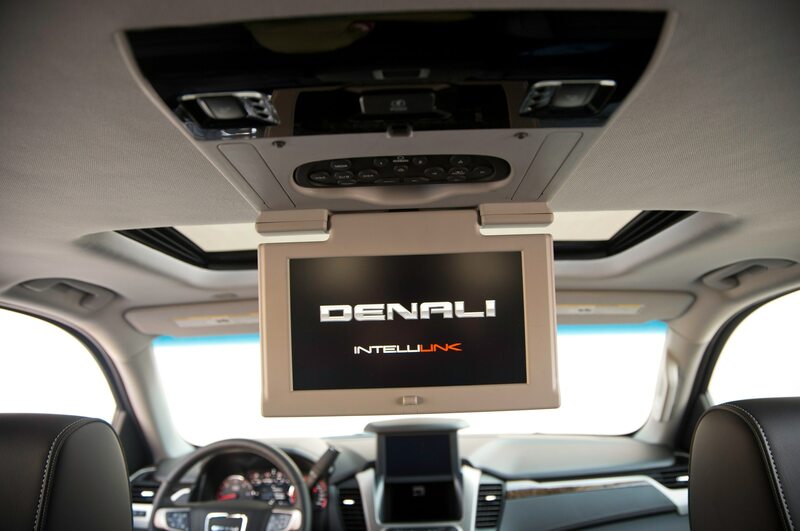 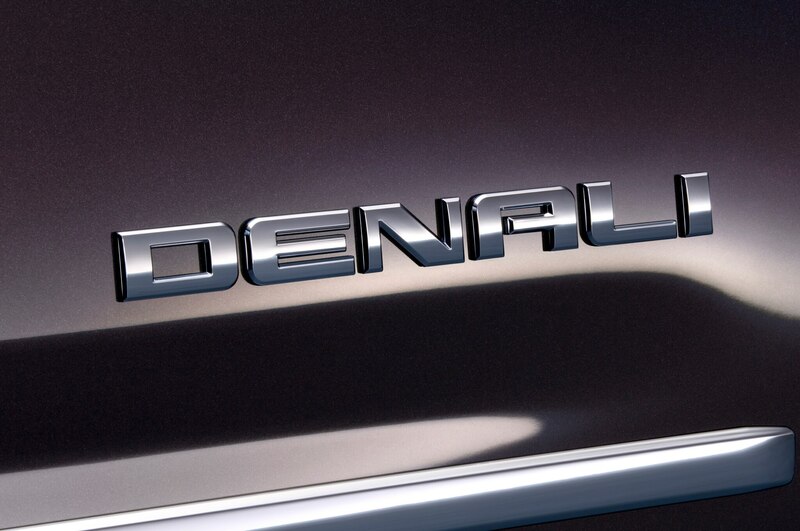 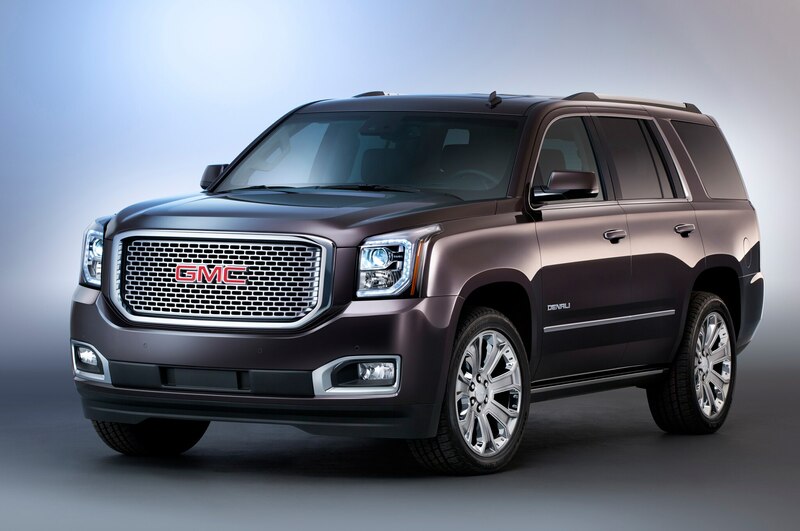 With it, the Denali sprints from 0 to 60 mph in 6 seconds; the 5.3-liter is about a second behind. 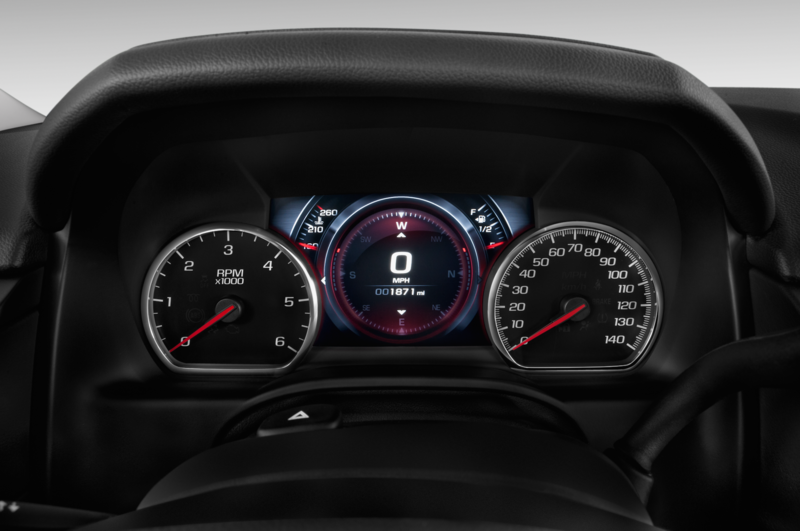 Both engines are commendably smooth, slipping into and out of fuel-saving four-cylinder mode with no indication beyond the readout in the instrument panel. 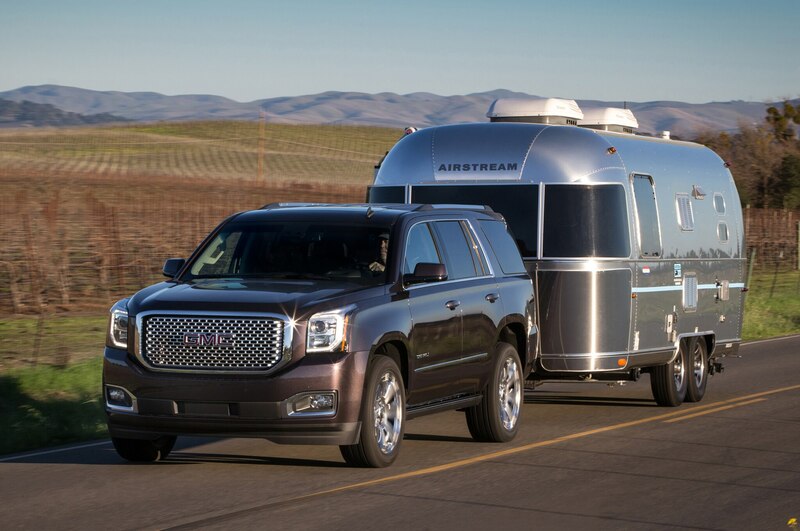 Maximum tow ratings range from 7900 to 8500 pounds; surprisingly, the 6.2-liter’s ratings are slightly lower than those for the 5.3-liter. 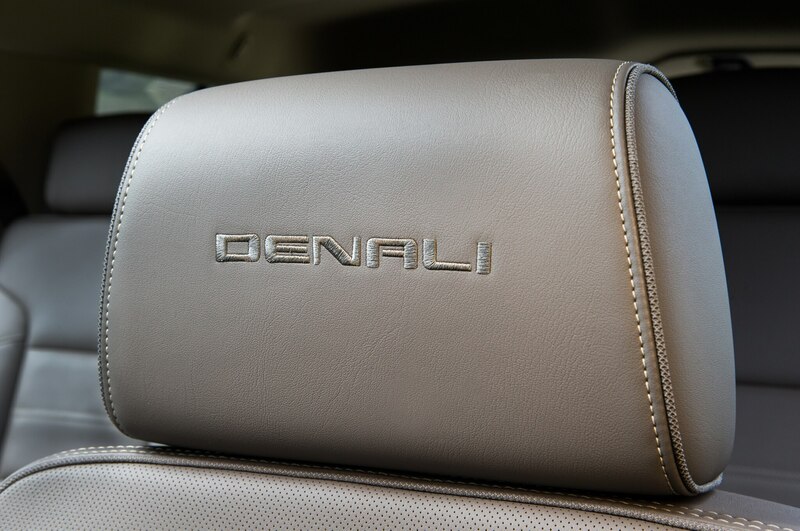 Besides the larger engine, the Denali also has active noise cancellation and GM’s magnetic ride control (the latter is on the LTZ version of the Chevrolets as well); both are new this year. 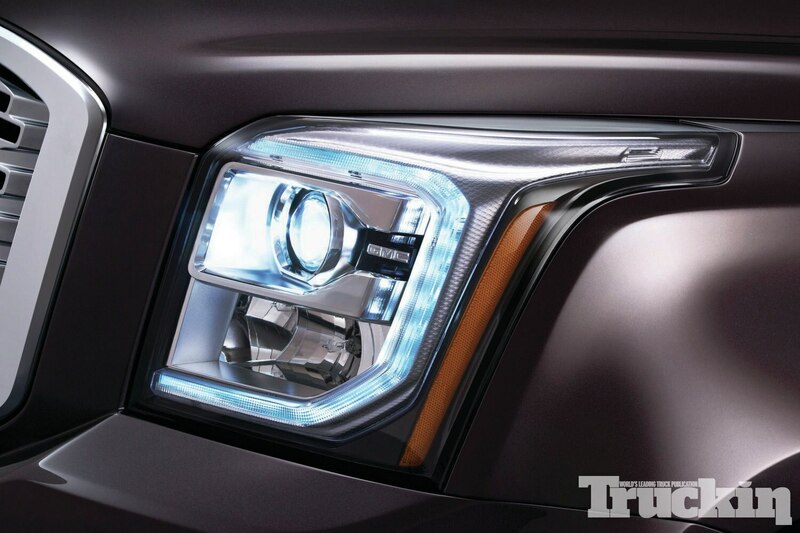 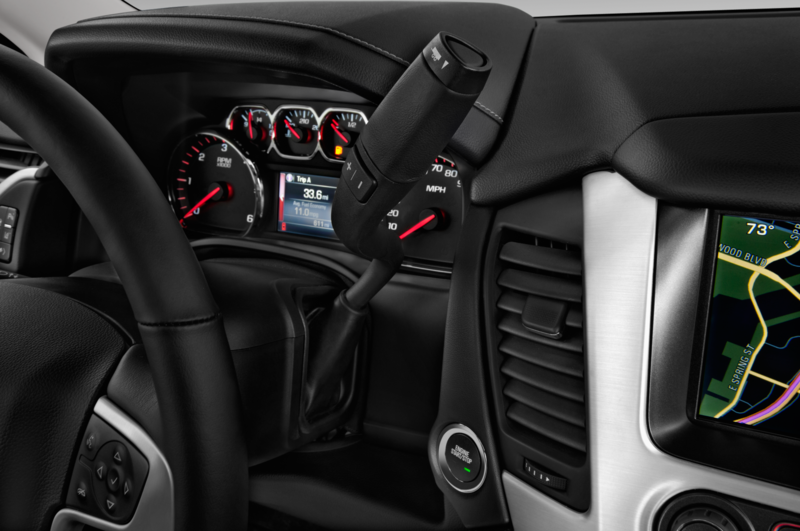 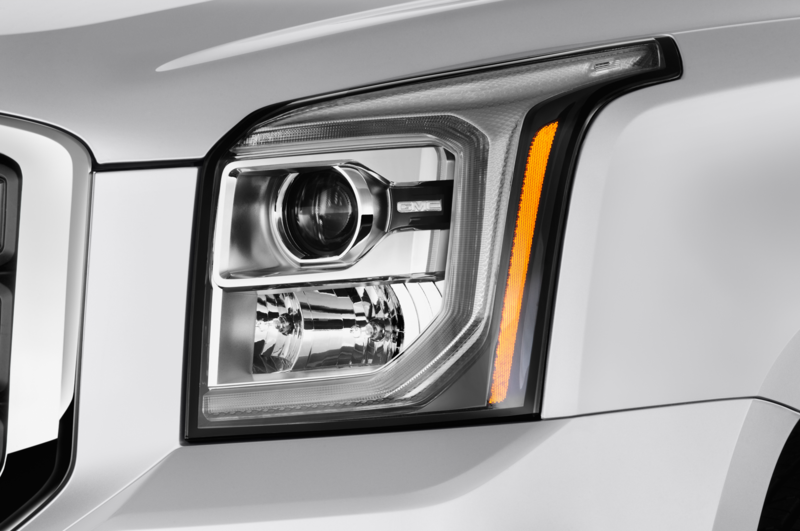 The 2015 trucks switch to electric power steering, and it’s a well-tuned setup. 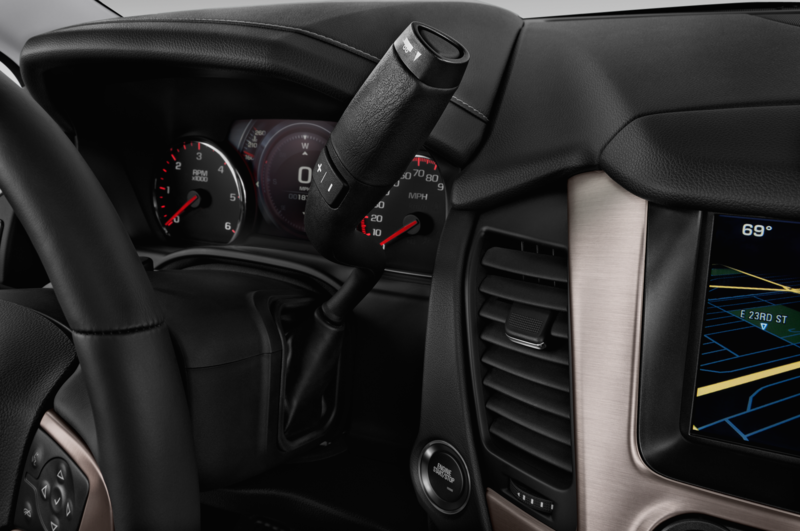 We also were impressed with the improved pedal feel from the redesigned brake system. 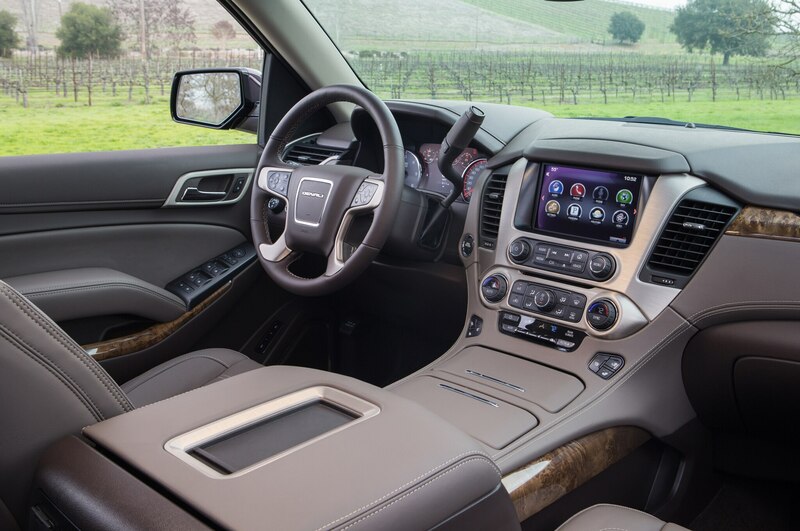 The interior has been significantly upgraded. 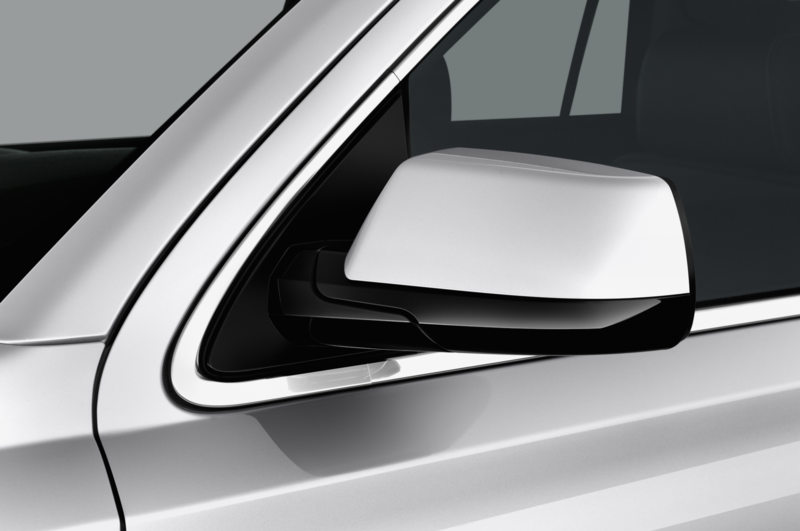 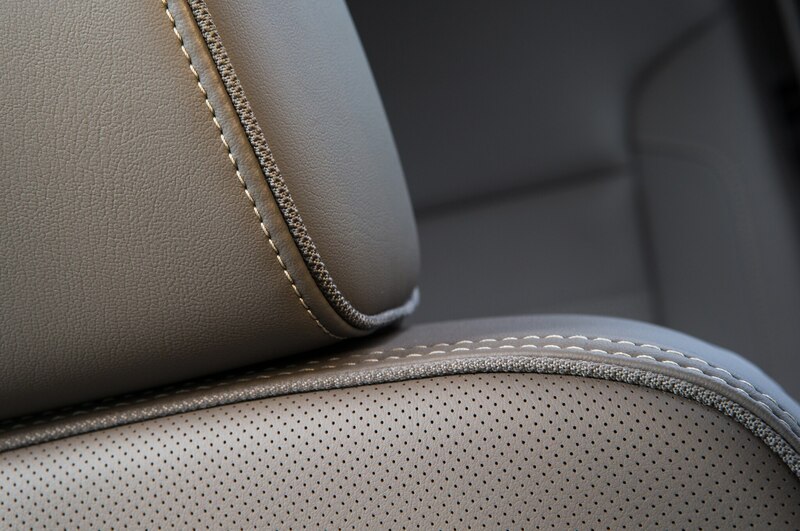 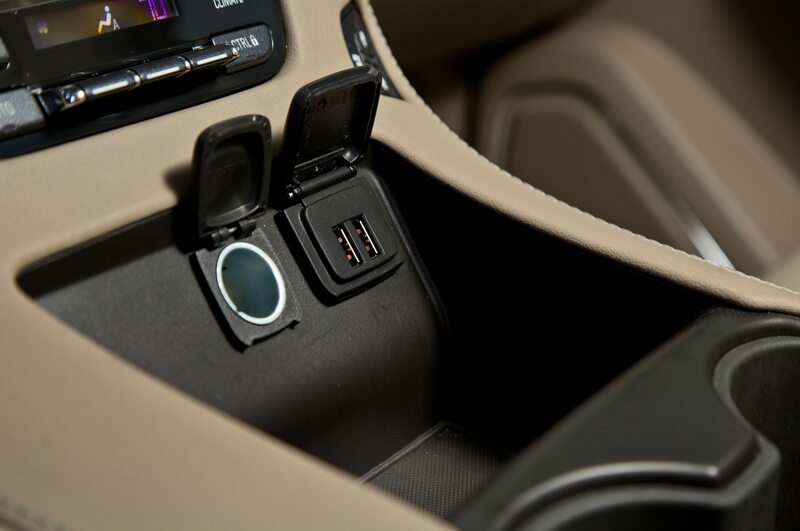 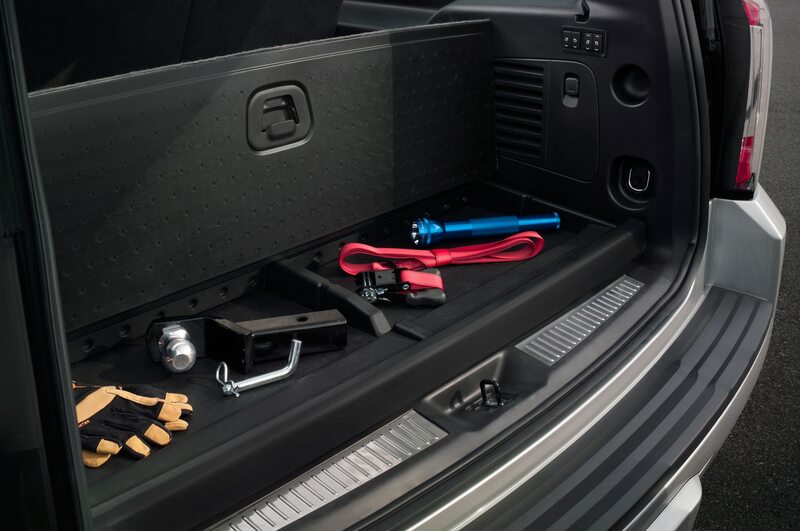 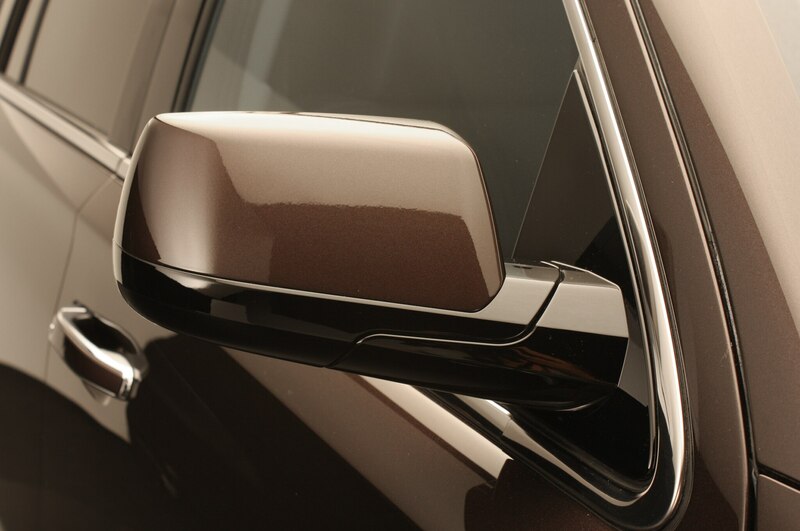 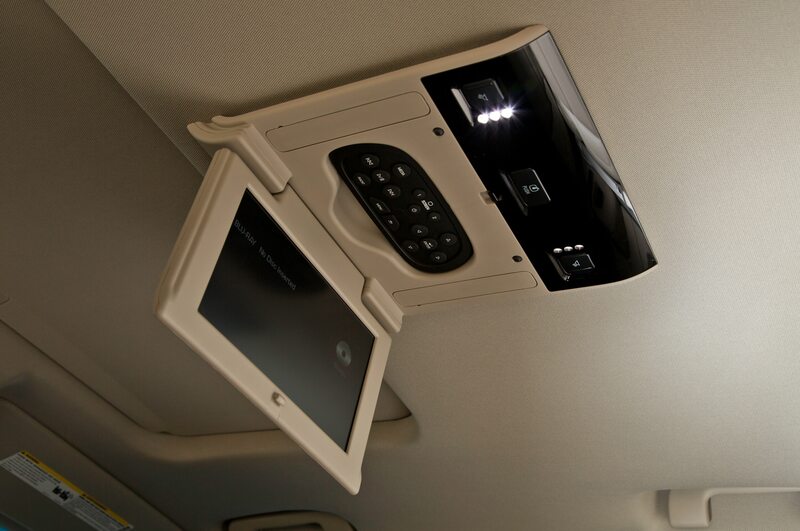 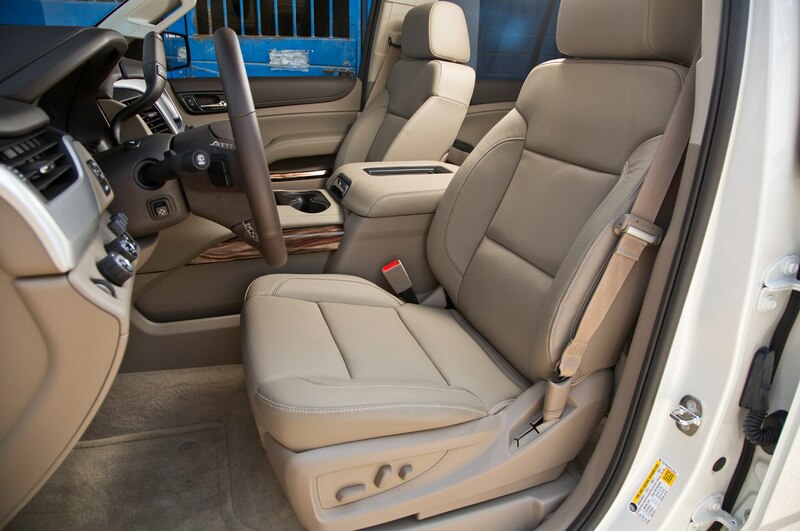 You’ll find generously padded door panels and armrests, including the one topping the deep storage bin in the wide center console. 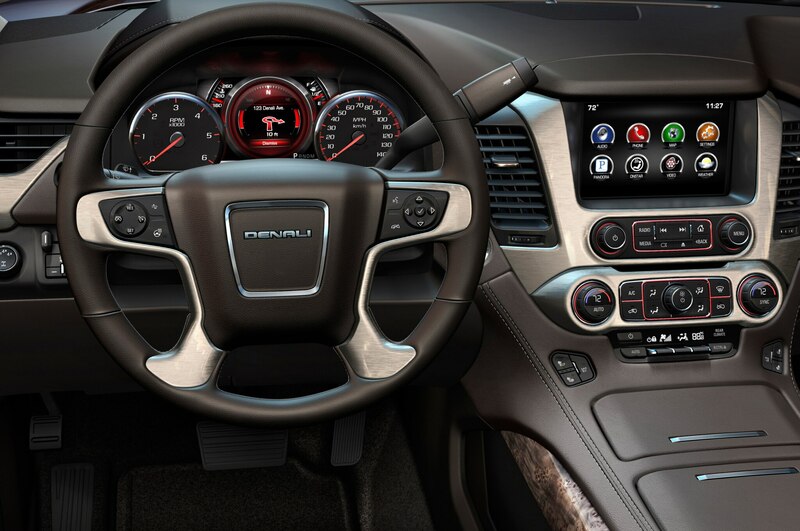 The dash is no longer shared with the pickup trucks, and the broad, plain expanse of the previous model has been junked in favor of a richer design with soft-touch surfaces separated by metal and wood trim. 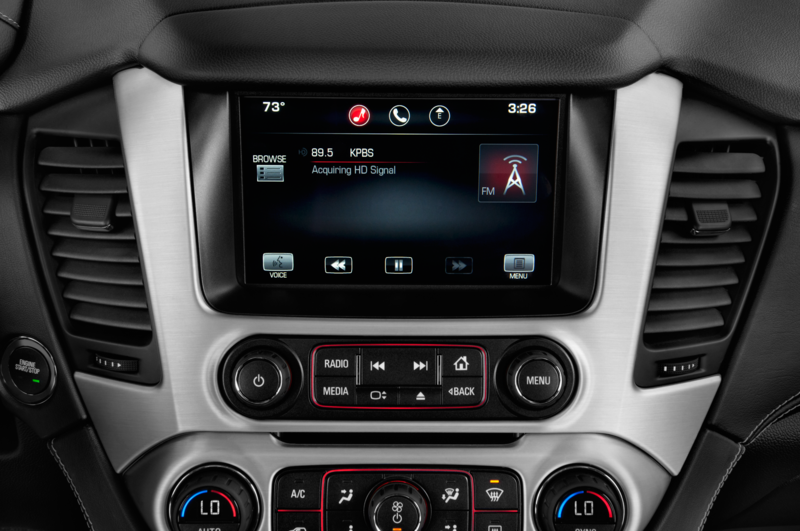 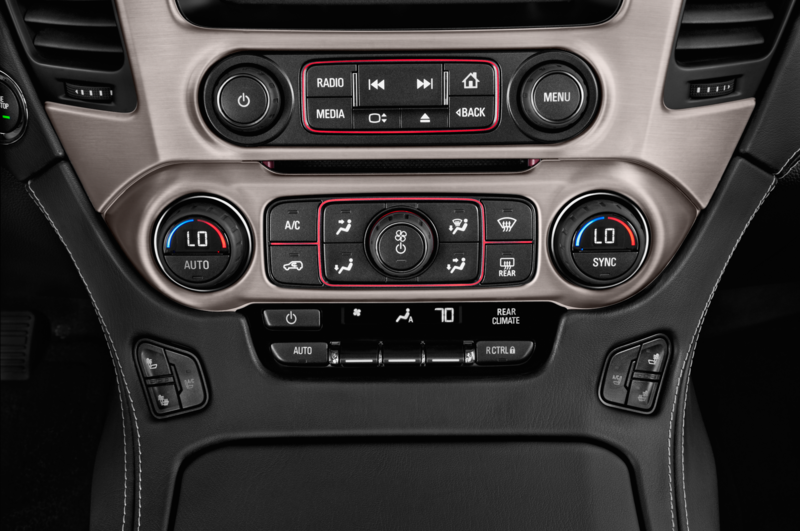 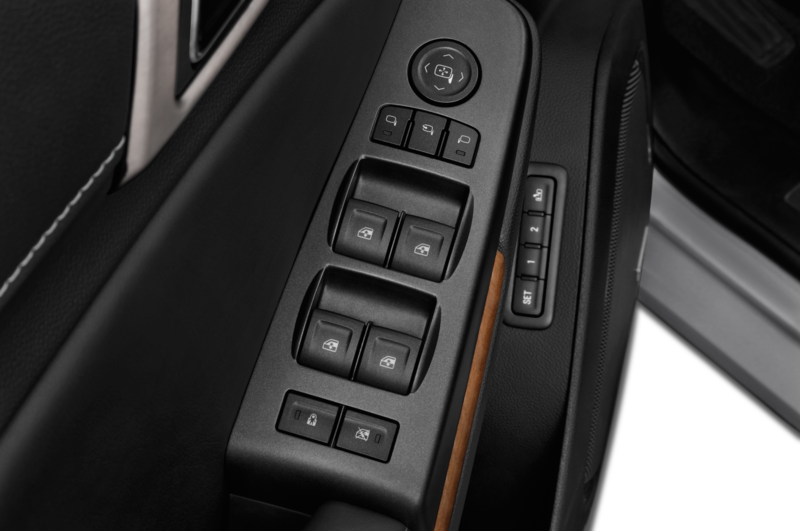 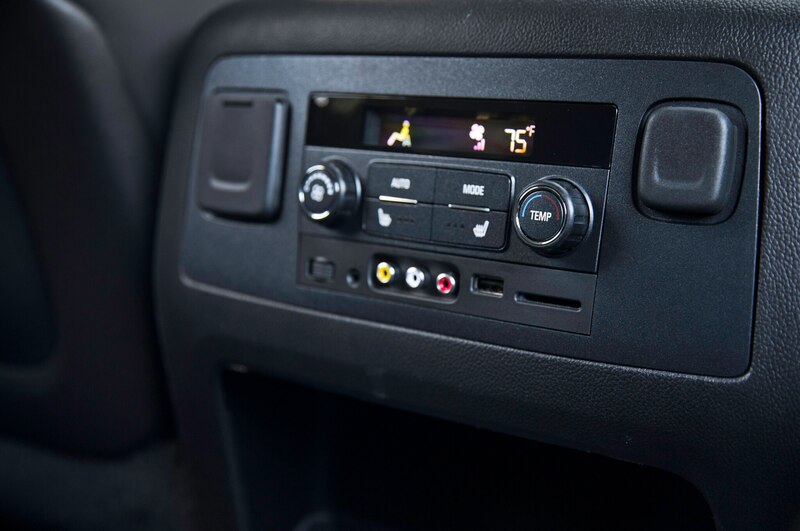 An 8-inch central touch screen is standard on all GMCs, but, happily, there are still lots of physical buttons and knobs for many of the most-often-used functions. 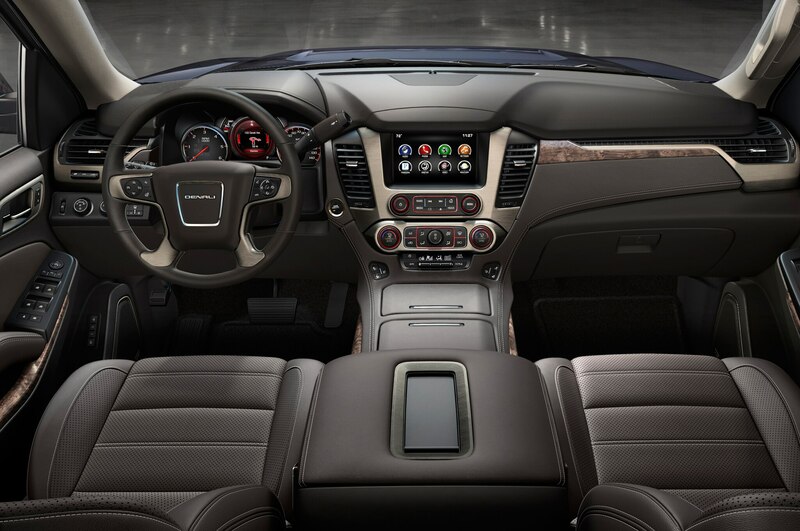 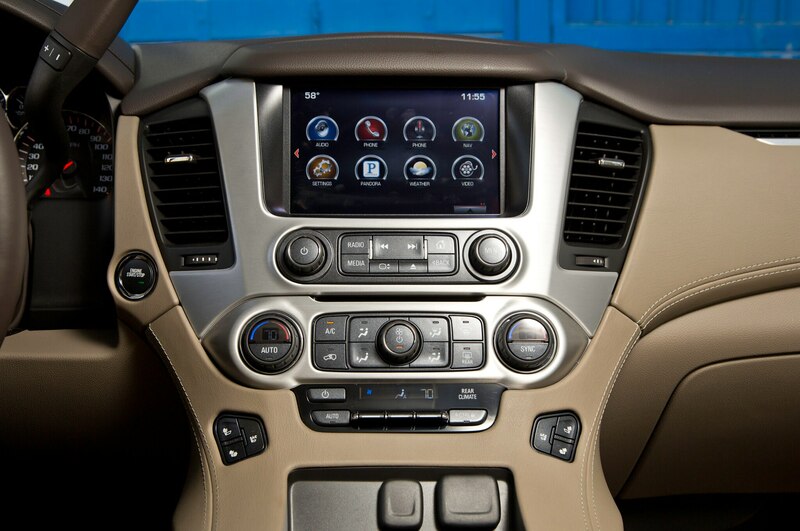 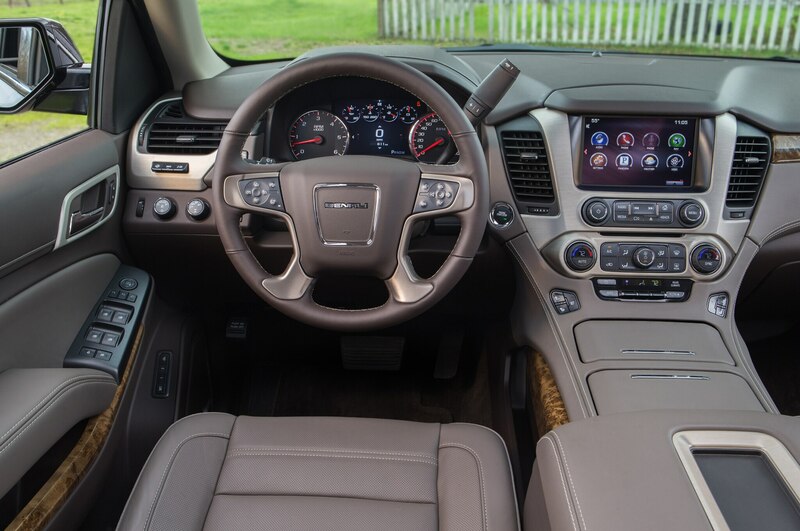 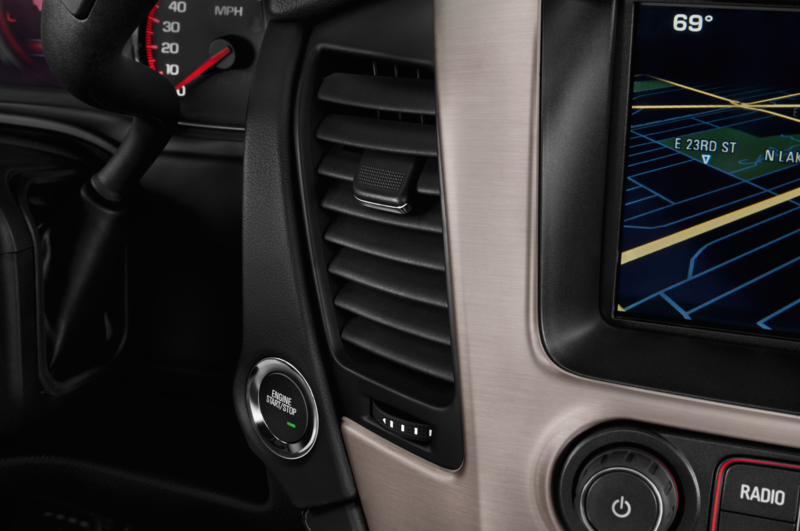 The Yukon also features a configurable screen in the instrument cluster. 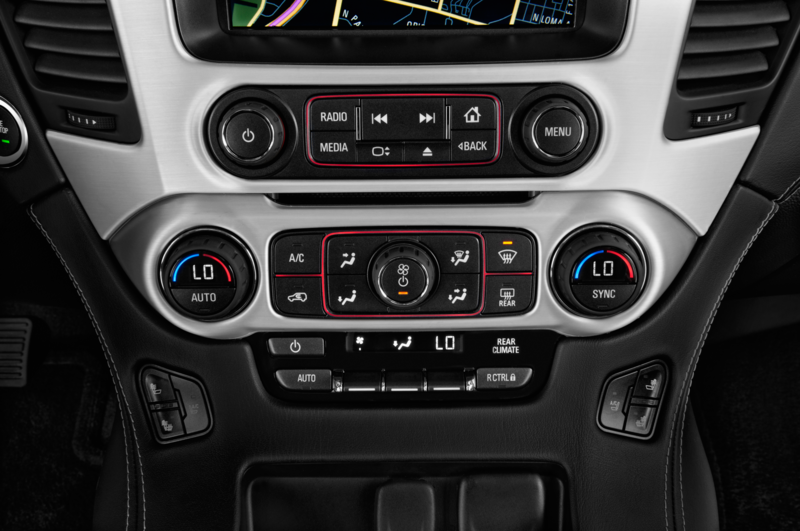 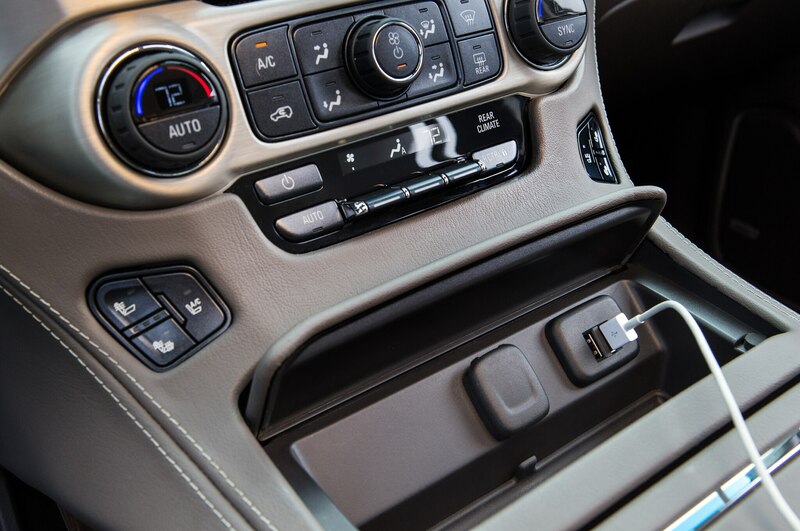 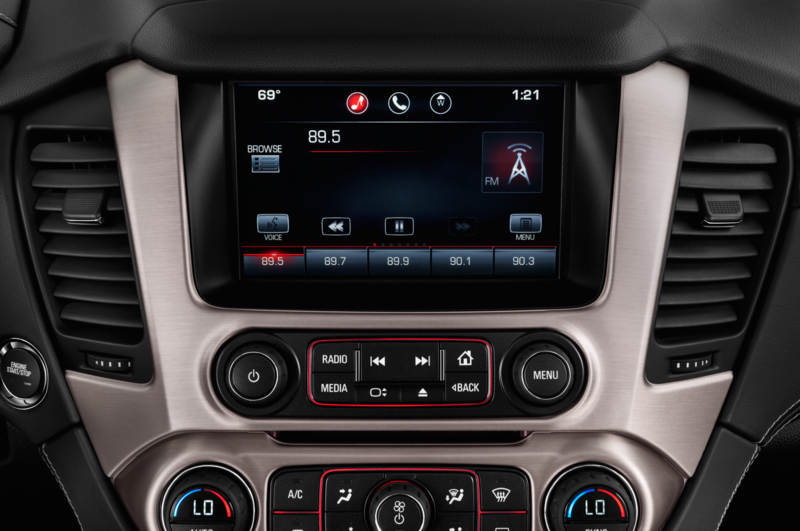 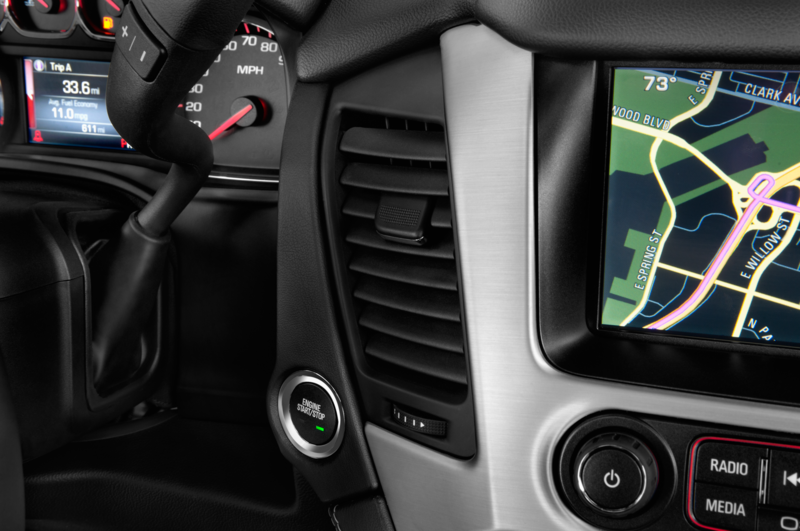 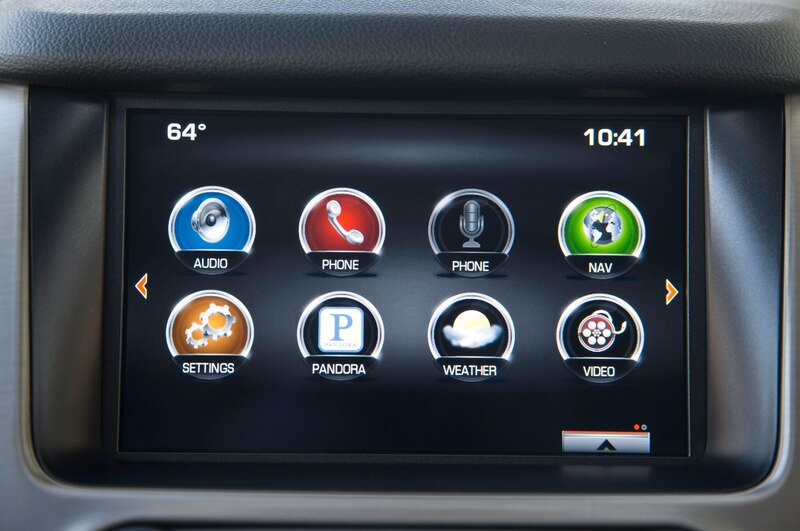 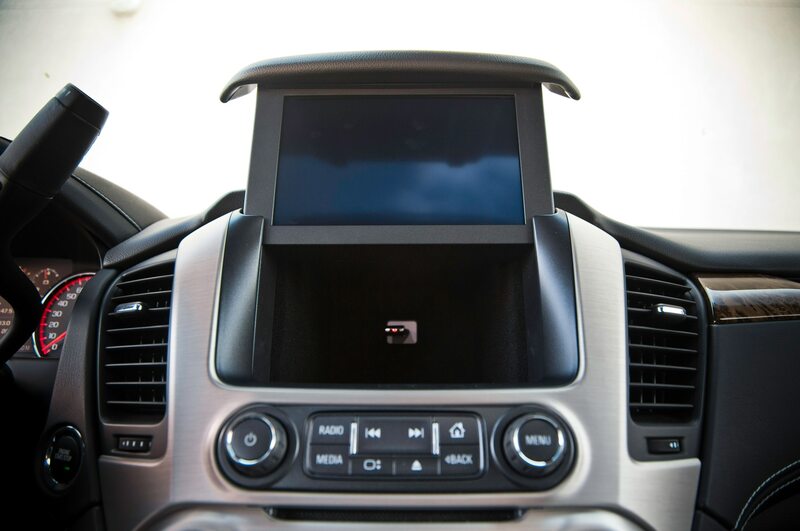 The highlight of the enhanced infotainment system doesn’t arrive until this fall, when GM will offer OnStar AT&T 4G, which allows the car to act as a wireless hot spot (provided you subscribe to an OnStar data plan or add the car to your existing AT&T data plan). 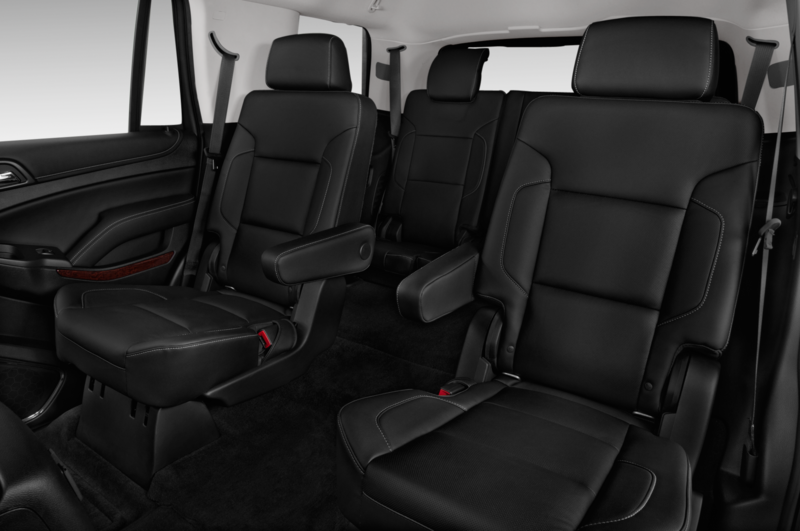 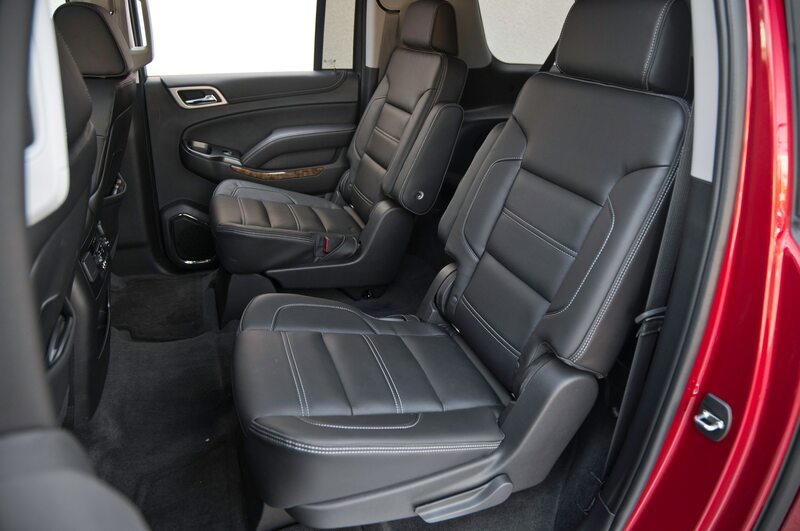 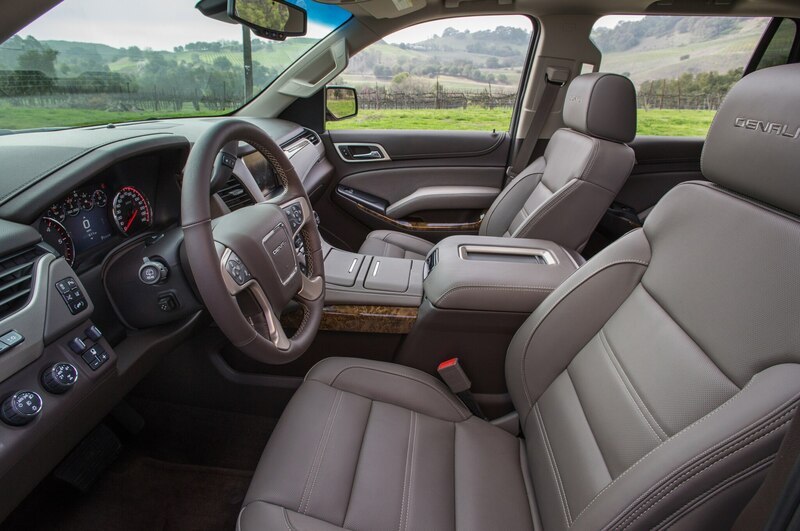 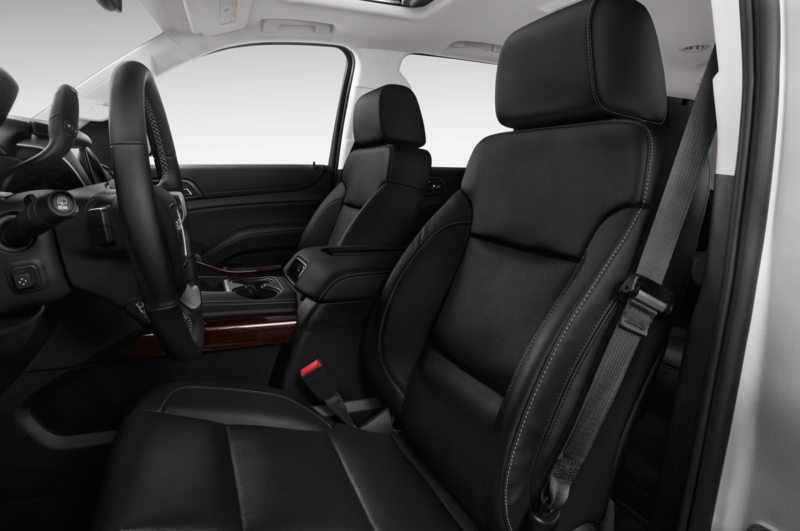 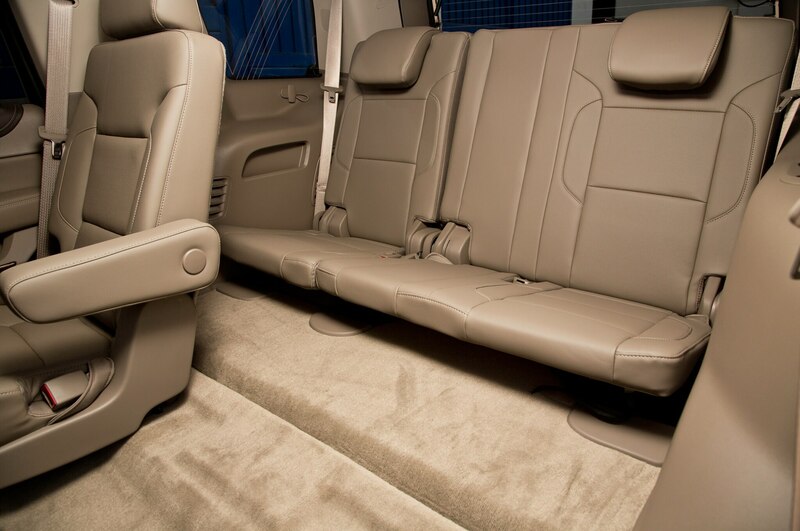 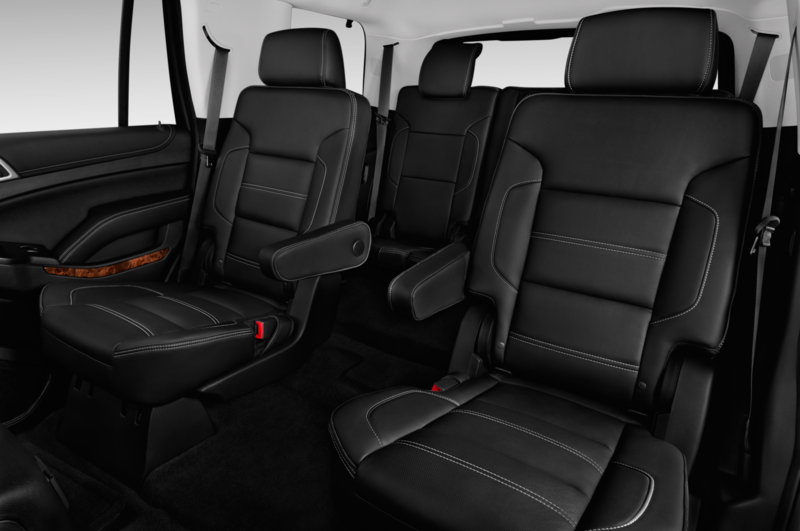 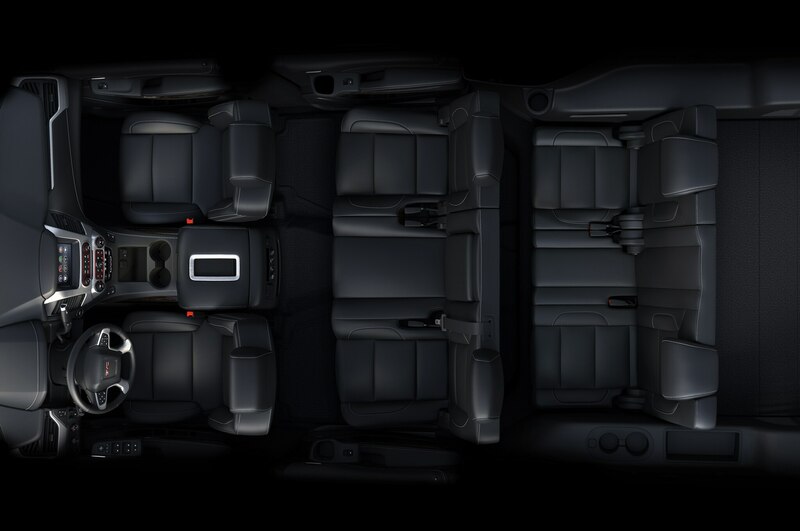 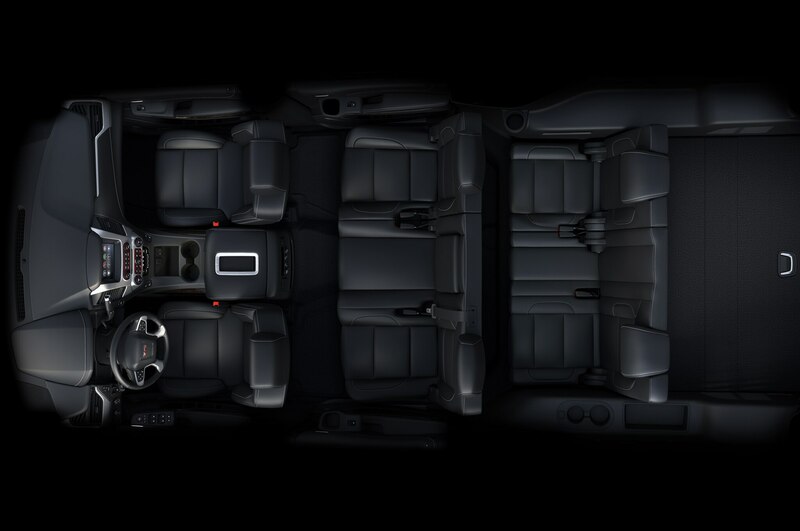 All Yukon variants can be had with bucket seats or a three-man bench in the roomy second row. 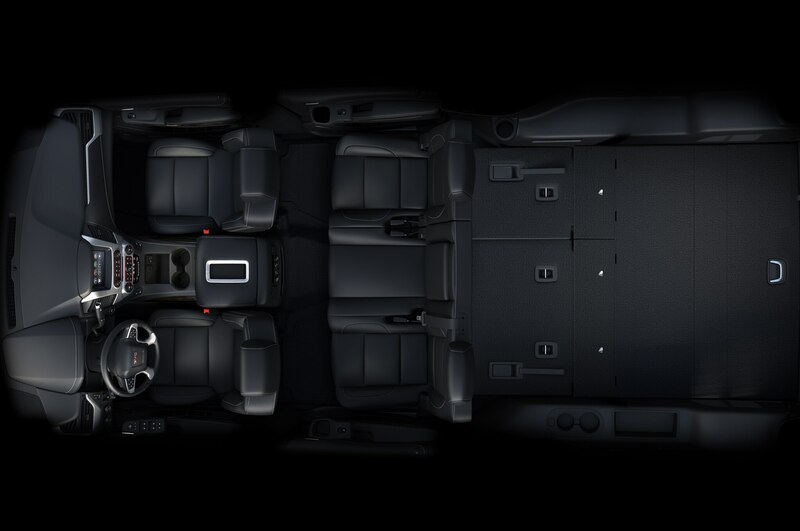 (You can even order a front bench seat, but only in base-spec cars.) 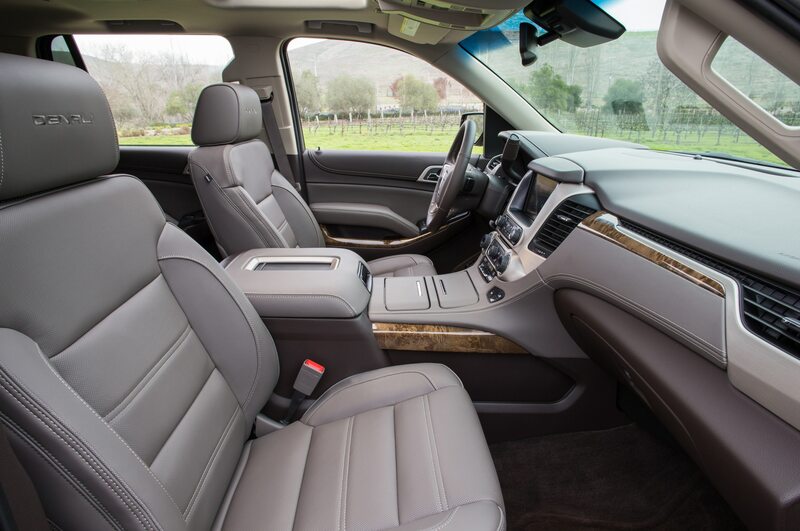 A third row is standard in both the Yukon and the Yukon XL, but the accommodations differ dramatically. The Yukon’s third seat is barely useable even for small kids. 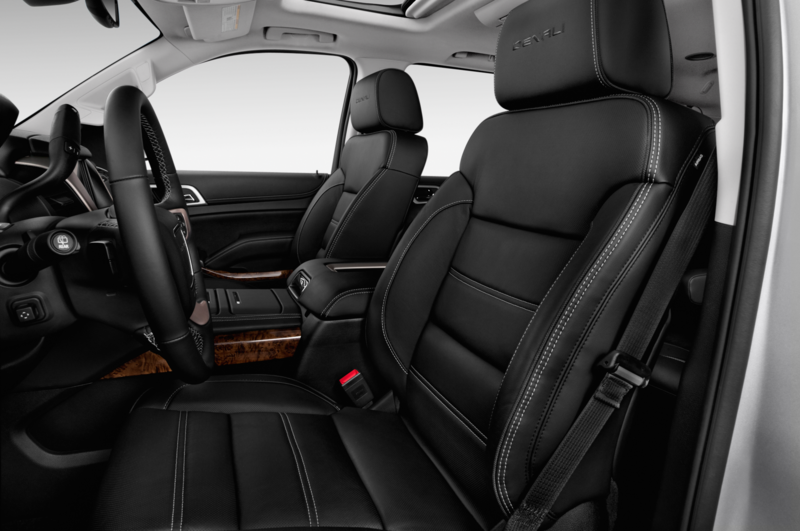 Blame the solid rear axle, which prevented engineers from carving out any legroom. 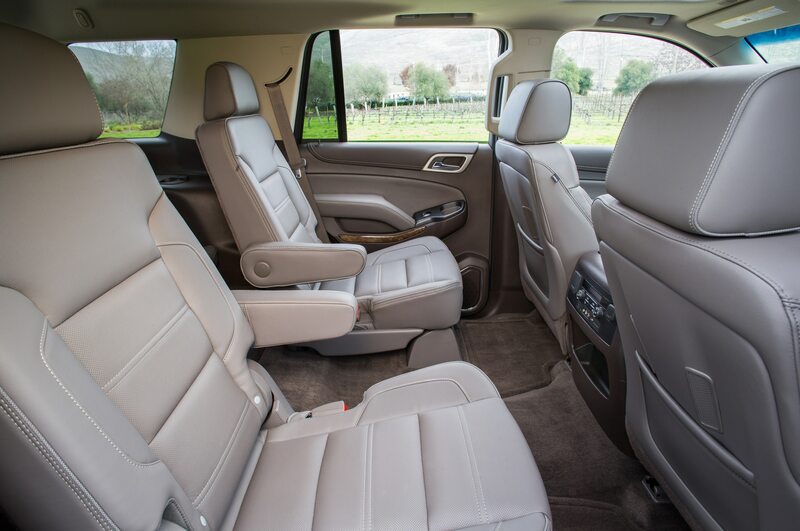 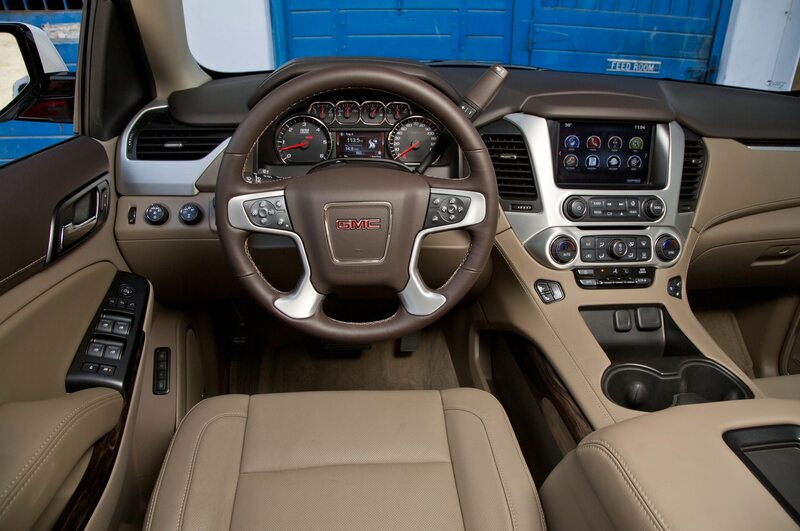 (The similar-sized GMC Acadia, which has an independent rear suspension, has a far better third-row seat.) 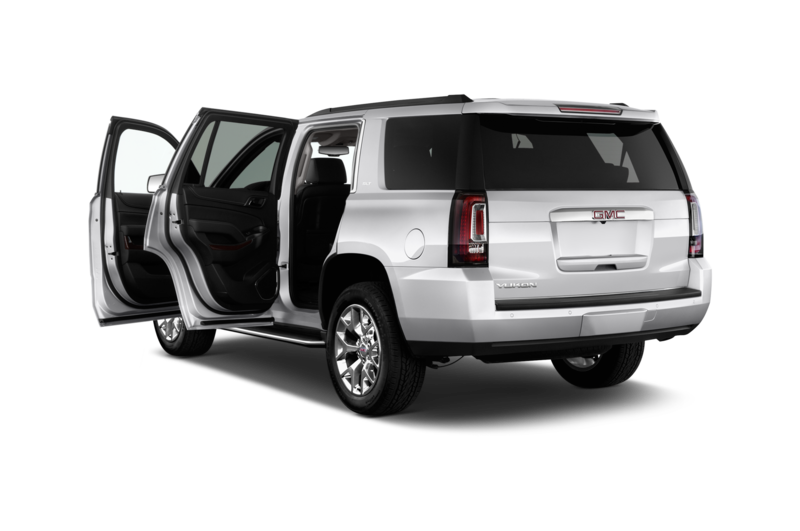 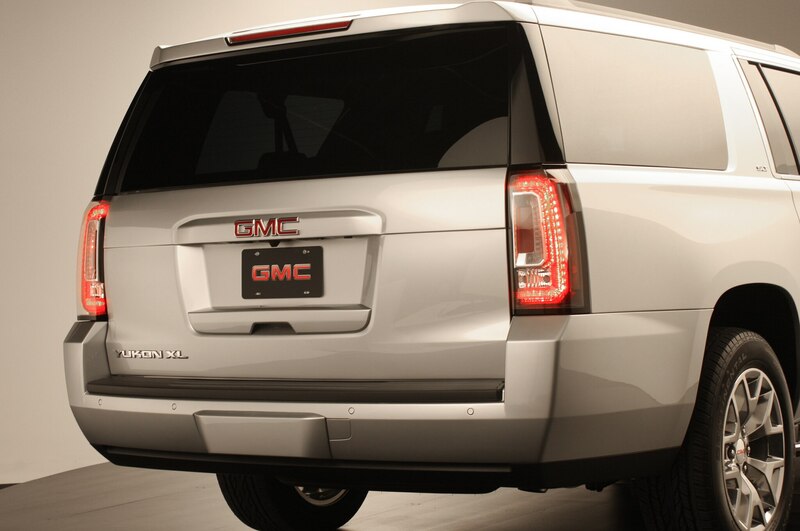 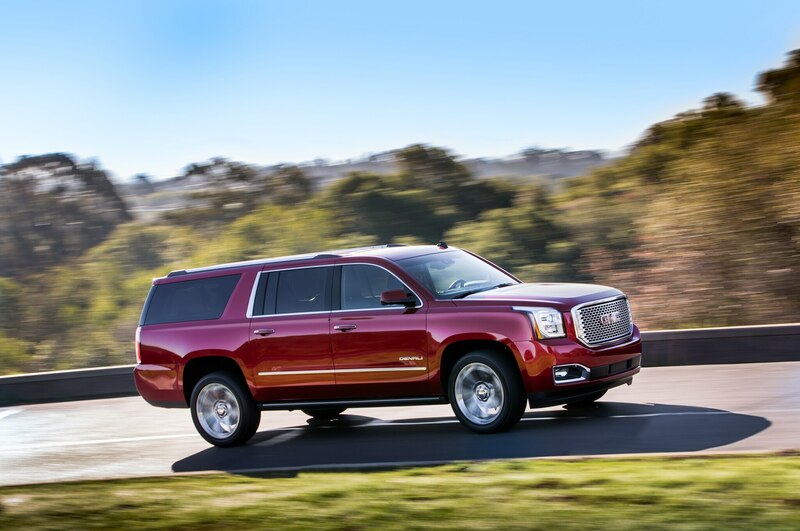 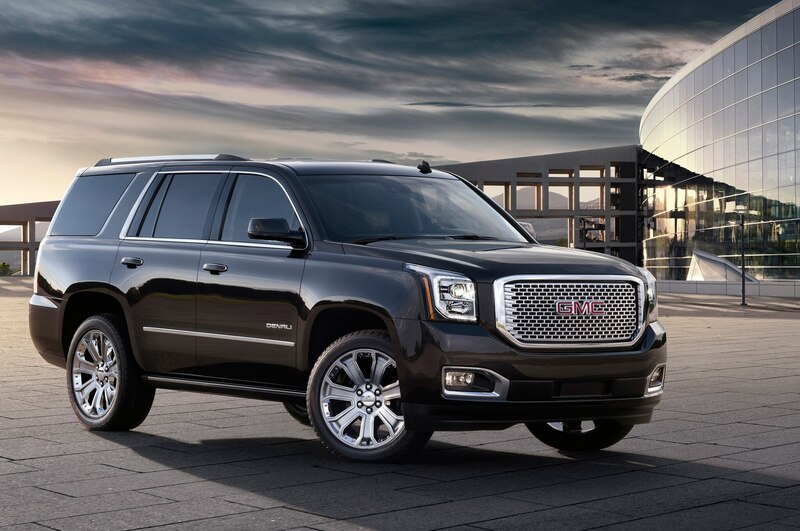 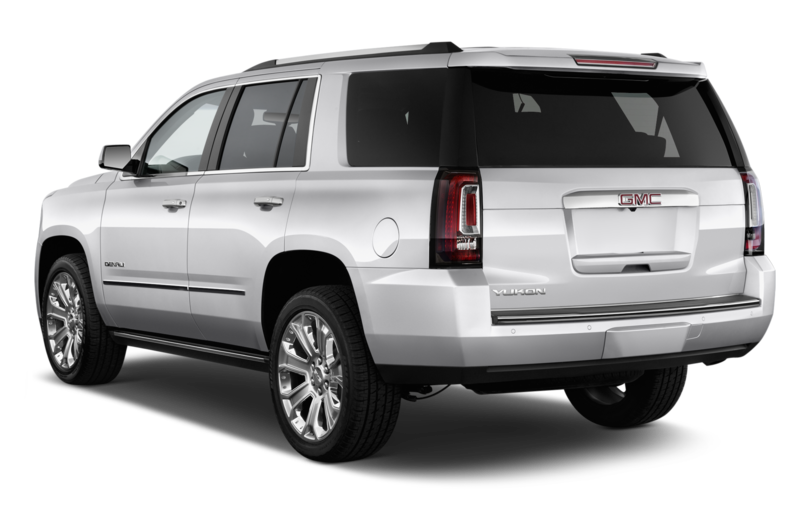 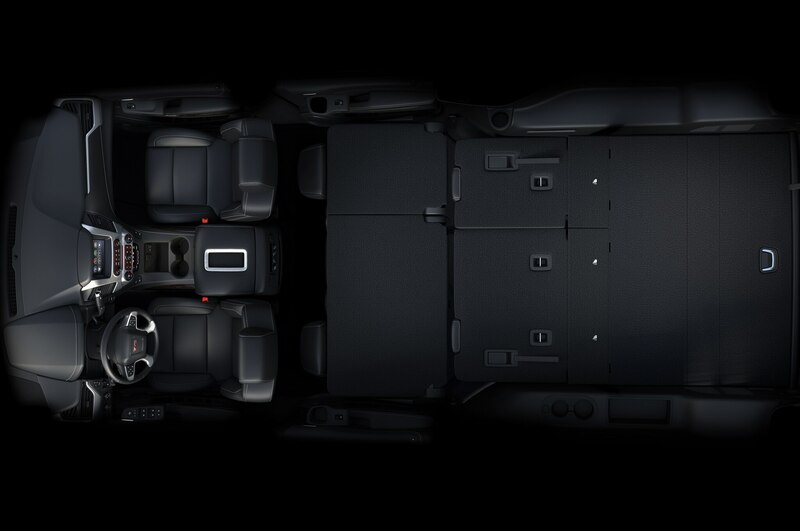 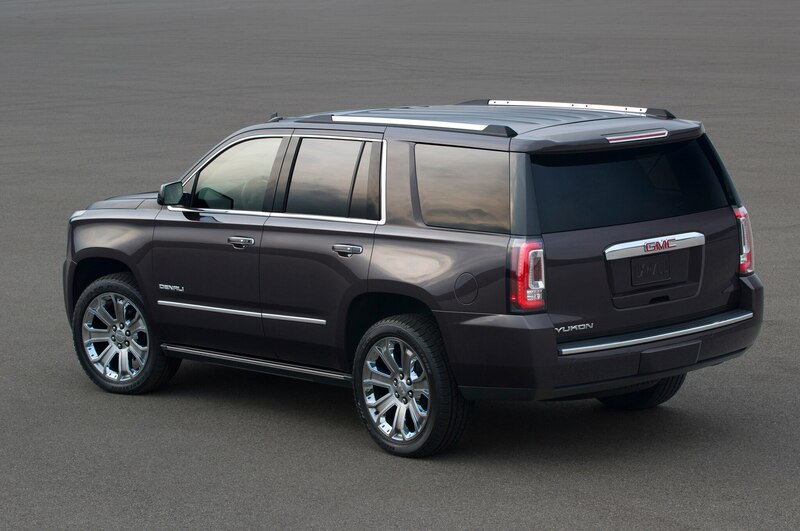 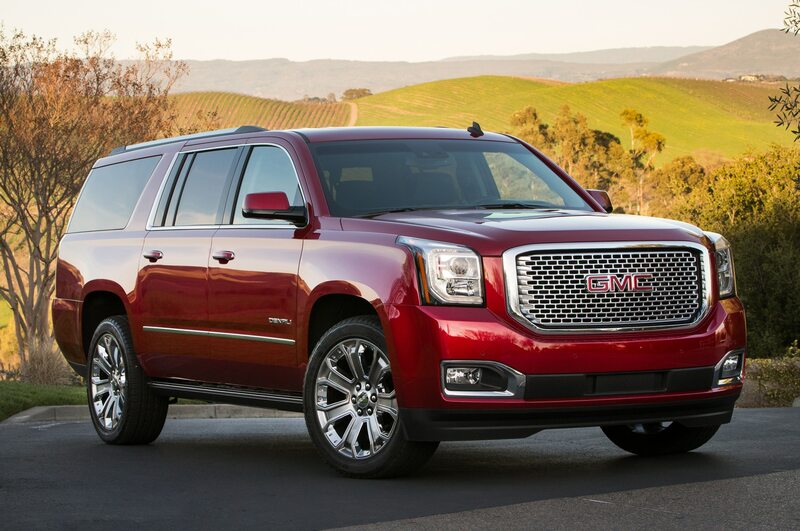 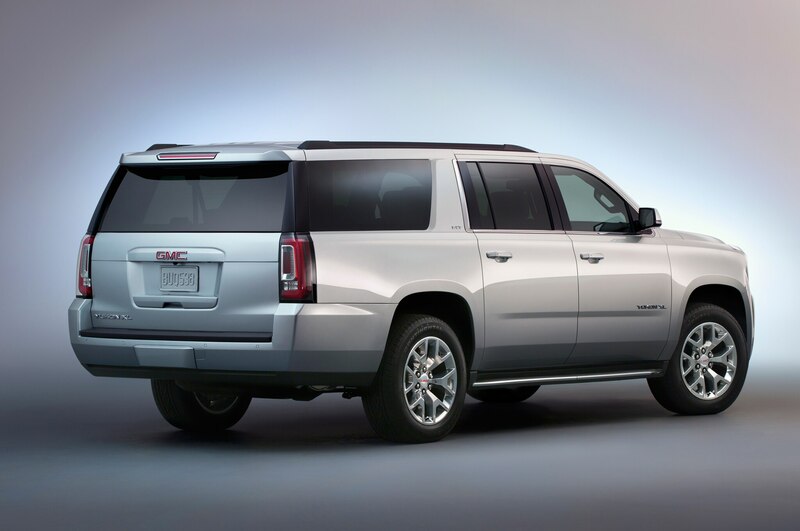 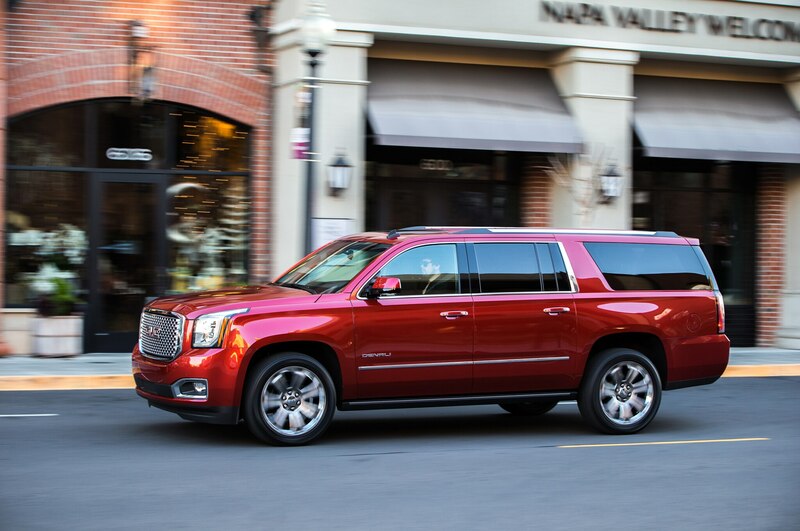 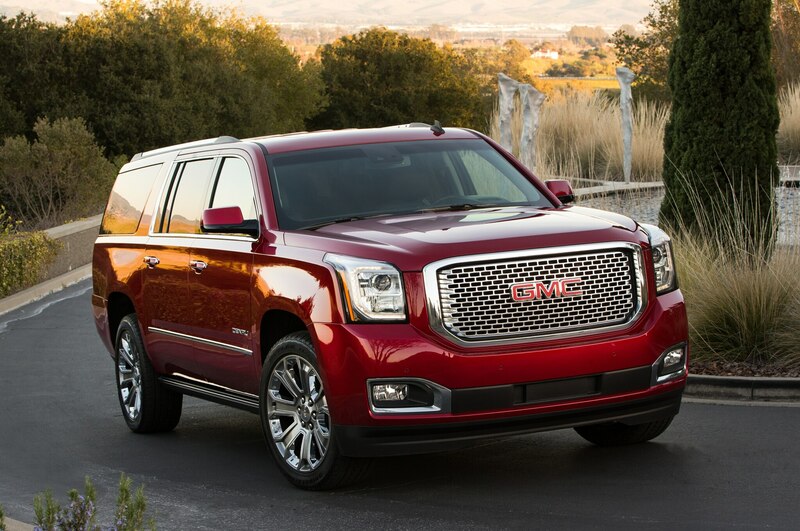 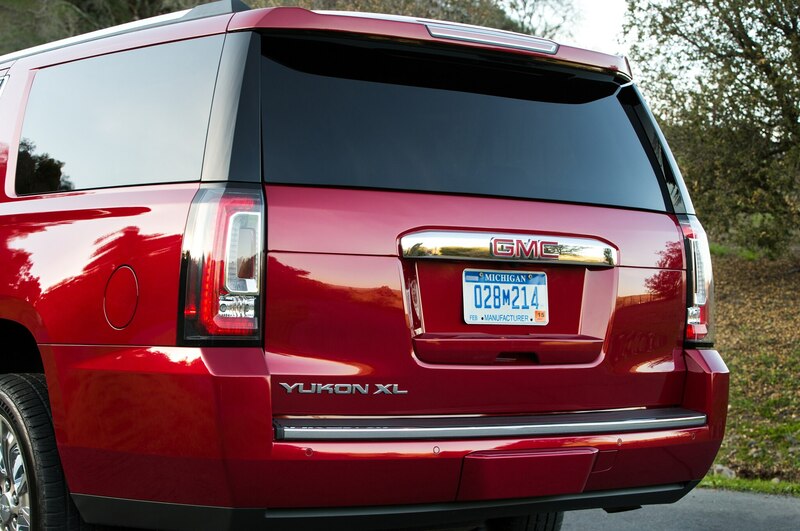 The Yukon XL, thanks to its 14-inch longer wheelbase, can fit even medium-sized adults in its third row. 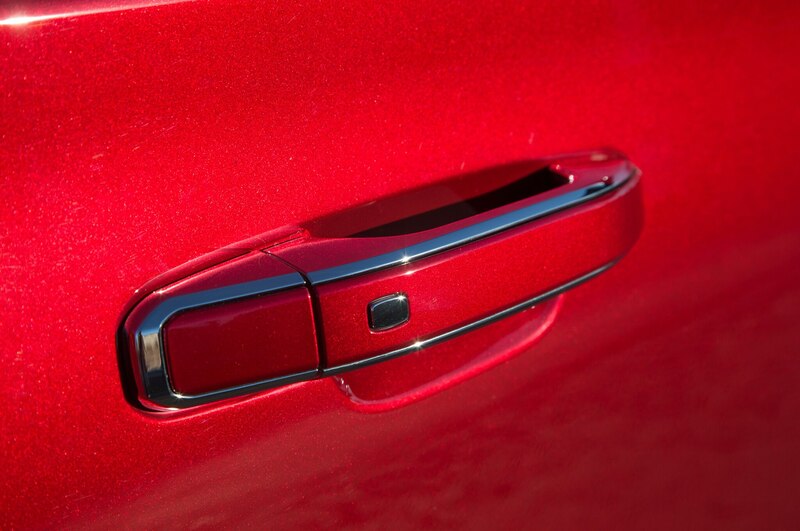 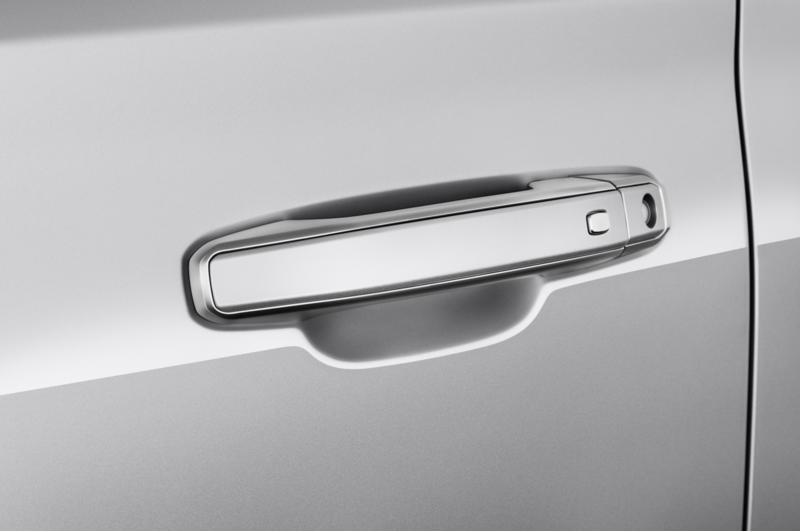 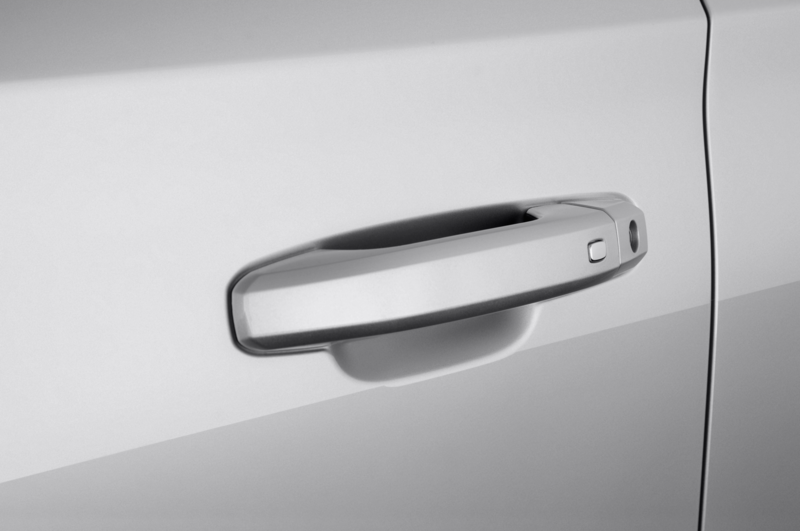 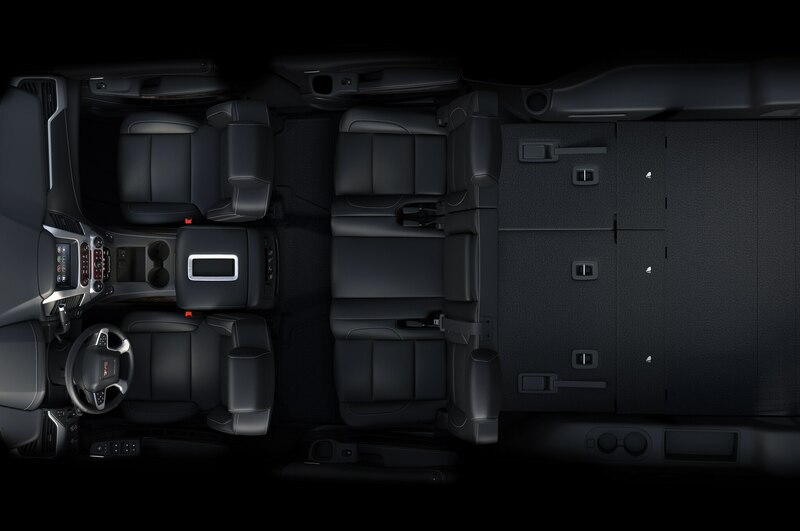 With either model, climbing into the back is slightly easier due to a larger rear door opening; there’s also an available pushbutton release that tumbles the second-row seat out of the way. 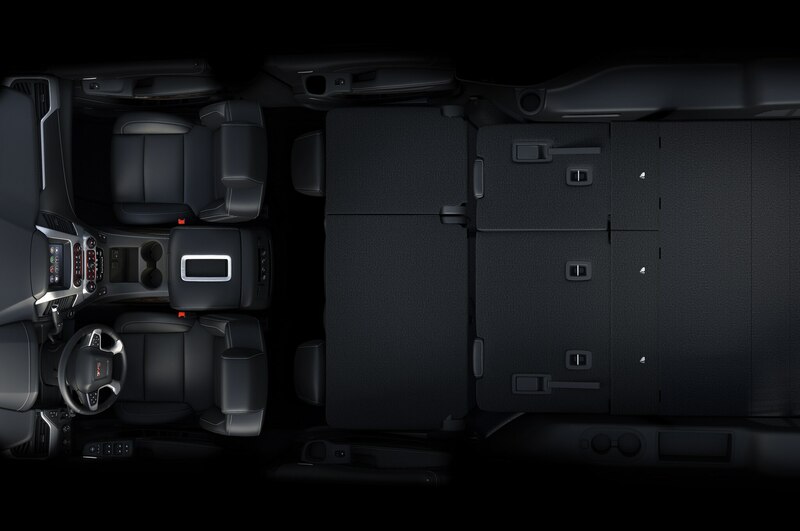 Power folding of the third- and second-row seats is a new feature, as the third row is no longer removable; instead, it folds flat to the cargo floor. 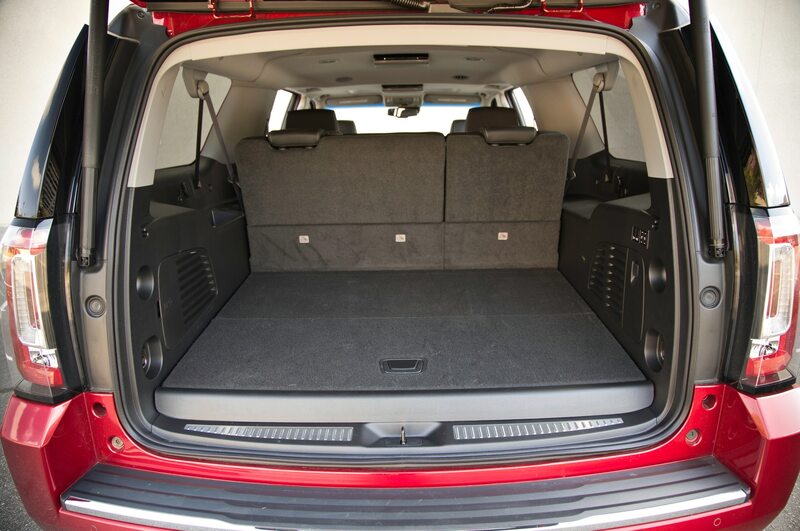 To make that possible, however, the cargo floor had to be raised by roughly six inches, resulting in somewhat diminished luggage capacity. For the Yukon XL, that hardly matters—there’s still 39 cubic feet of cargo space behind the third row, 76 cubic feet with the third seats folded, and a max volume of 121 cubic feet. 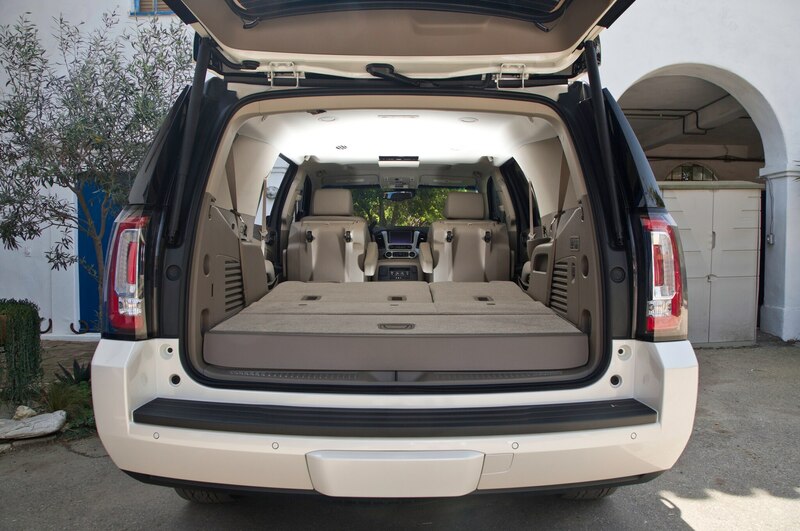 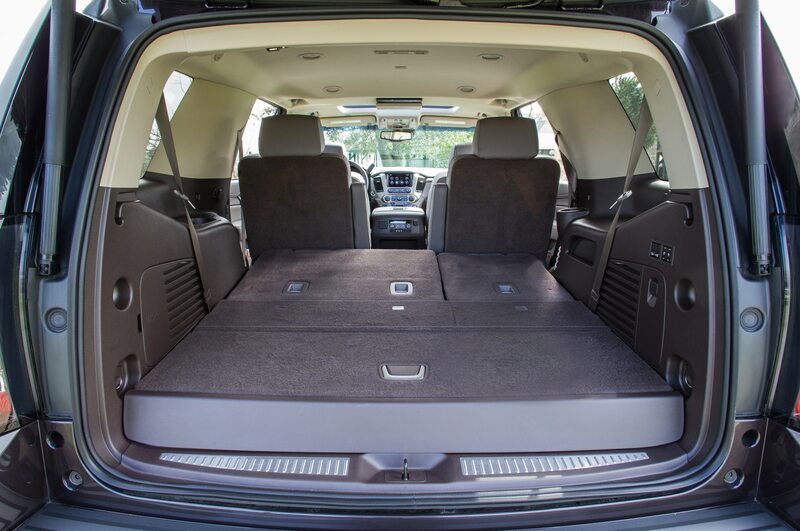 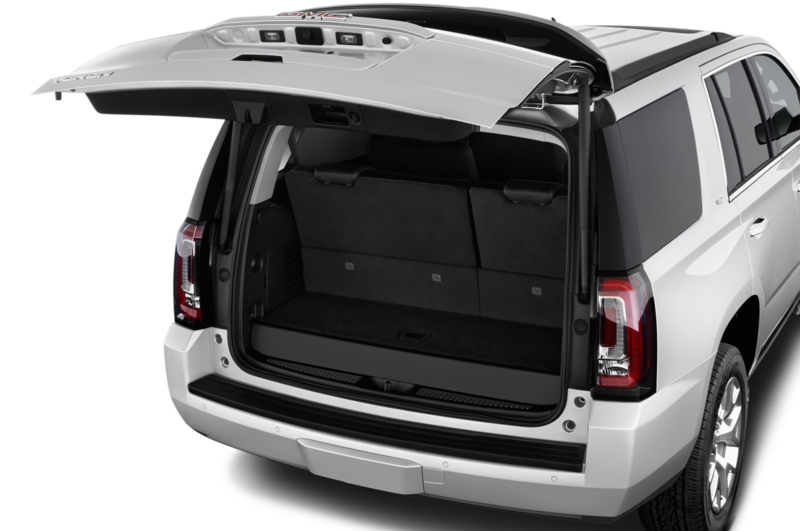 The smaller Yukon, though, now offers only 15 cubic feet with all seats in place; behind the second row there’s a generous 51 cubic feet, and 94 cubic feet with all seats folded. 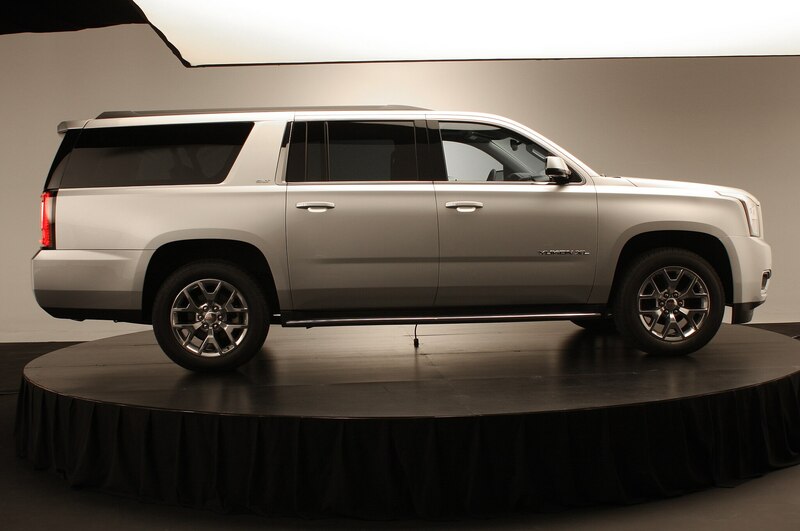 Despite their role as beasts of burden that carry cargo, tow trailers, and schlep kids, the Yukon, Yukon XL, and particularly the Denalis are now trimmed and equipped more like luxury vehicles. 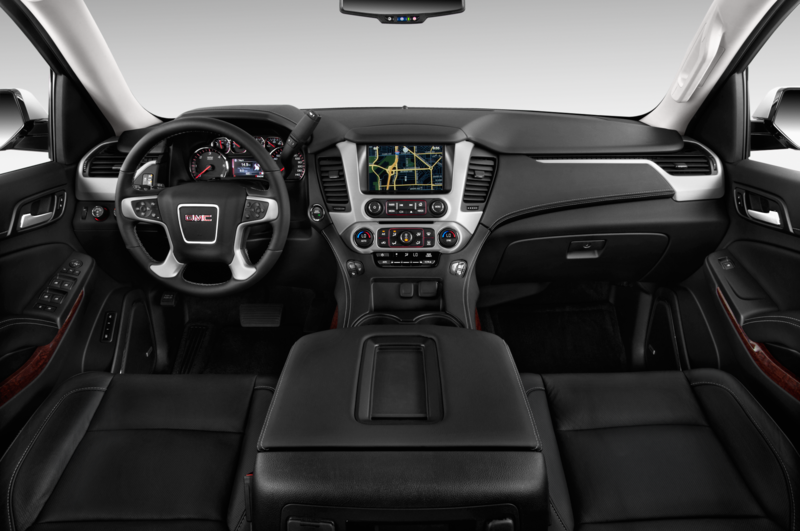 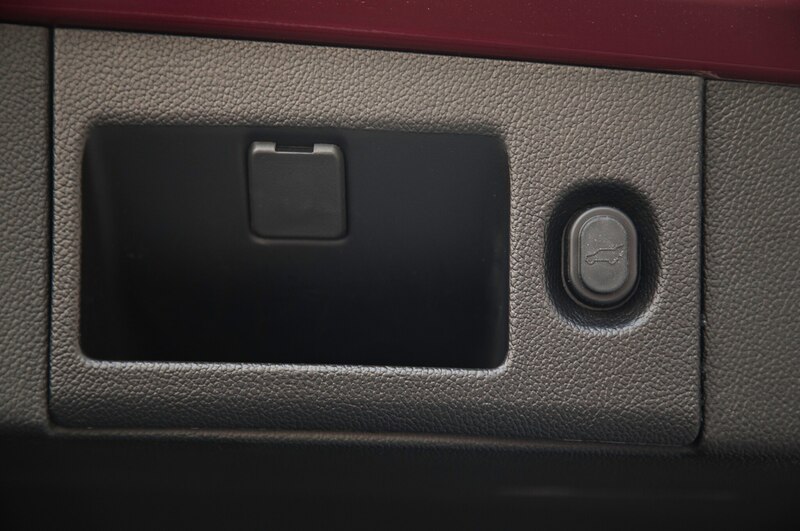 Additional new features include: keyless ignition, adaptive cruise control, lane-departure warning, audible park assist for both front and rear, and a second video screen in XL models. At the same time, they’re also priced more like luxury vehicles. 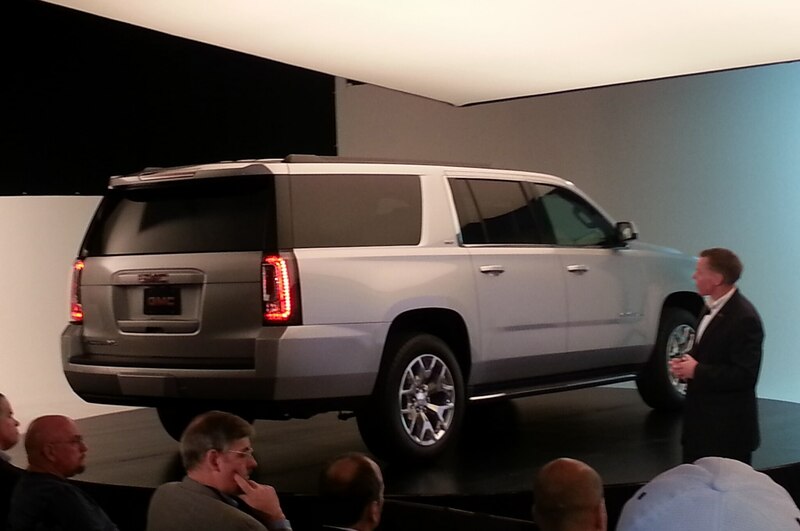 Base sticker prices are up by $3000 to $4000, and the bottom-line number for a Denali is likely to start with a 7. 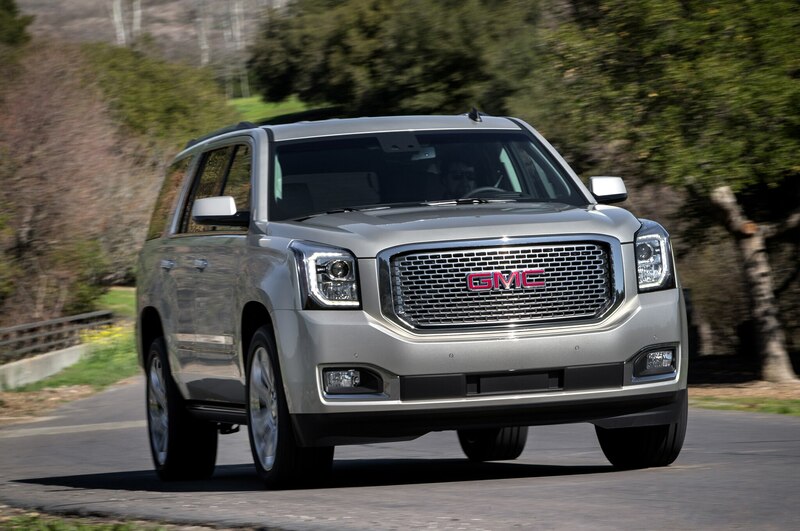 Even so, GMC says the Denali versions of these trucks — both the Yukon and the Yukon XL — are more popular than the base SLE and mid-level SLT combined, accounting for 60 percent of total Yukon sales. 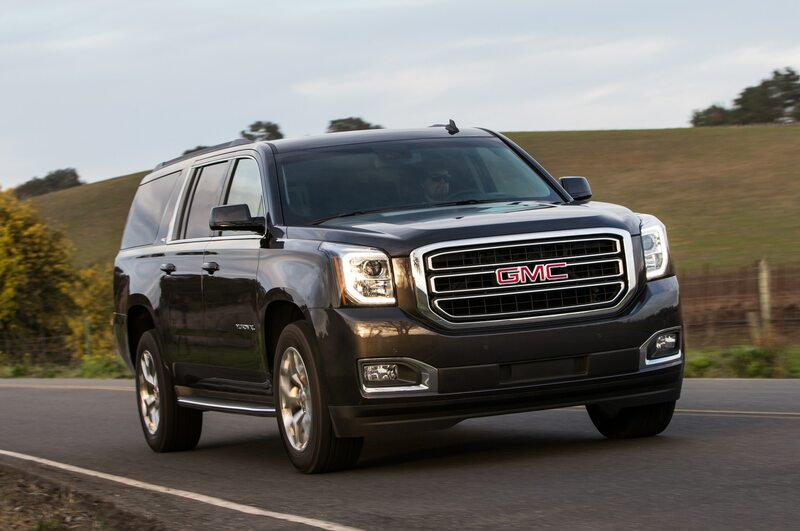 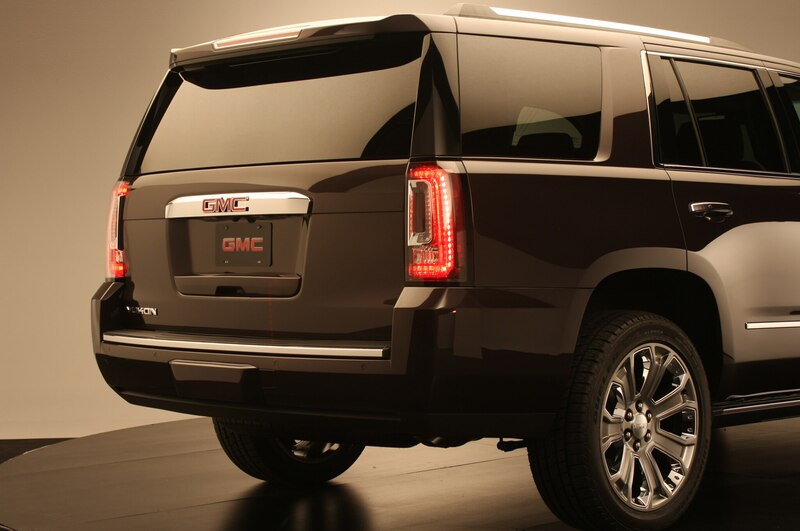 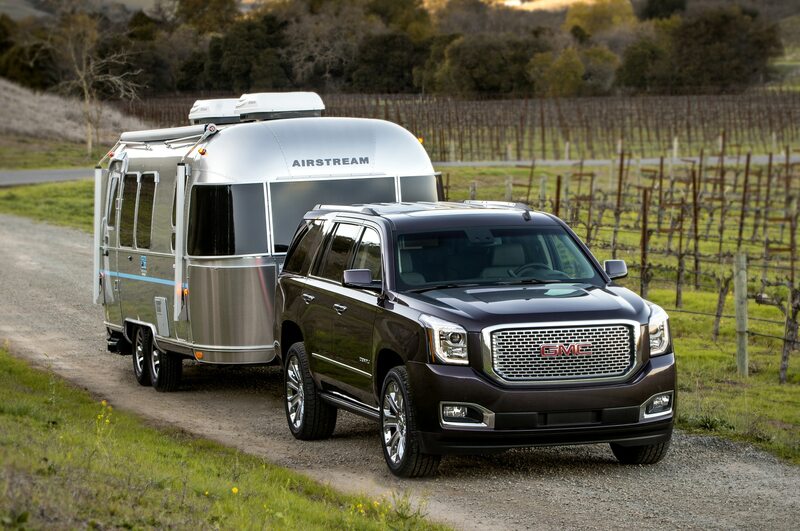 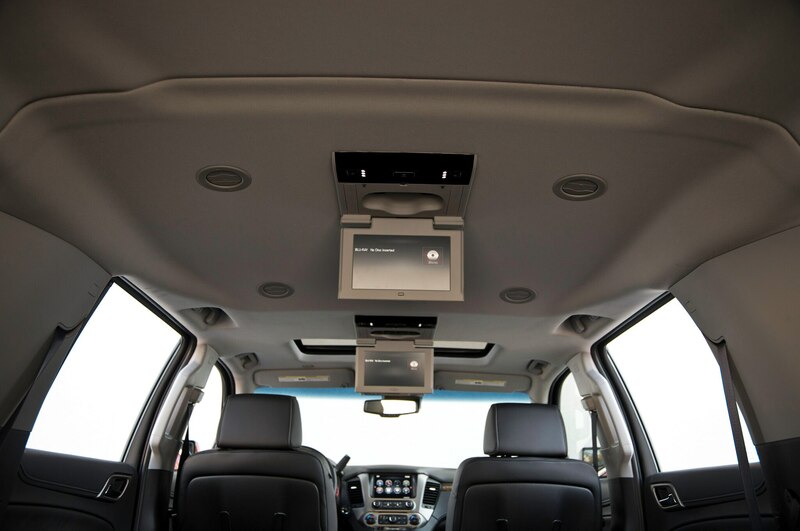 Living large isn’t cheap, but at least the upgrades to the 2015 GMC Yukon and Yukon XL make them more convincing as luxury vehicles. 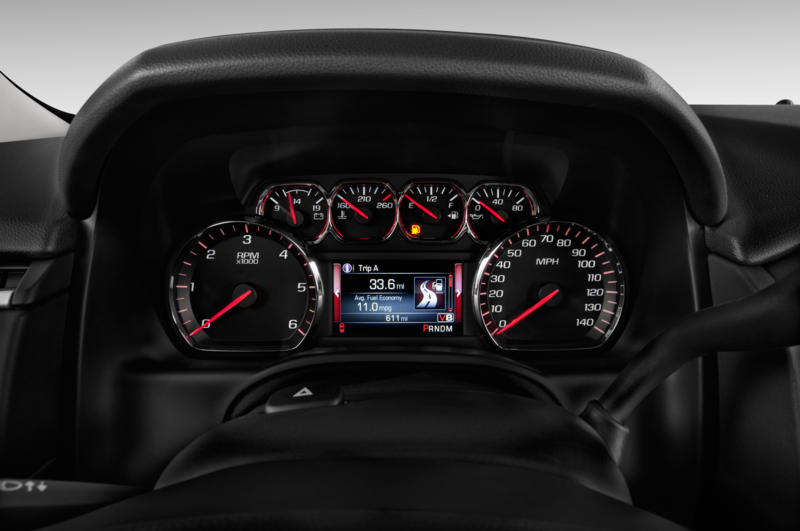 More cogs, better fuel economy.